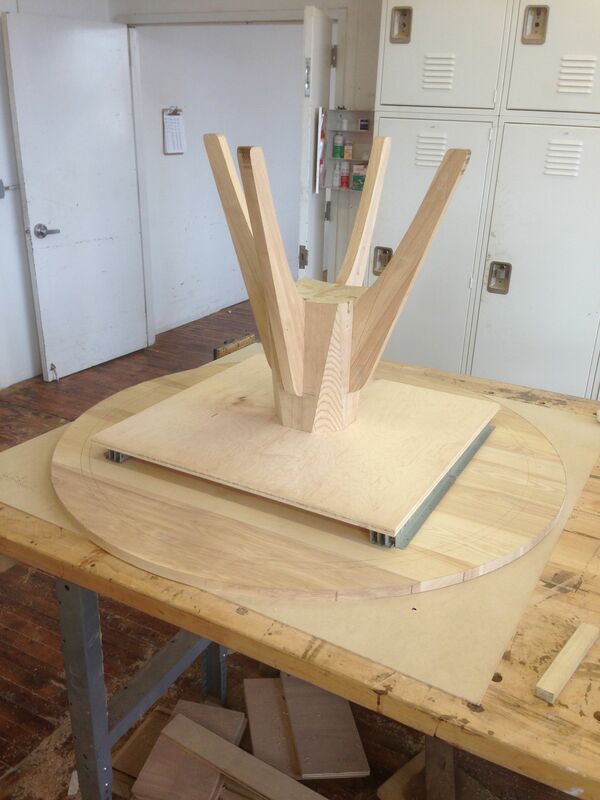 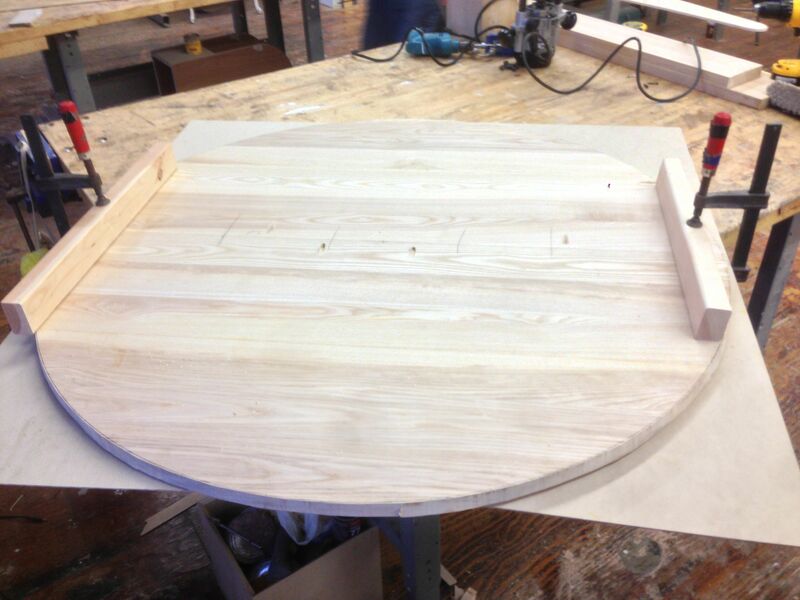 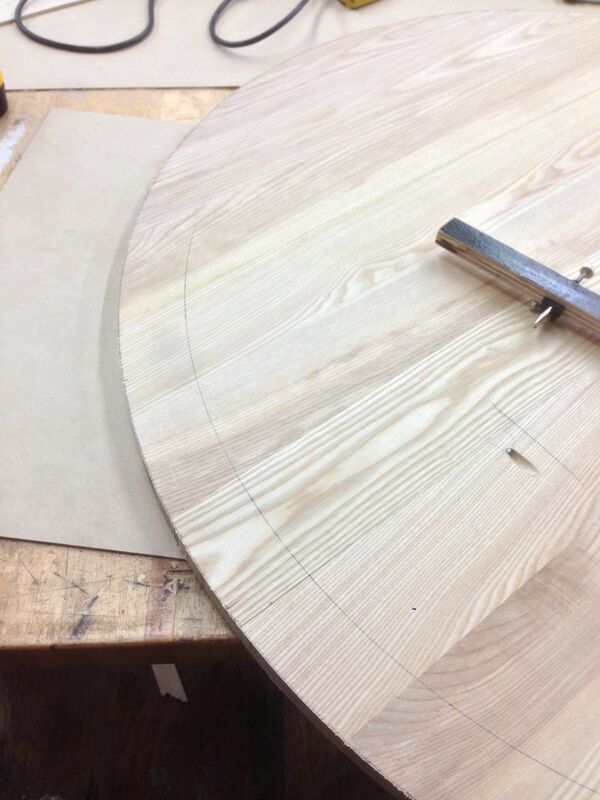 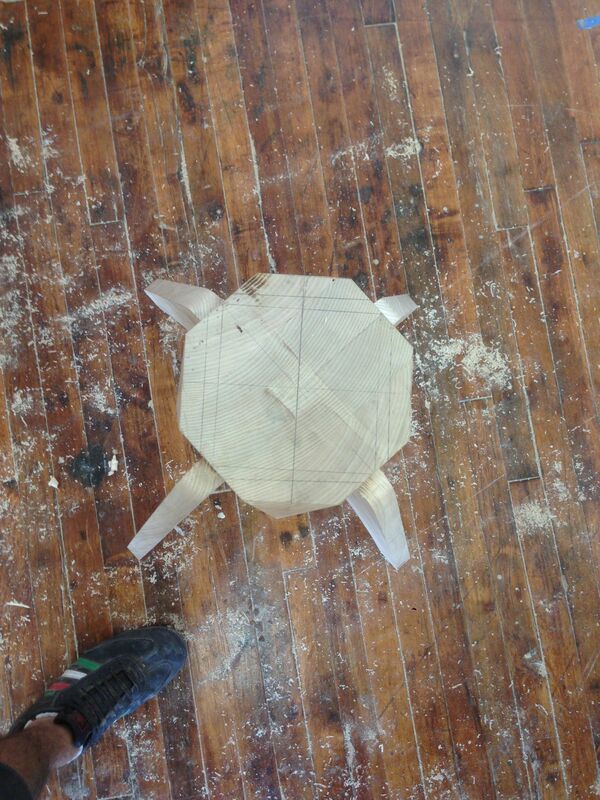 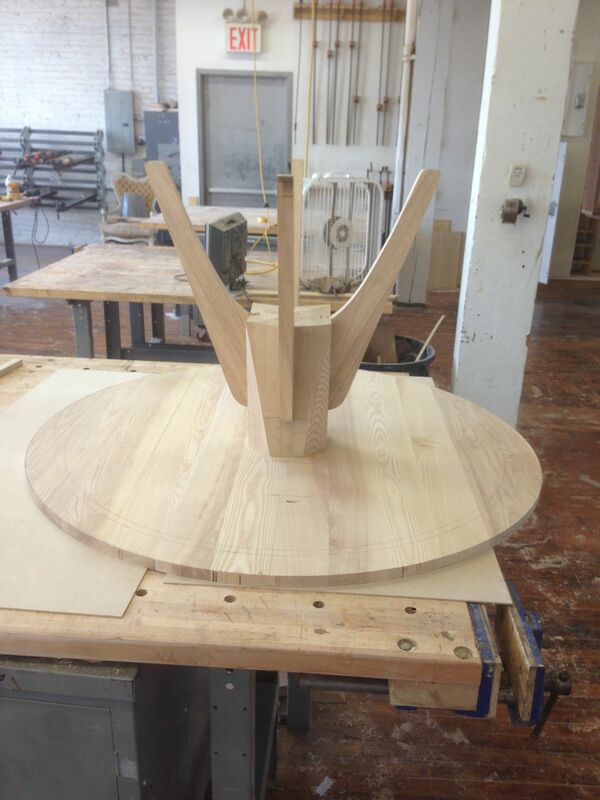 This first update details the initial full-scale drawings through the cutting of the legs and pedestal as well as creating the circular 48″ diameter top. 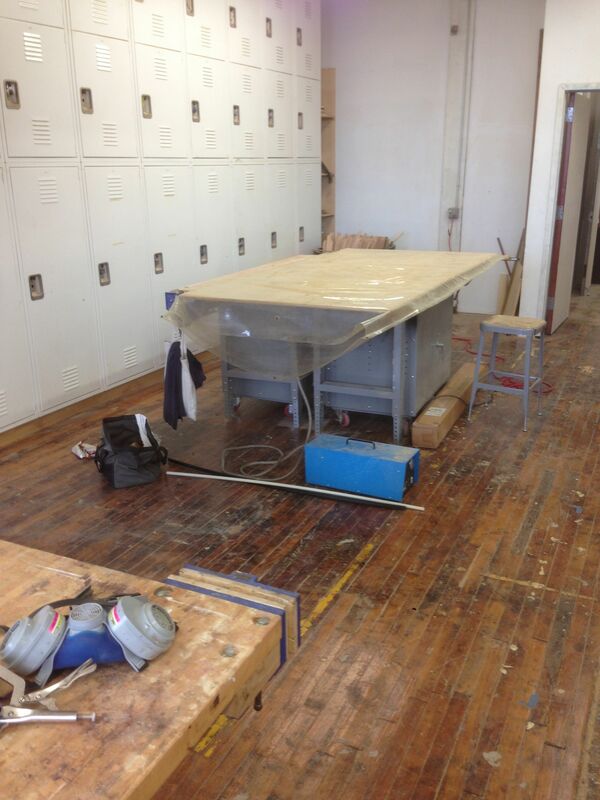 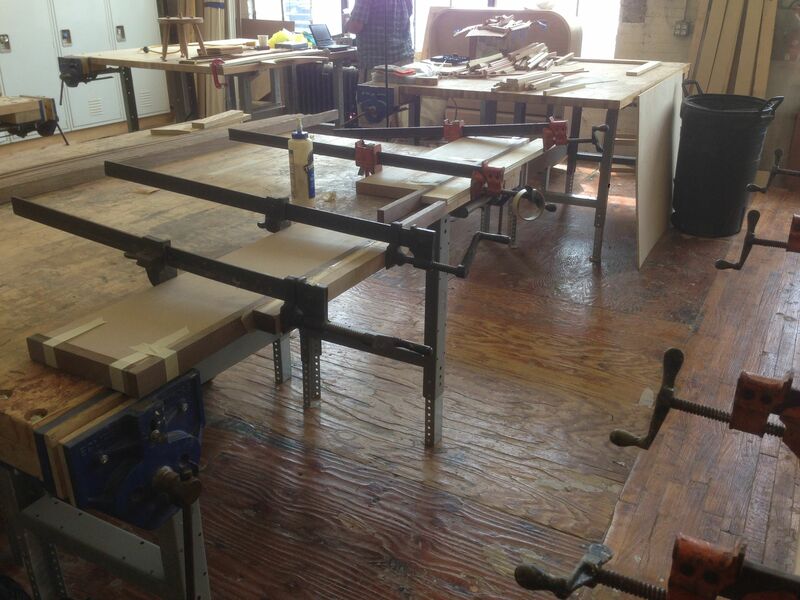 There is still much to be done, but the clients will be enjoying family meals around this table shortly. 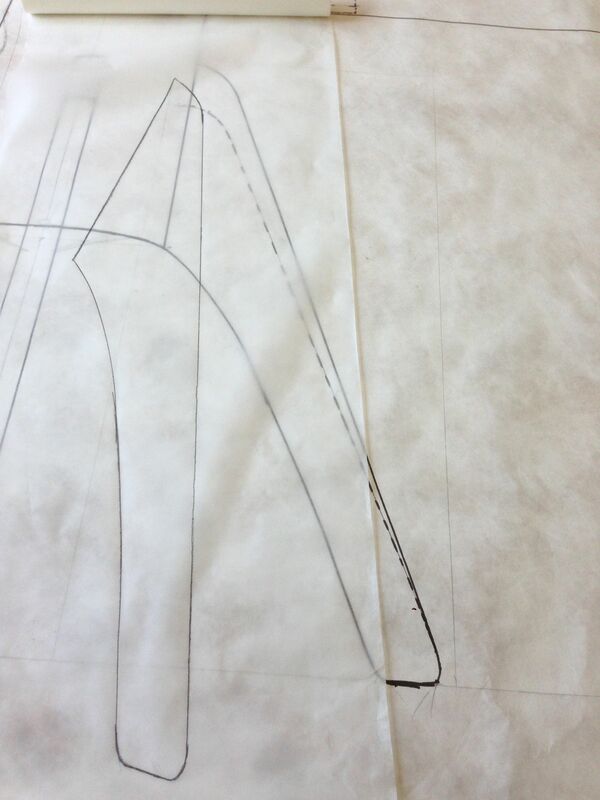 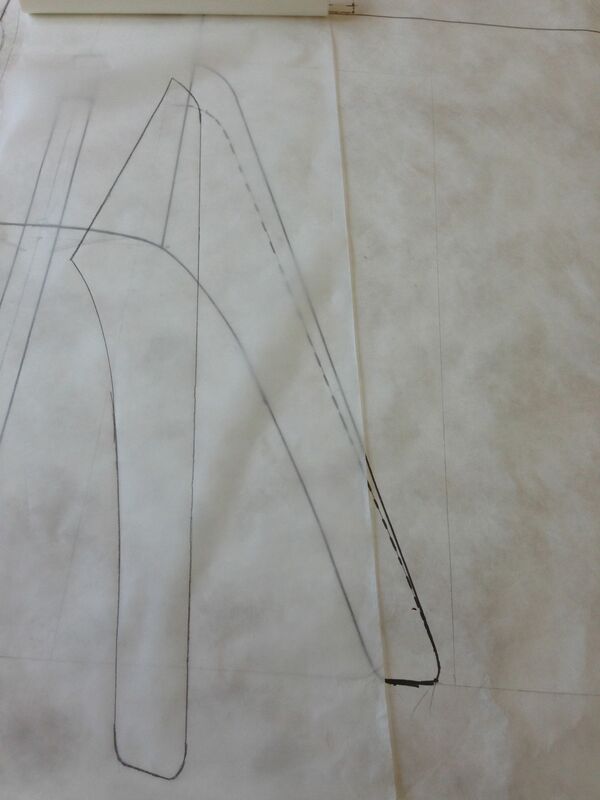 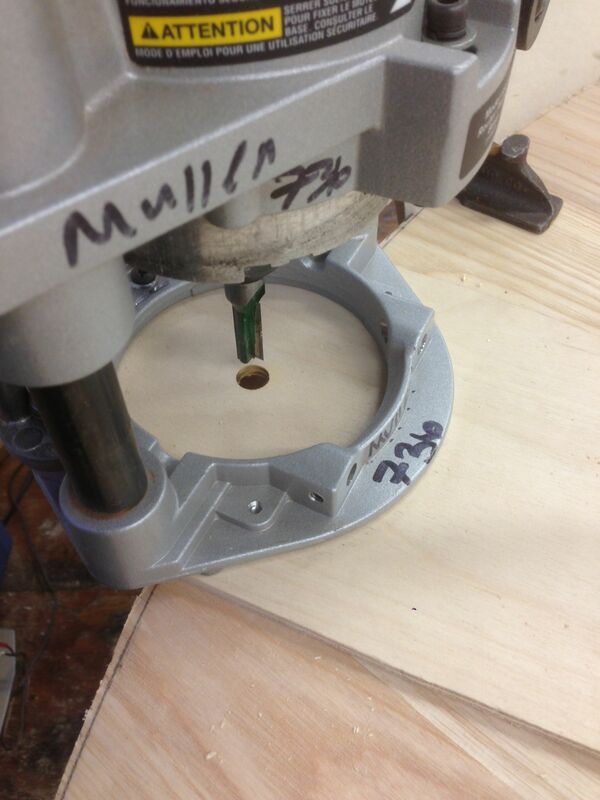 This entry was posted in Recent Work, Updates on September 13, 2013 by Matthew Mullen. 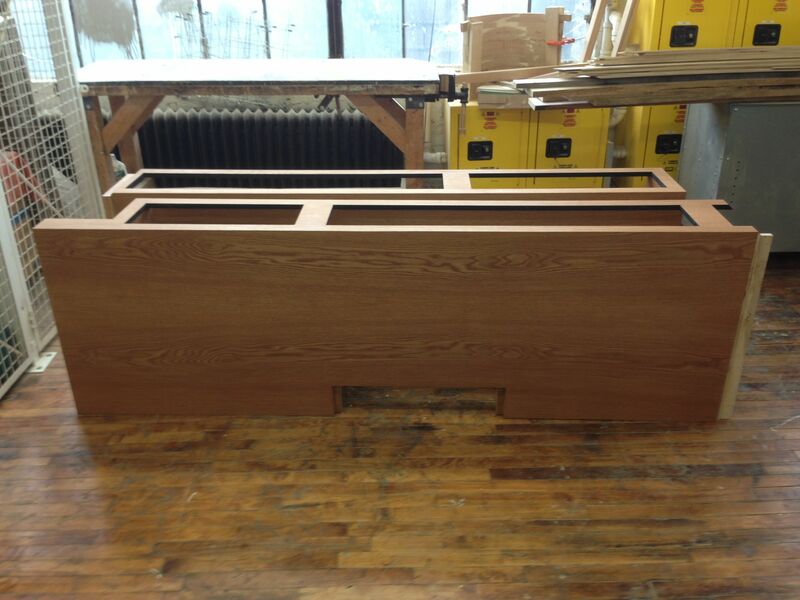 This massive shelving unit will end up in a Wall Street apartment. 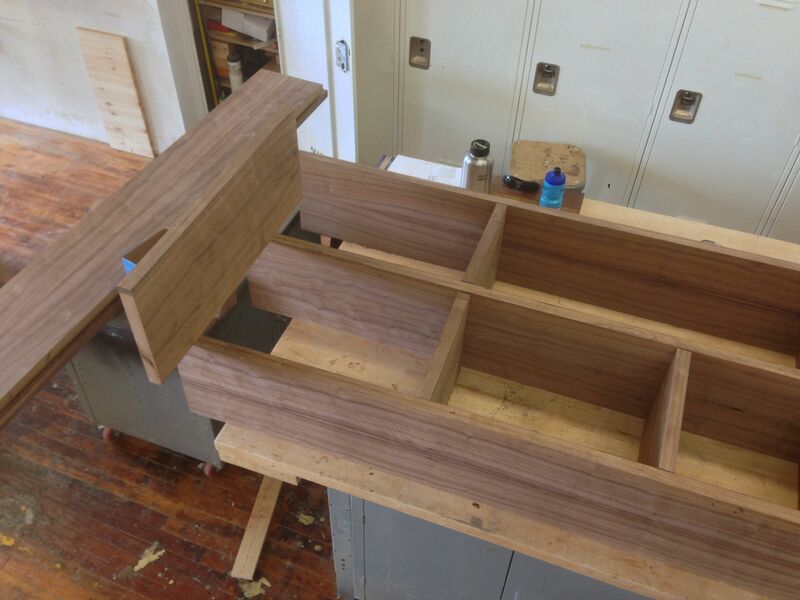 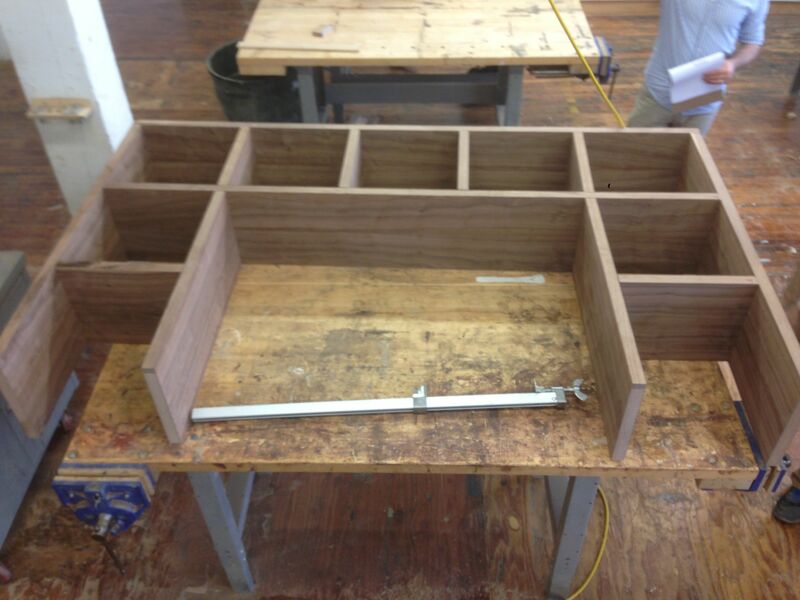 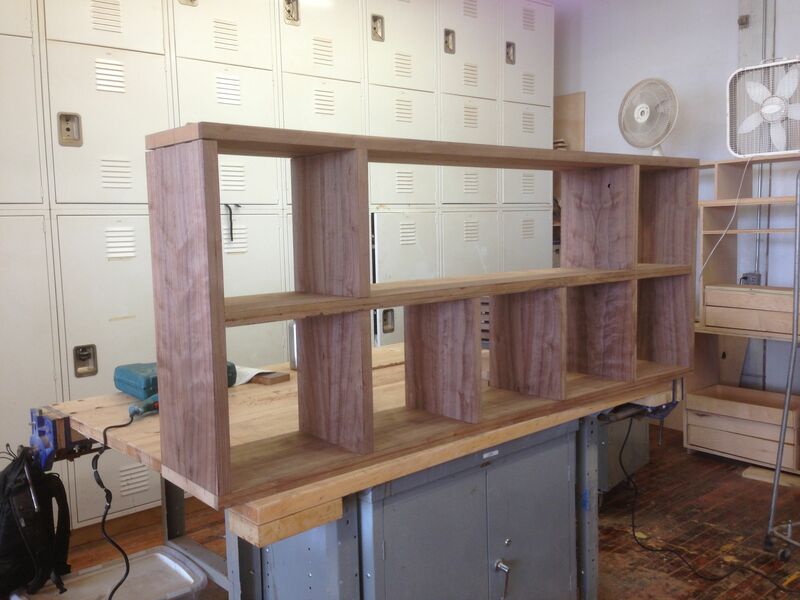 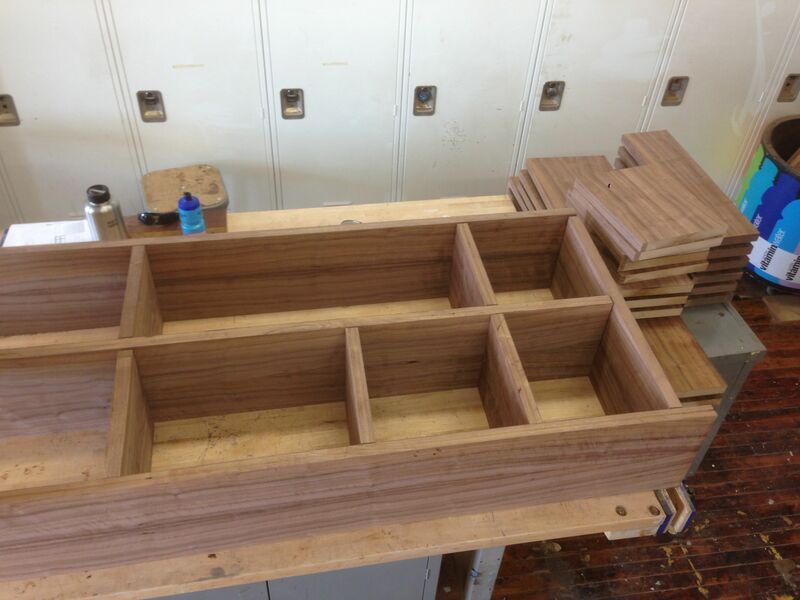 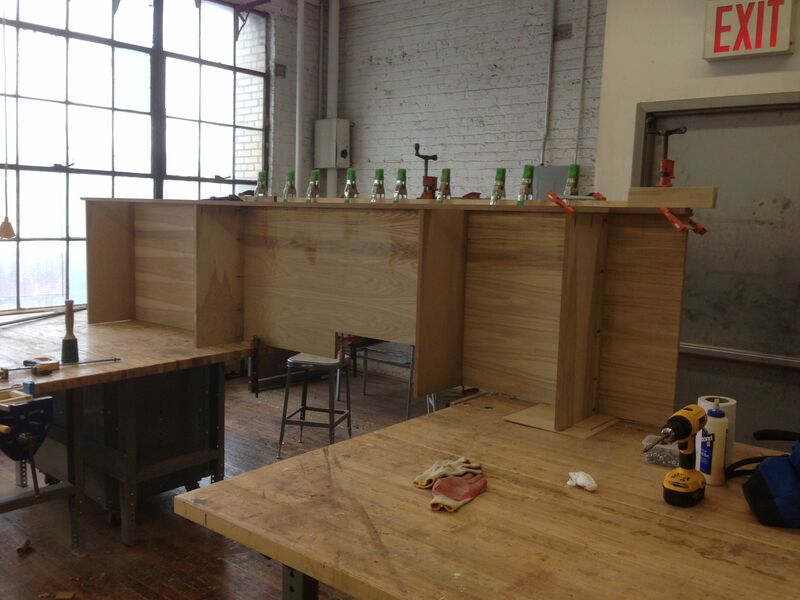 It consists of a square shelving unit that will house a TV and components, faux wall column cover and 6 floating shelves. 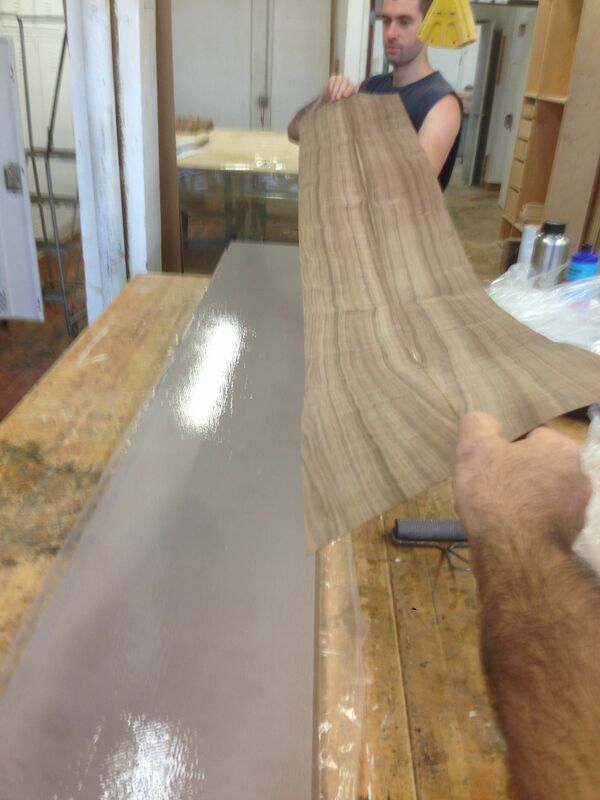 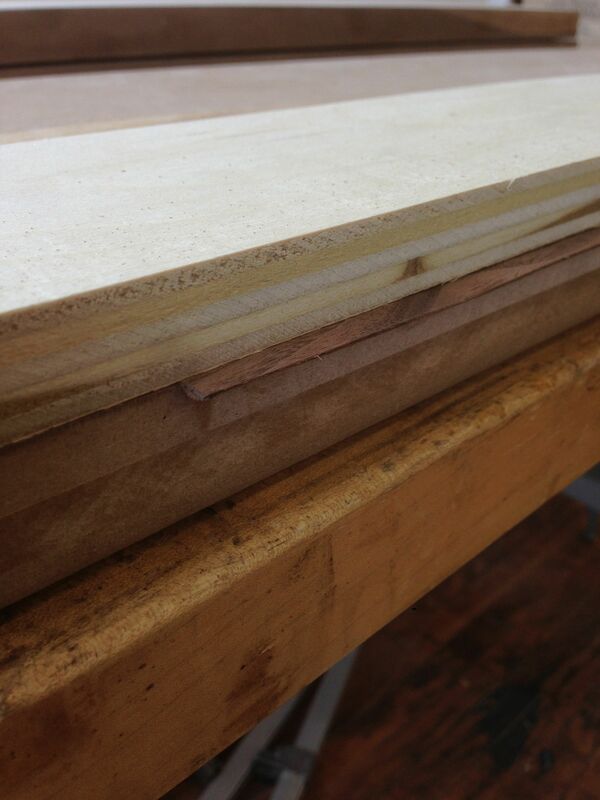 It has been a while since I last used veneer and a vacuum bag and it was just as fun as I remembered. 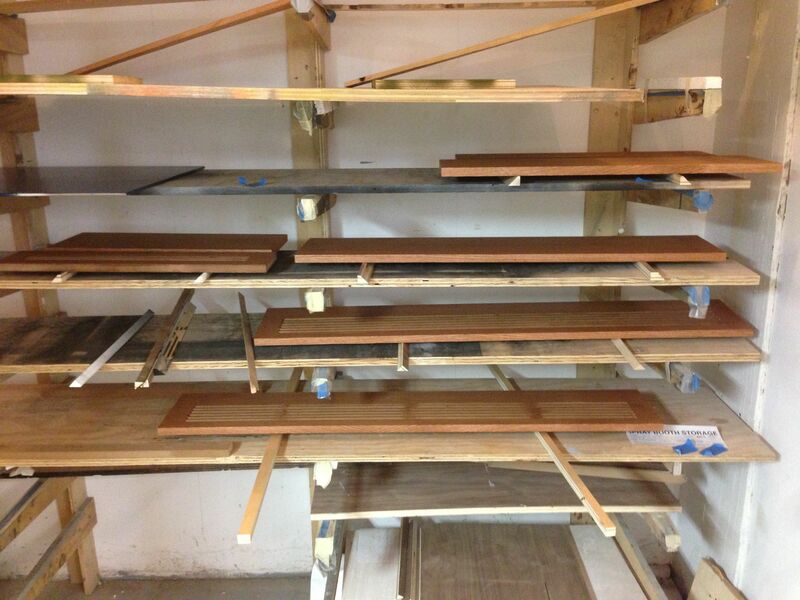 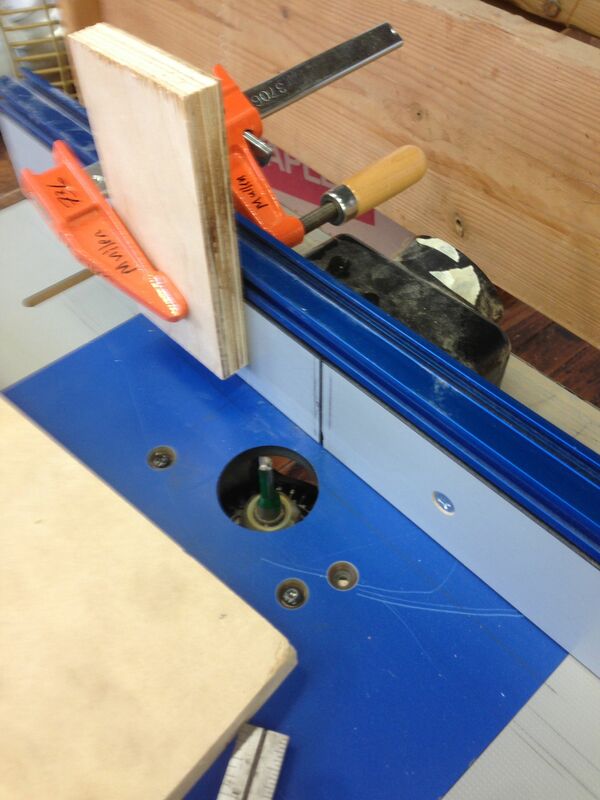 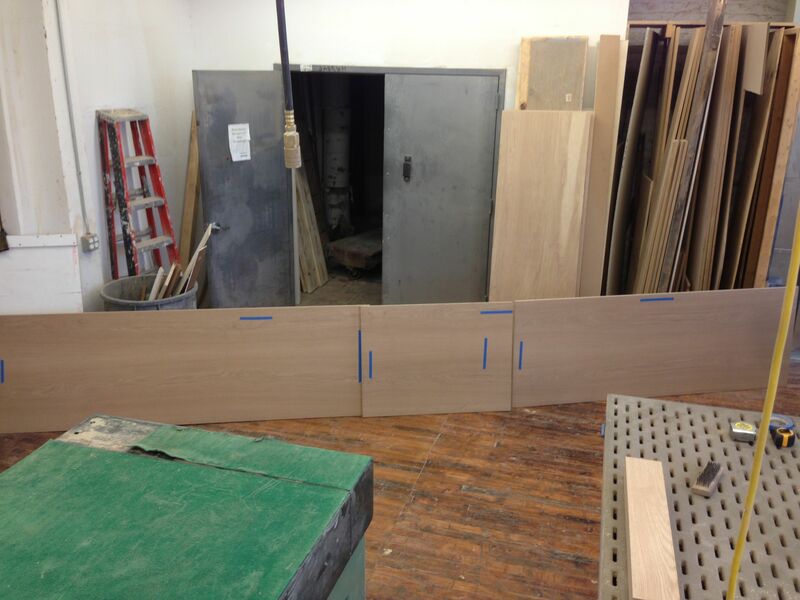 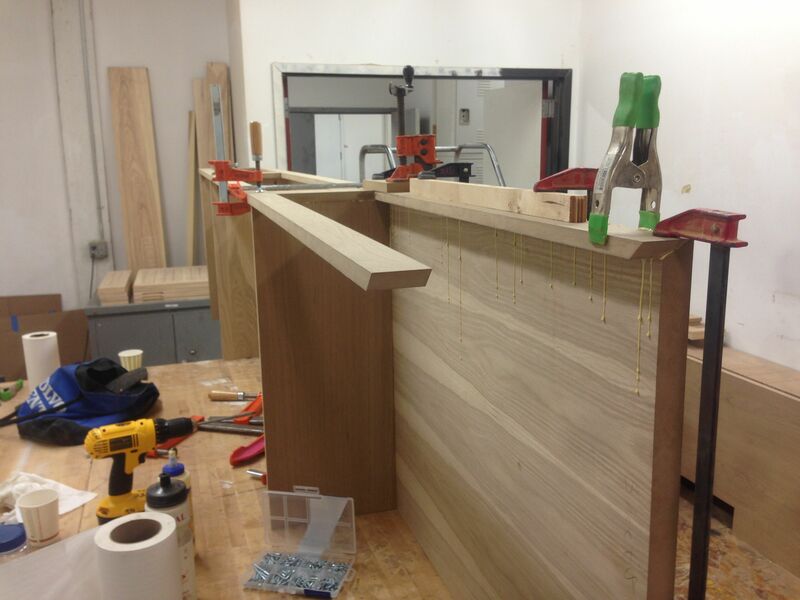 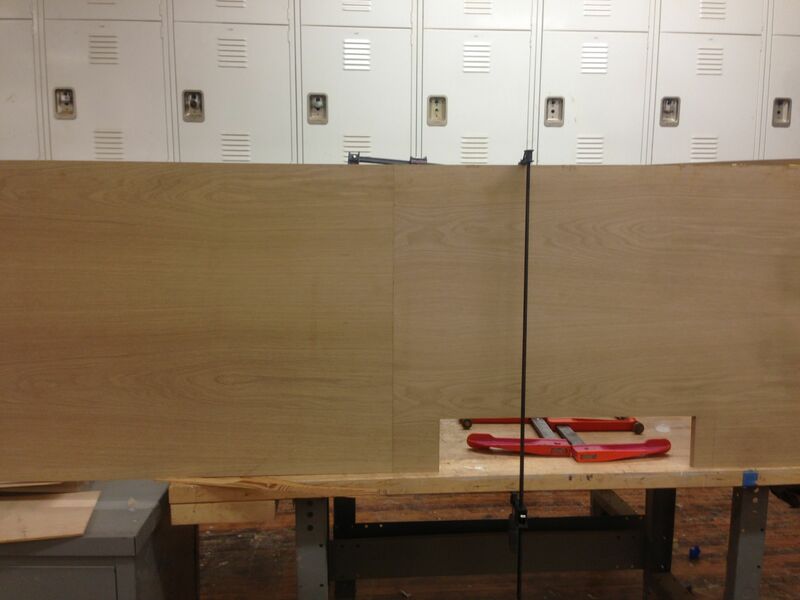 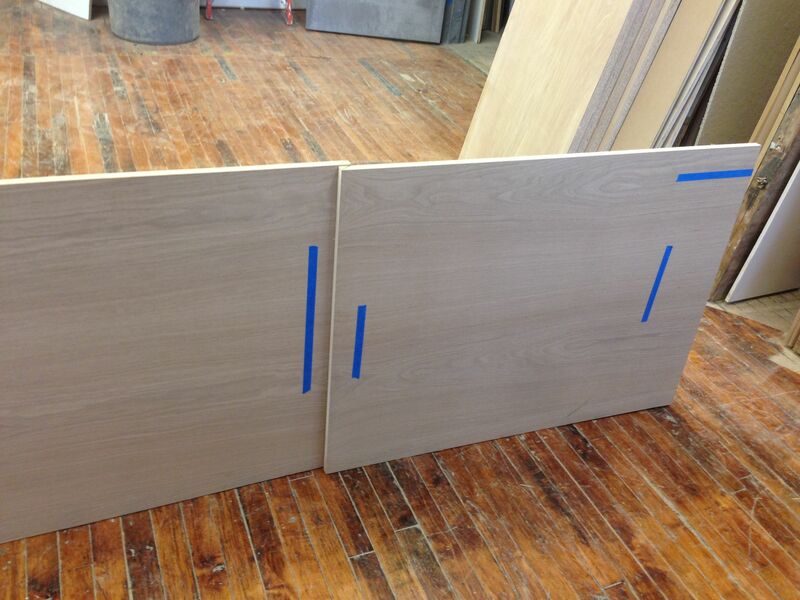 Hardware to affix to the wall is in the works while the glass for the three doors is being fabricated. 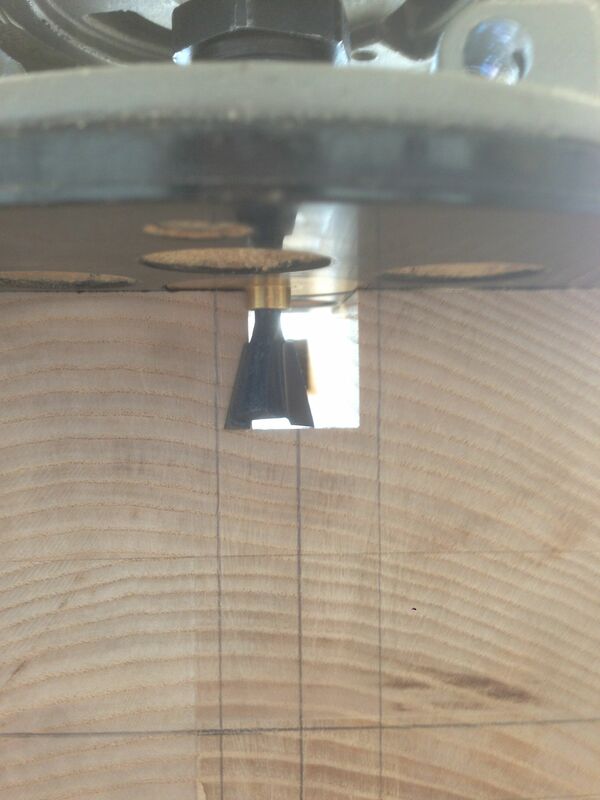 Shouldn’t be long now. 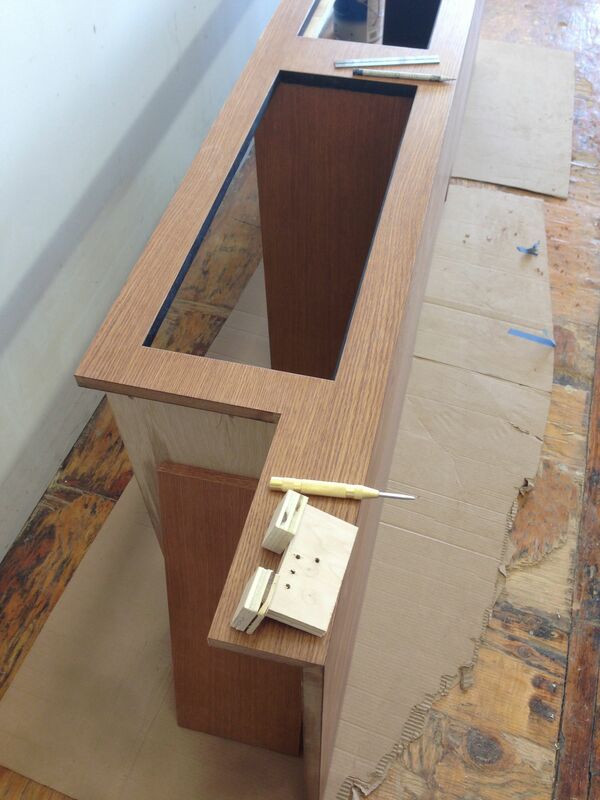 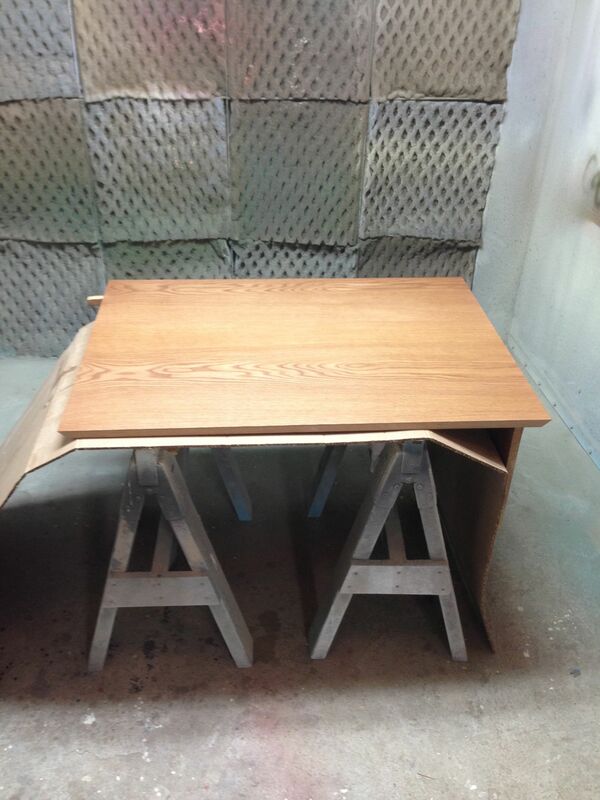 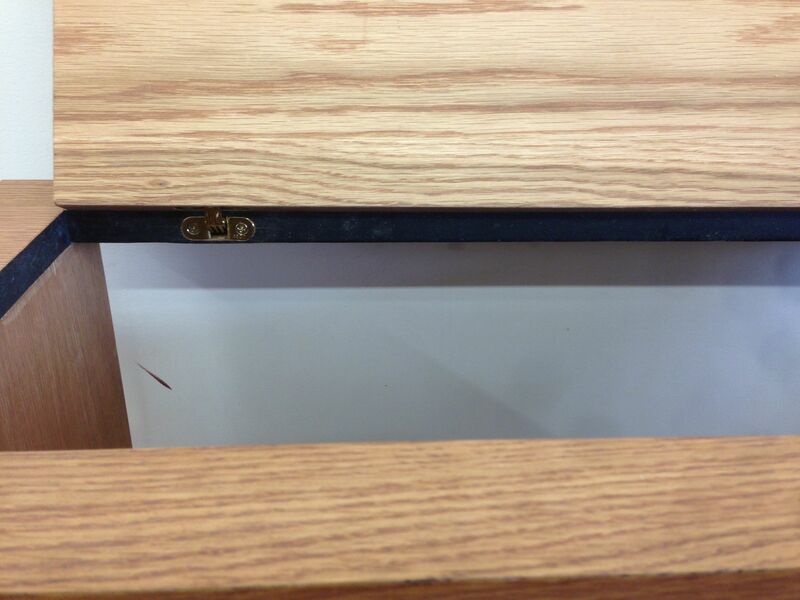 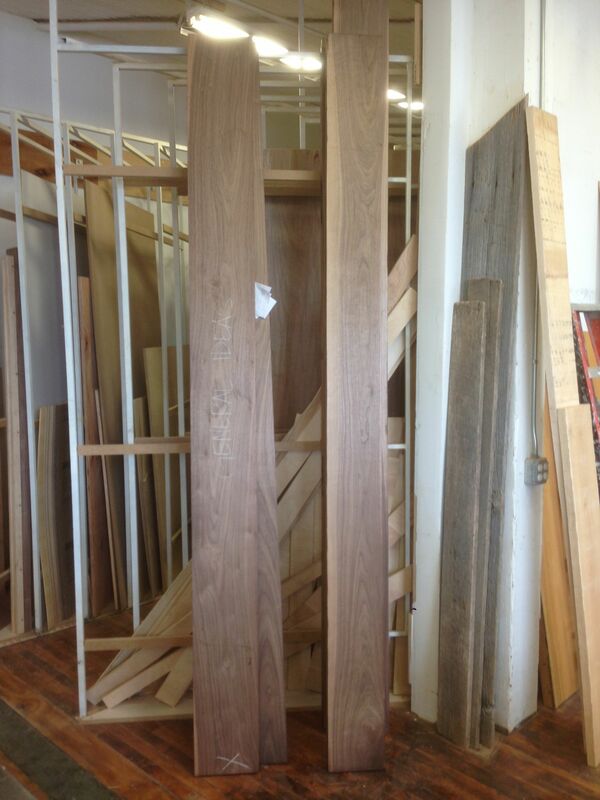 This entry was posted in Built-ins, Updates on September 10, 2013 by Matthew Mullen. 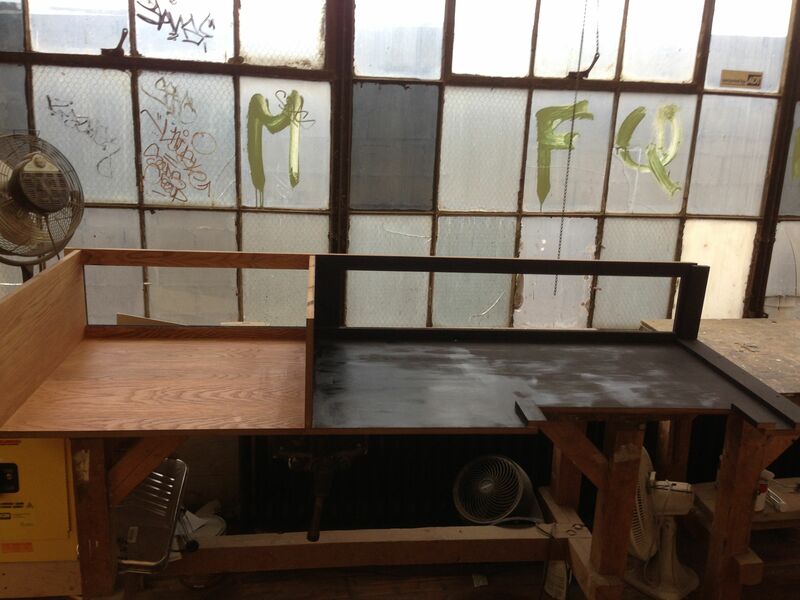 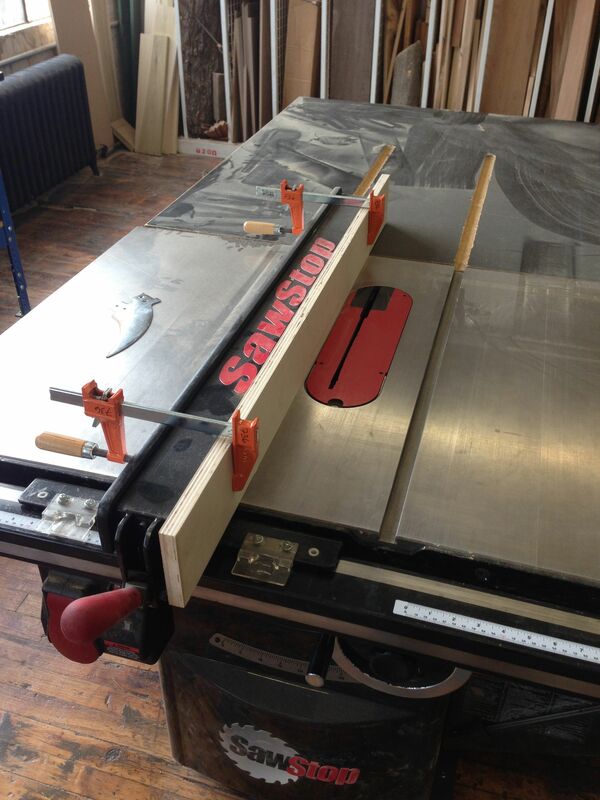 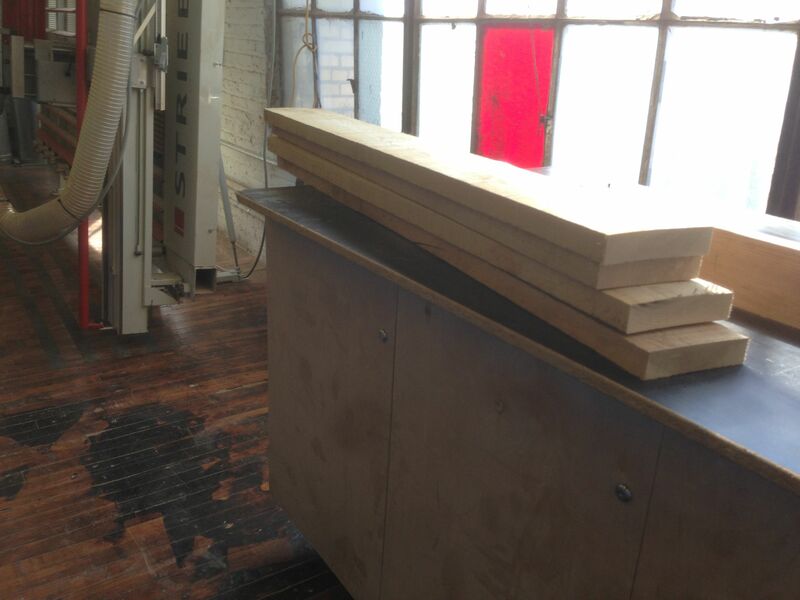 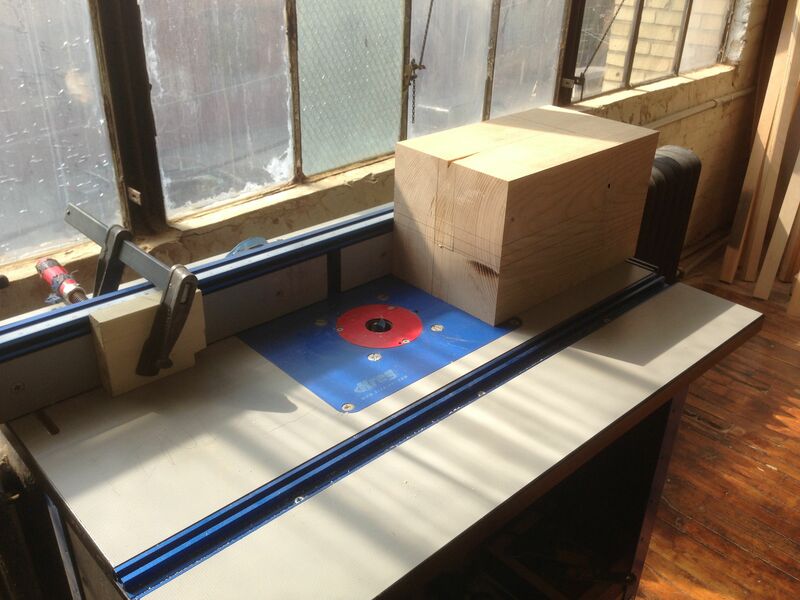 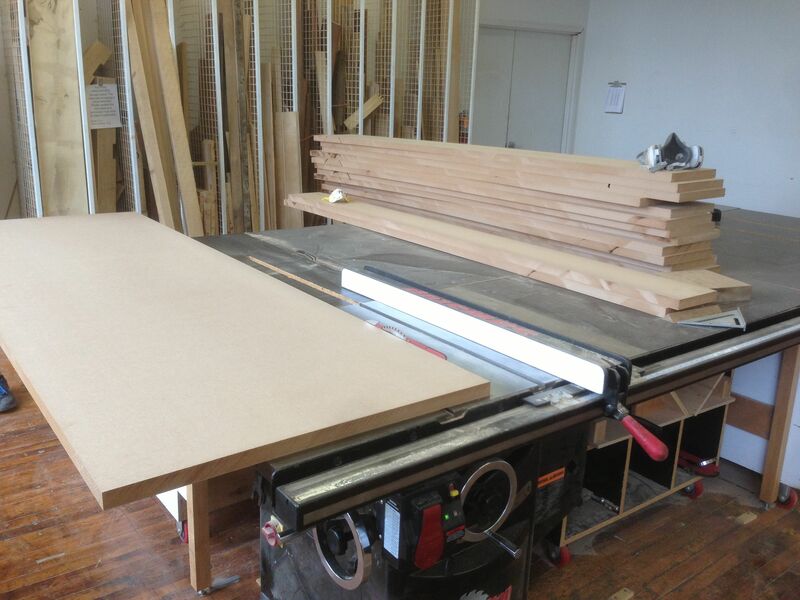 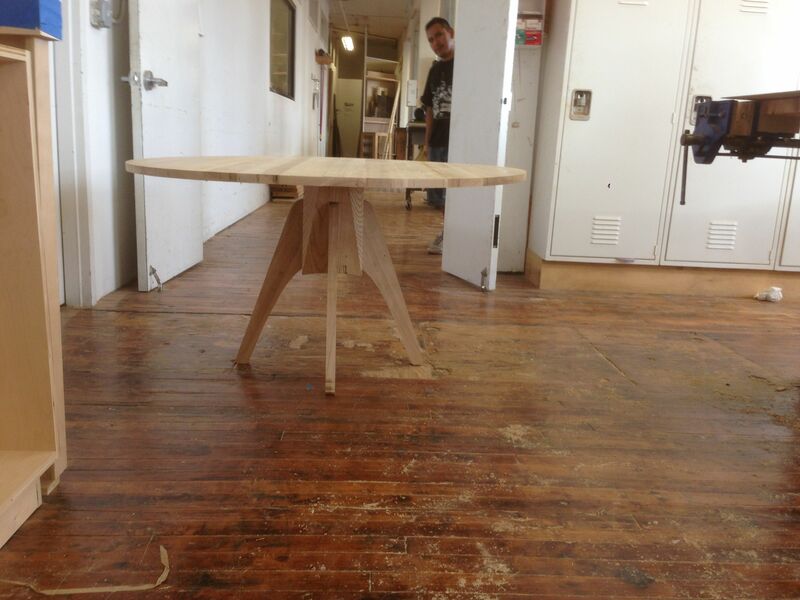 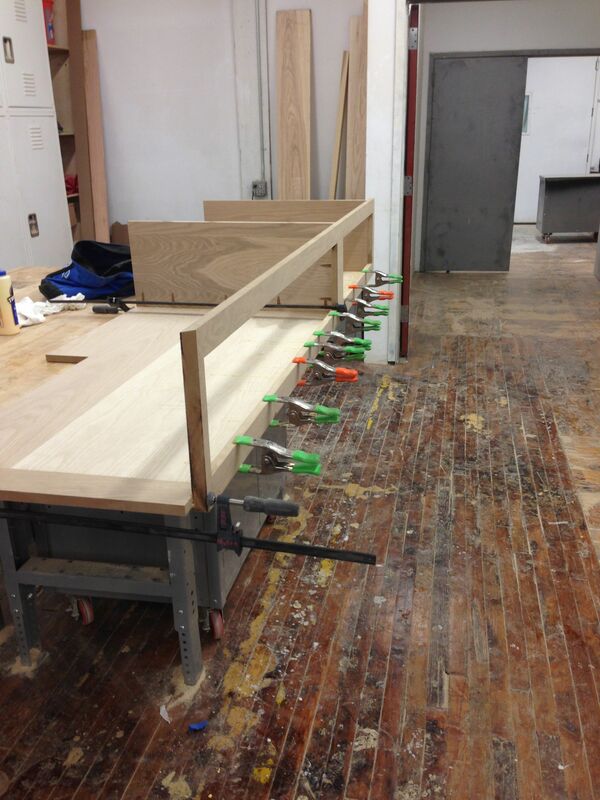 Seven36 Fine Woodworking has a 10′ x 10′ booth at the revival year event of the BKLYN DESIGN show to be held May 10-12 in the DUMBO section of Brooklyn. 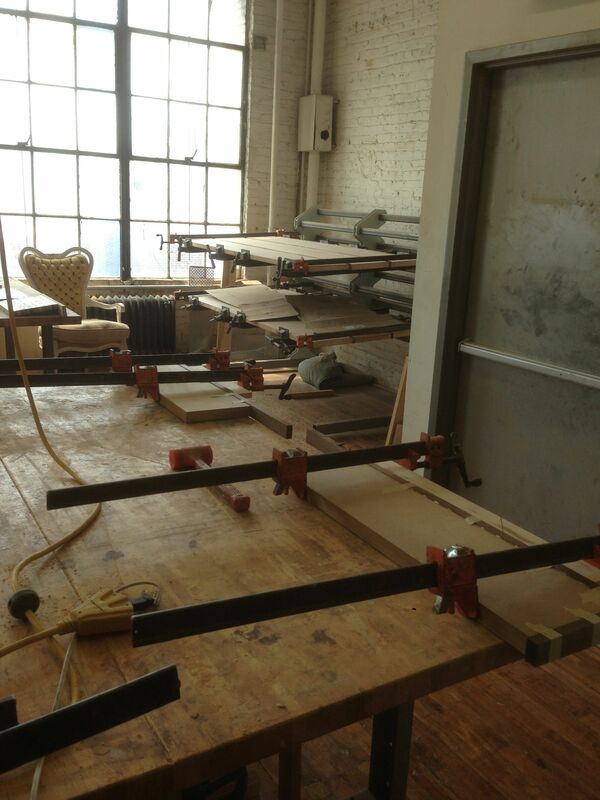 The show will take place at St. Anne’s Warehouse, 29 Jay Street, and is put on by the Brooklyn Chamber of Commerce. 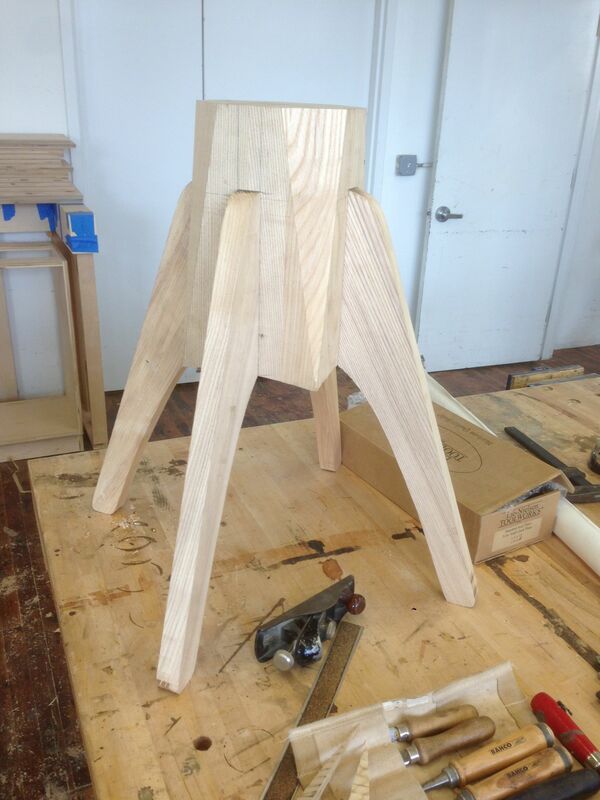 After a two-year hiatus, the tenth anniversary show marks the revival of one of the best design and craft shows in Manhattan. 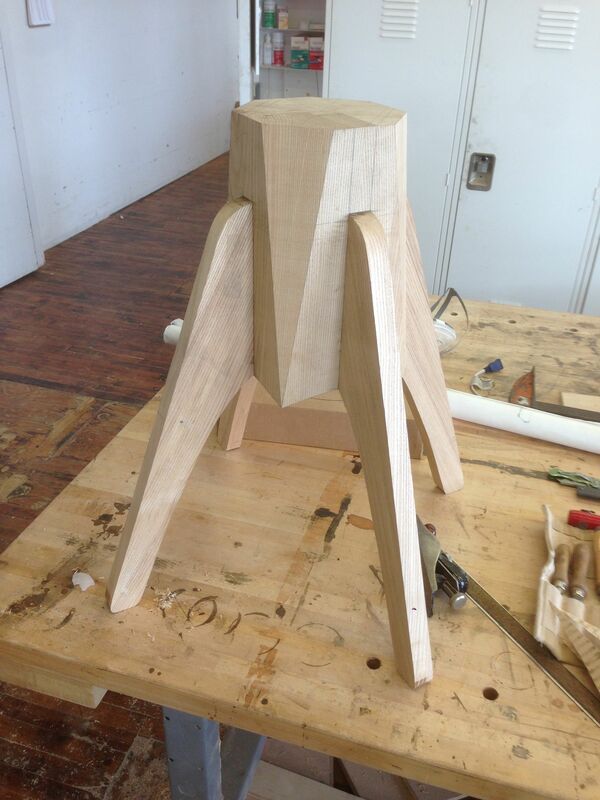 Thirty-five local designers and makers will be displaying their work through out the weekend with food trucks and other events scheduled in the area. 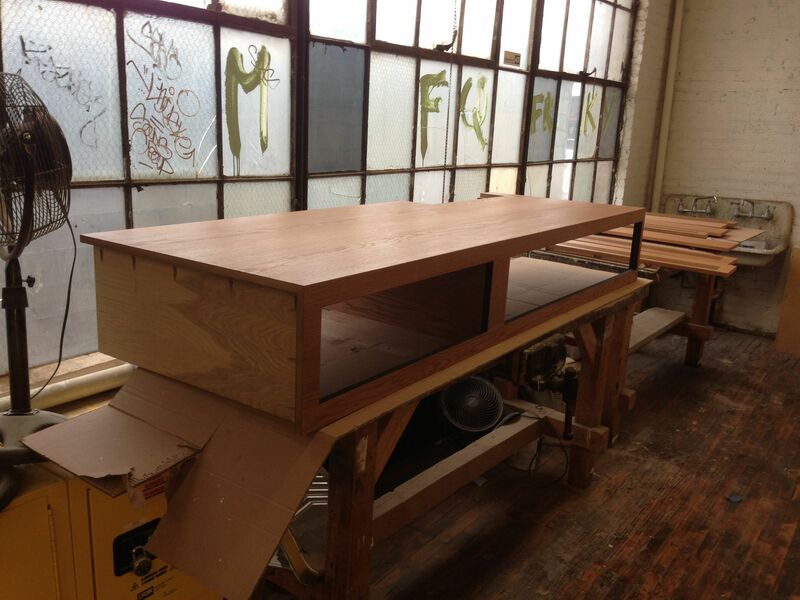 Mark your calendars now and for more information head to the BKLYN DESIGNS website. 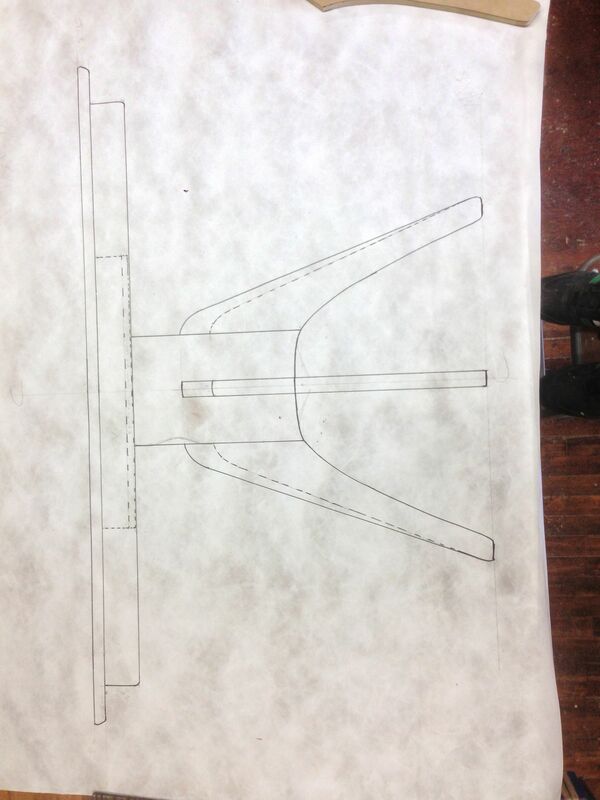 This entry was posted in Updates on March 20, 2013 by Matthew Mullen. 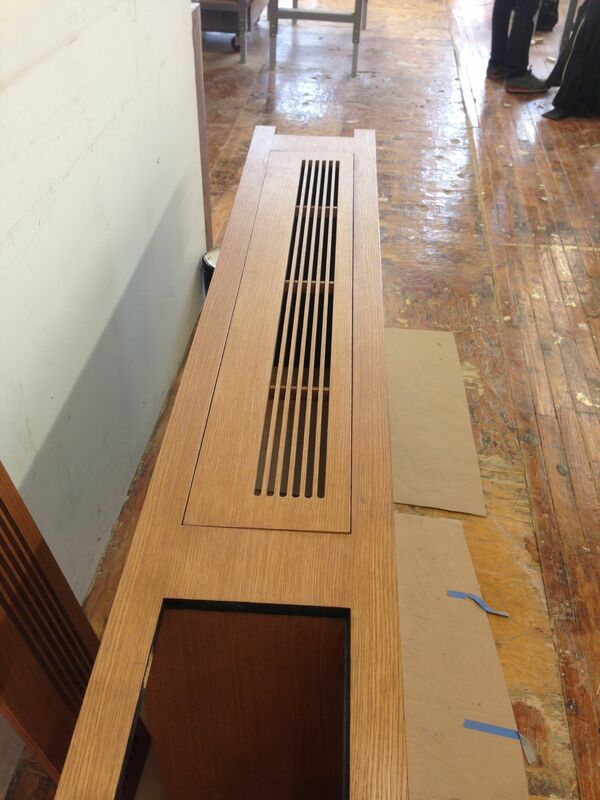 Gearing up for the install tomorrow, March 15th, the gallery below details the finishing and hardware installation of the radiator cover. 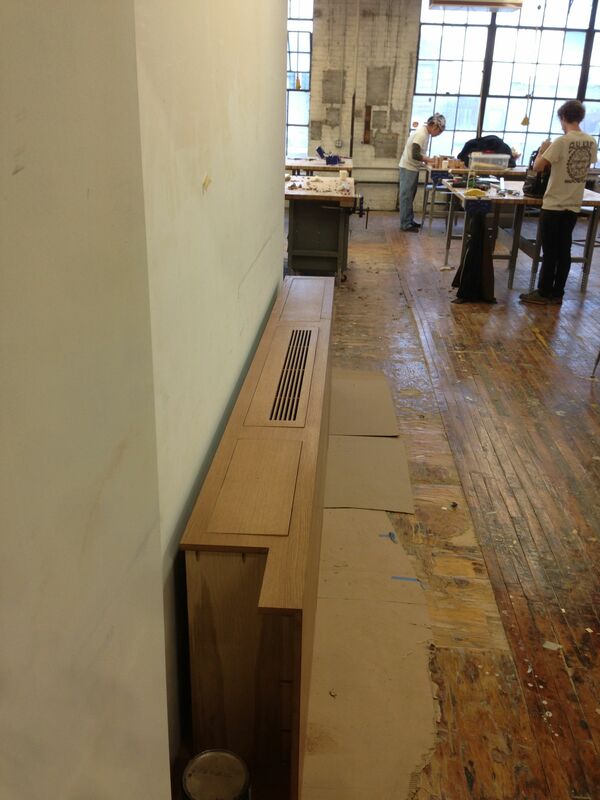 This might be the nicest radiator cover in the tri-state area. 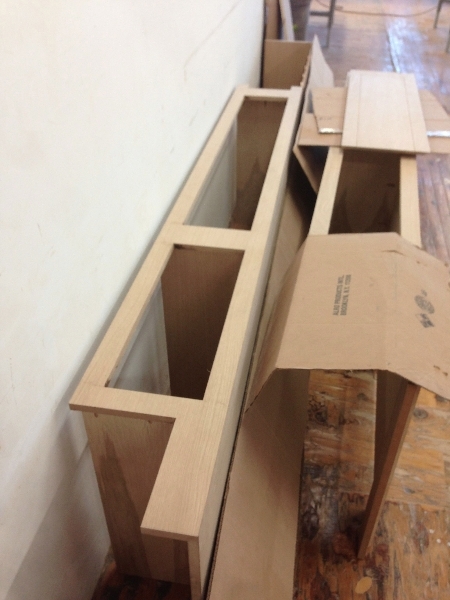 Install pics to come after the weekend. 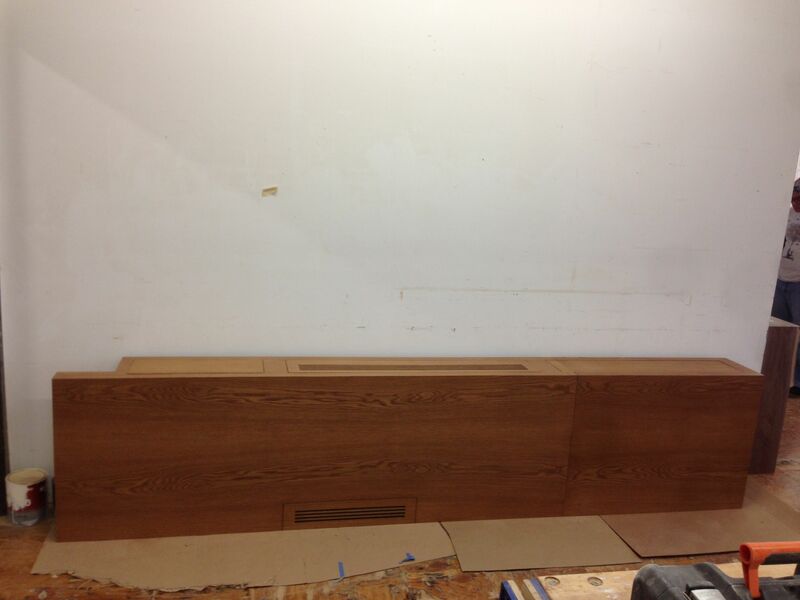 This entry was posted in Built-ins, Recent Work, Updates on March 14, 2013 by Matthew Mullen. 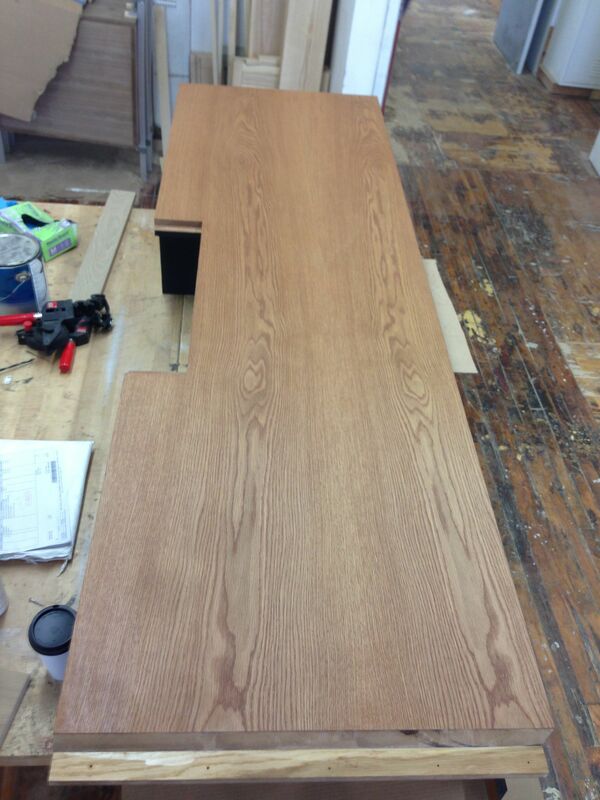 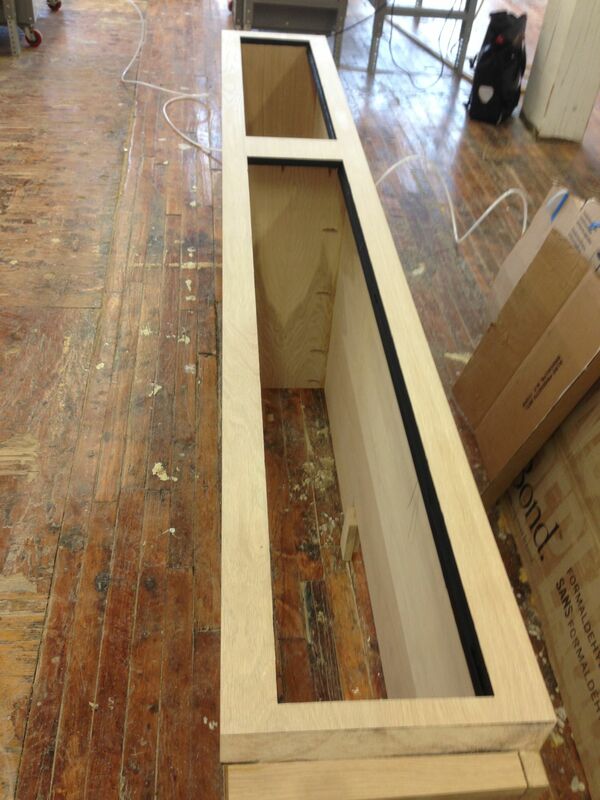 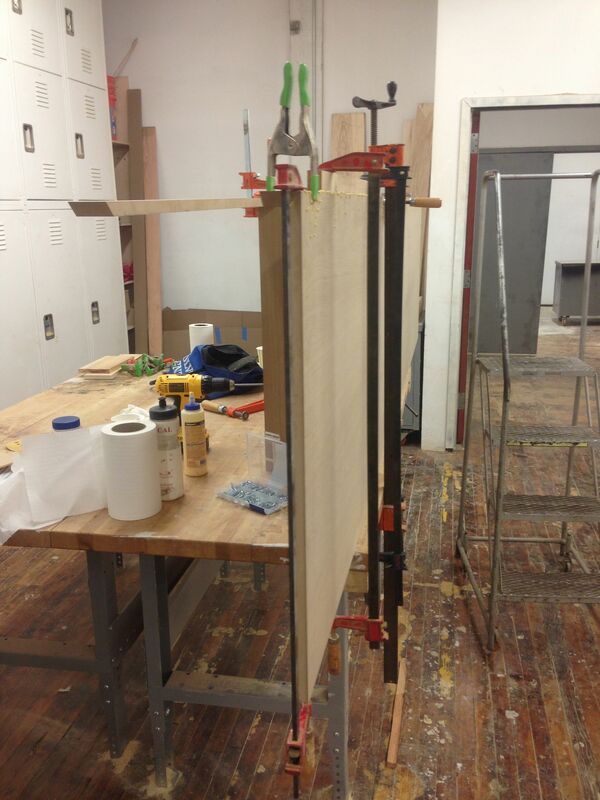 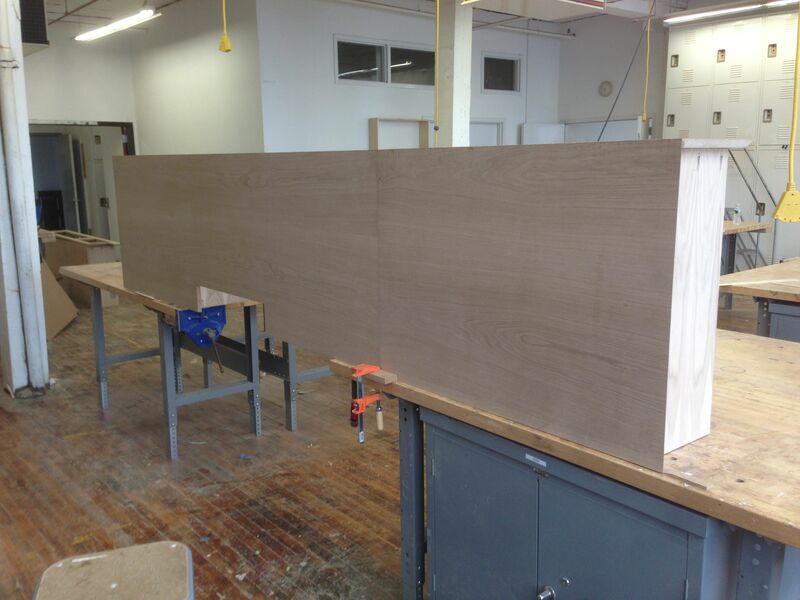 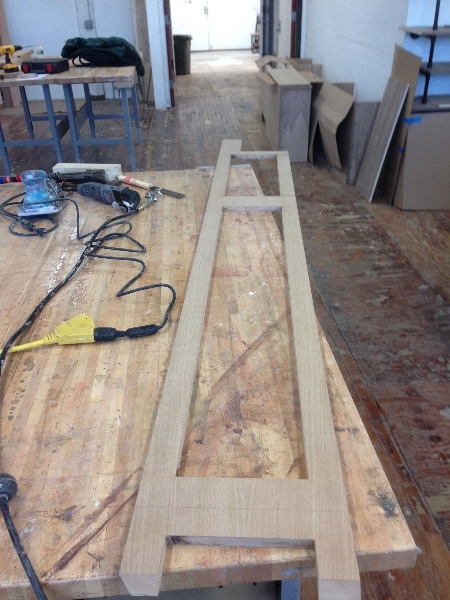 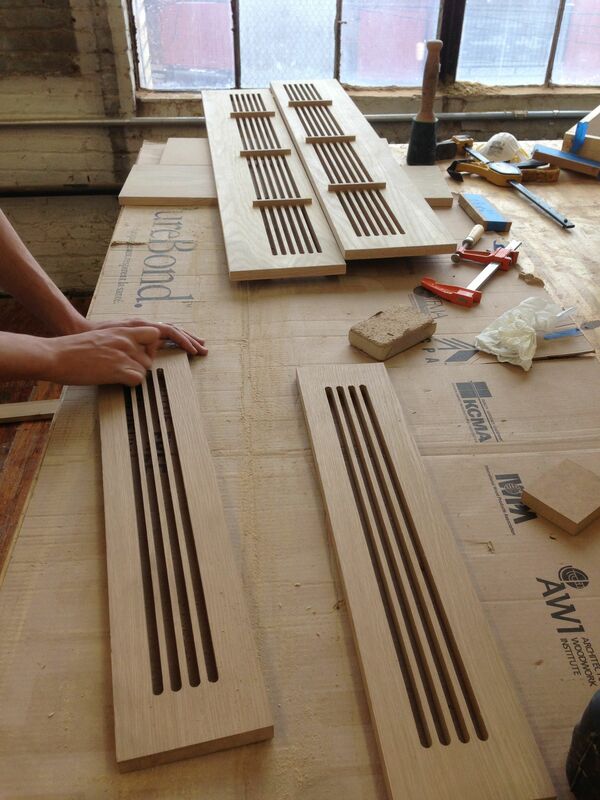 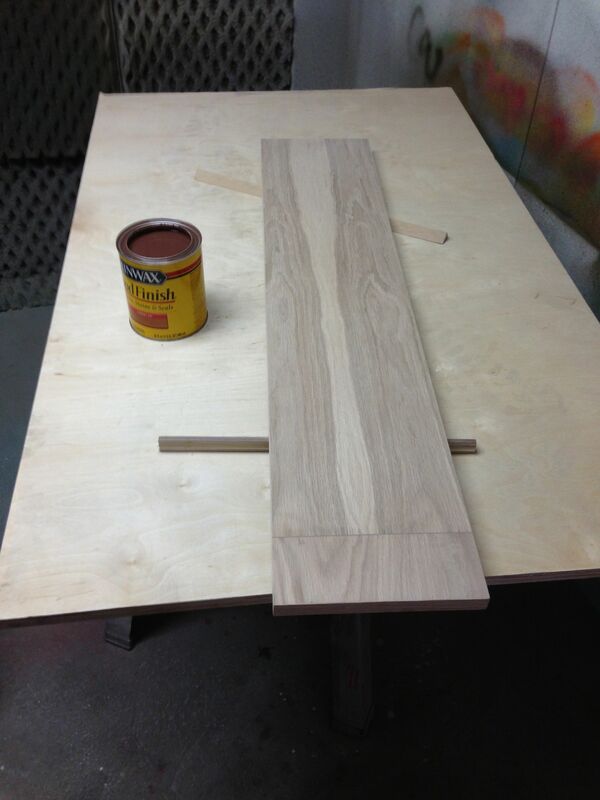 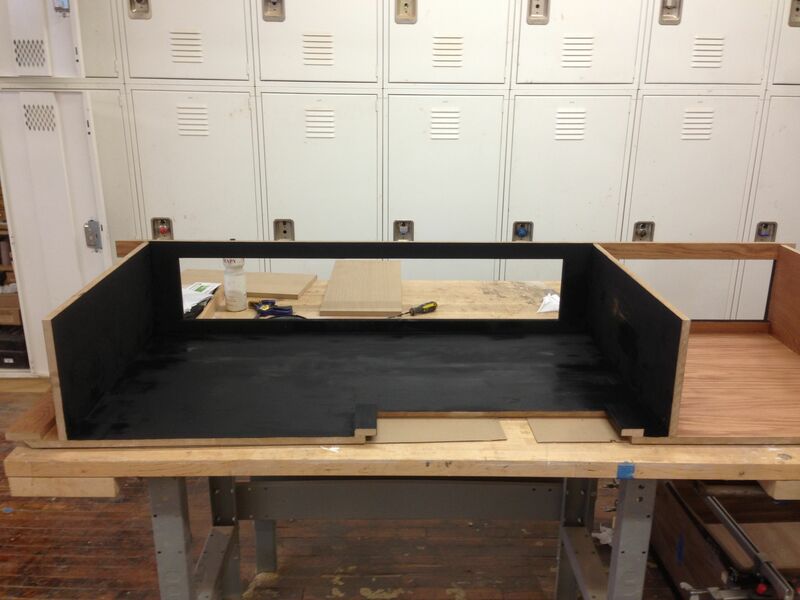 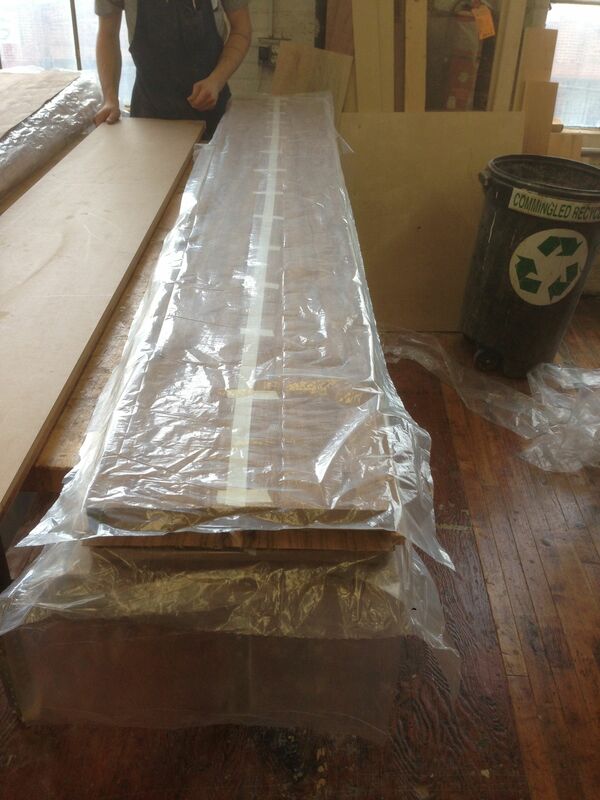 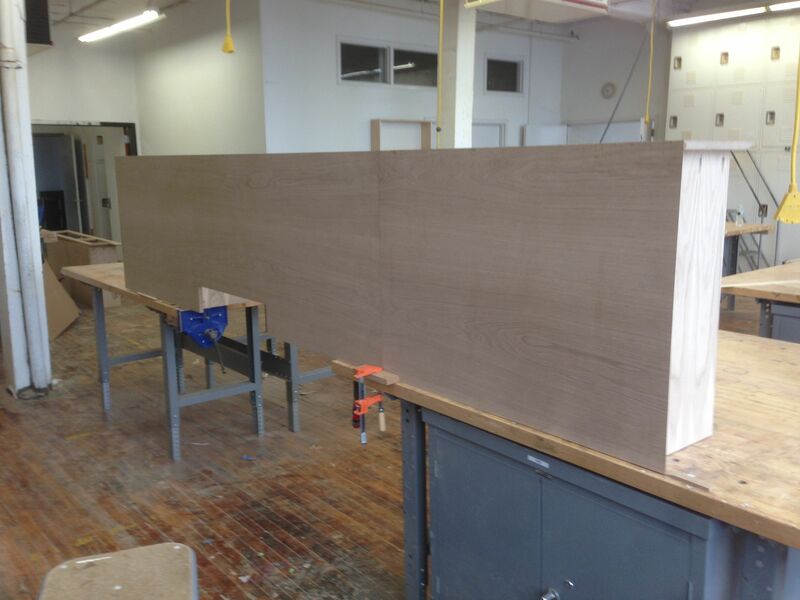 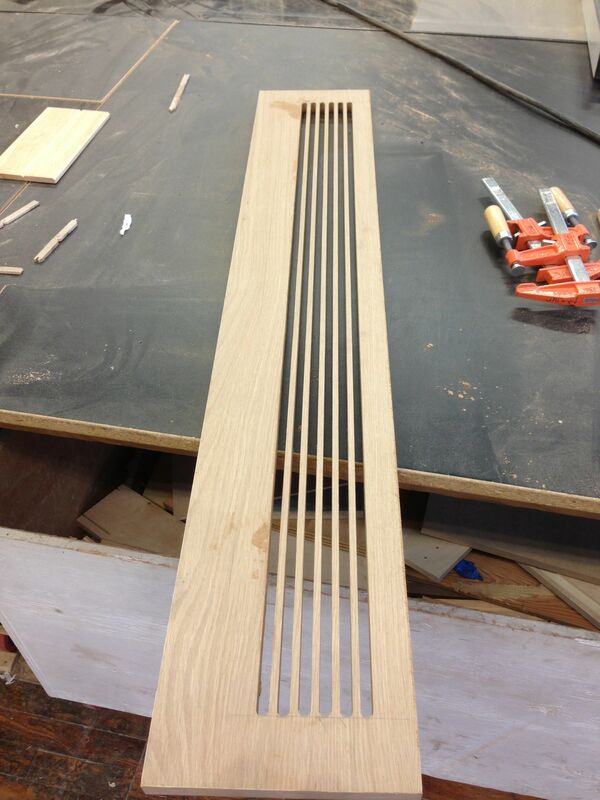 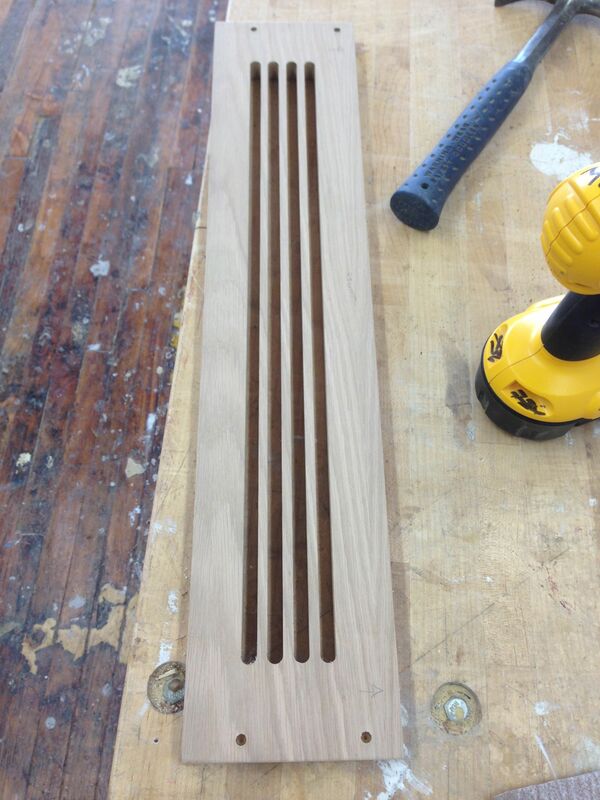 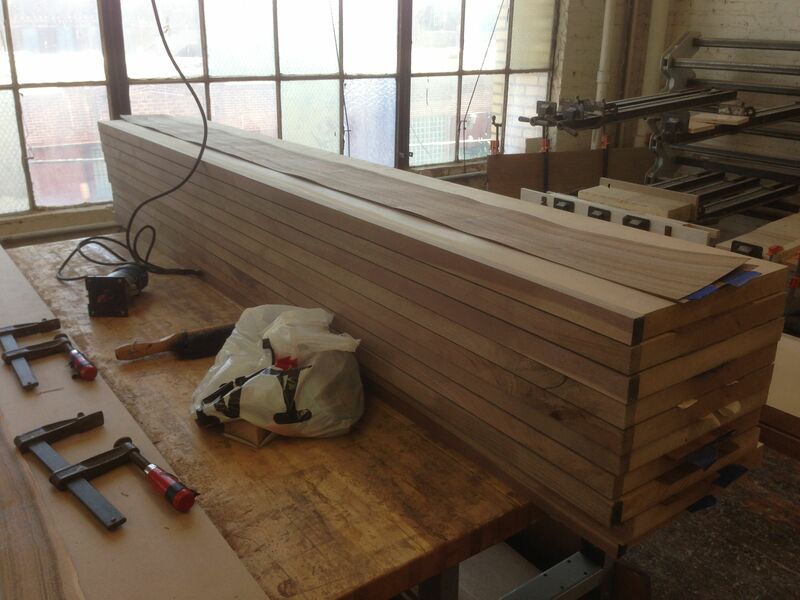 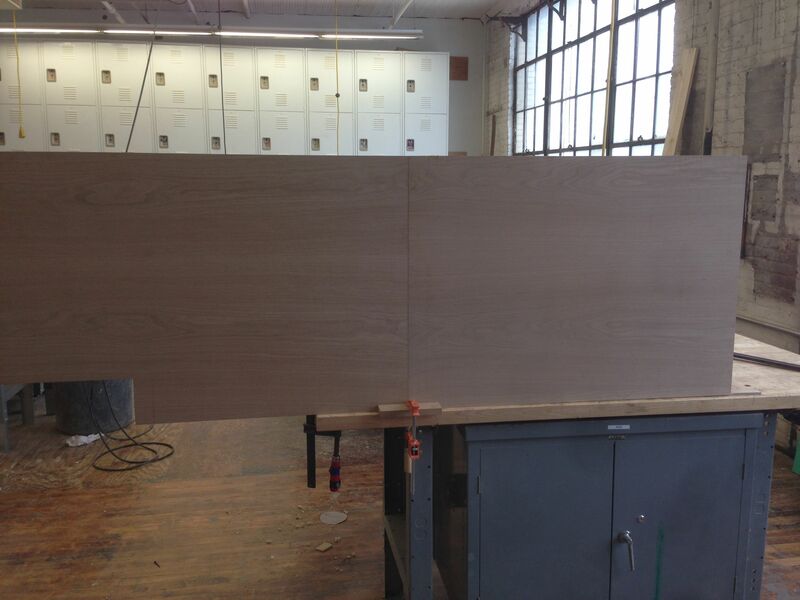 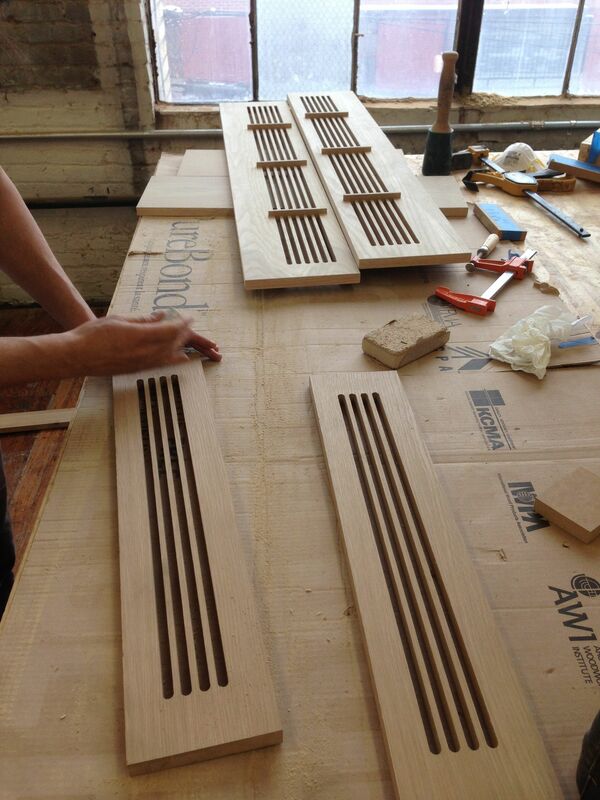 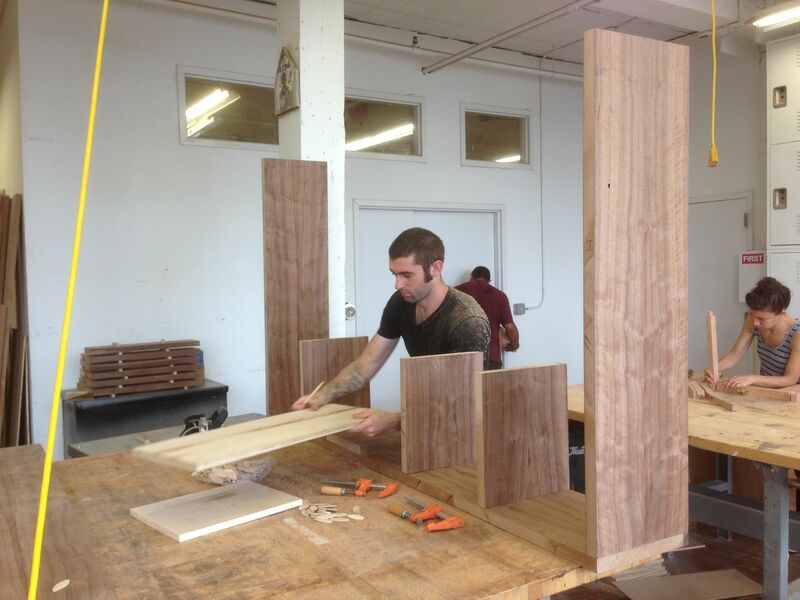 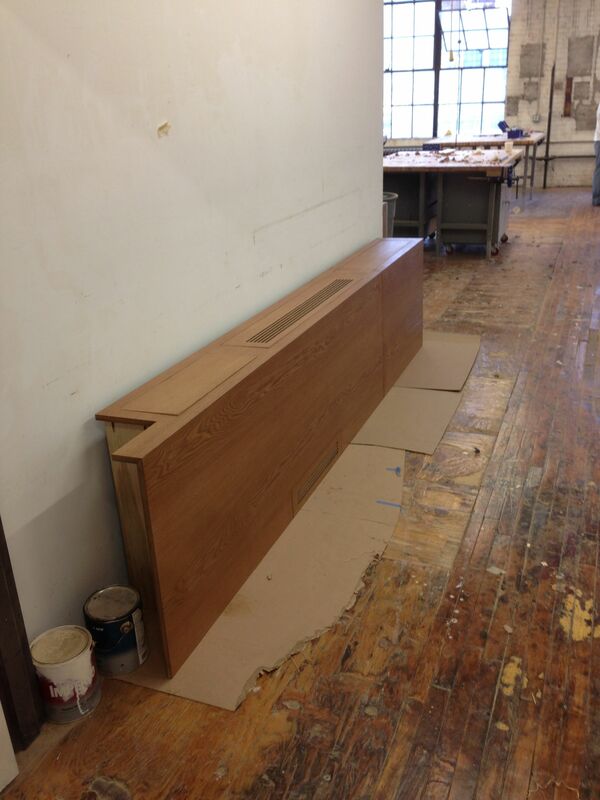 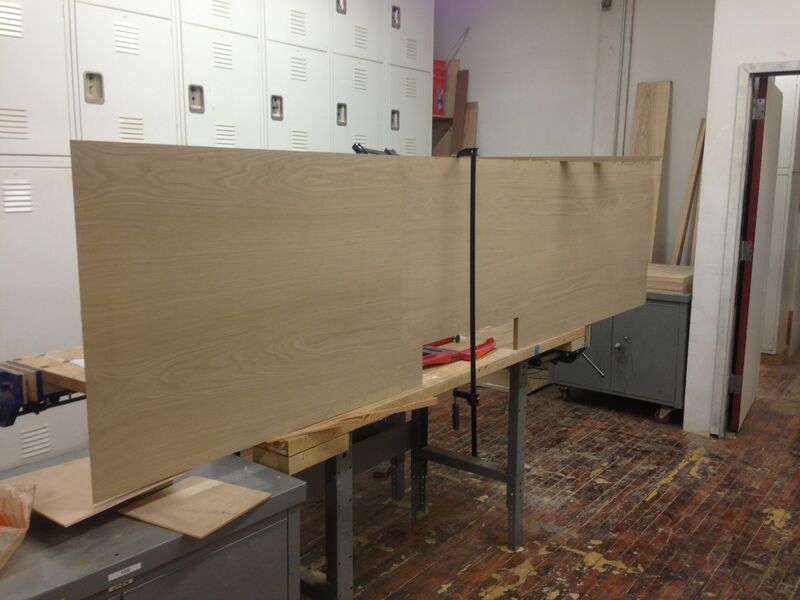 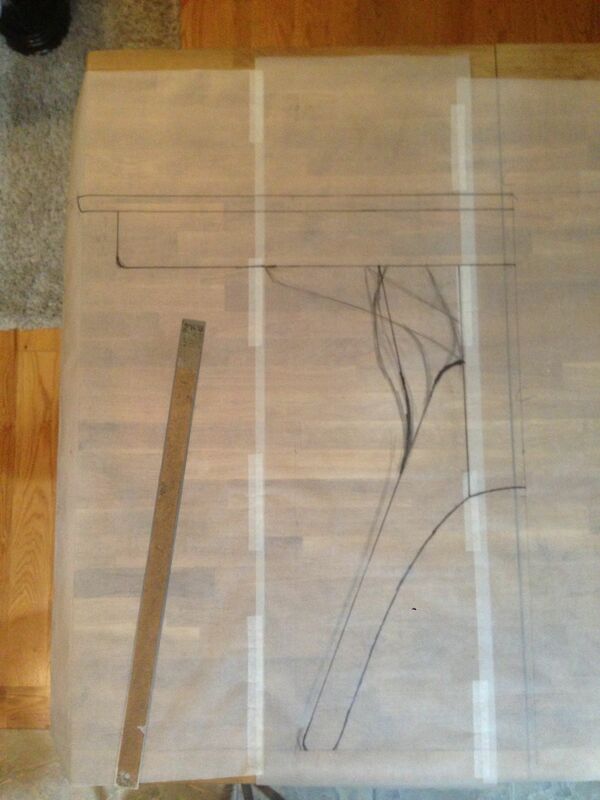 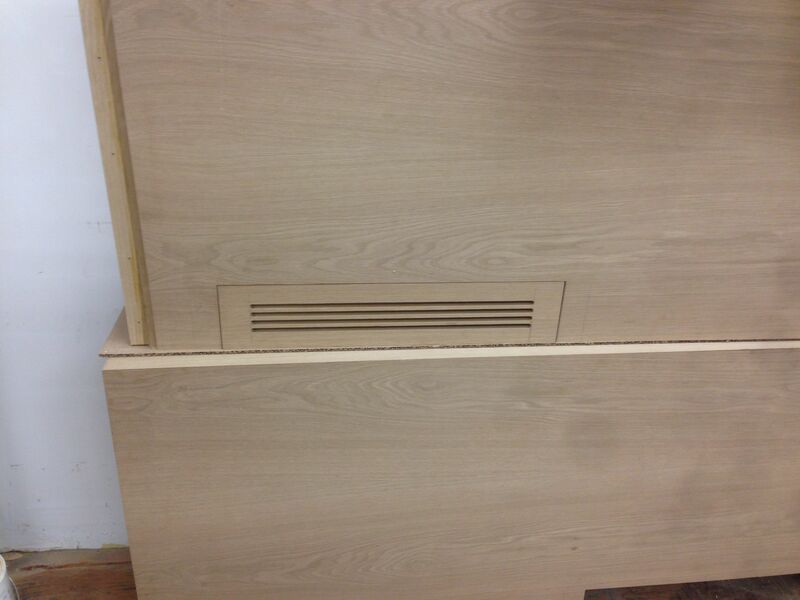 Update photos on the custom 17′ long radiator cover. 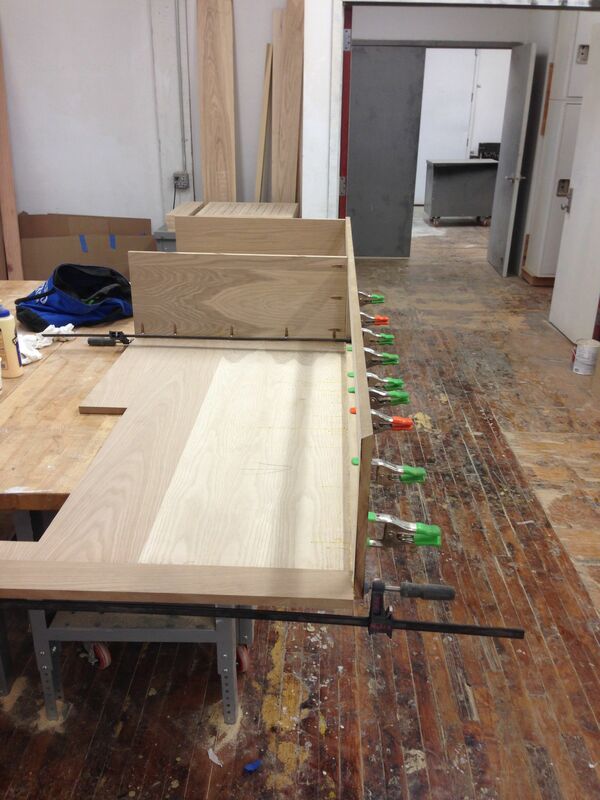 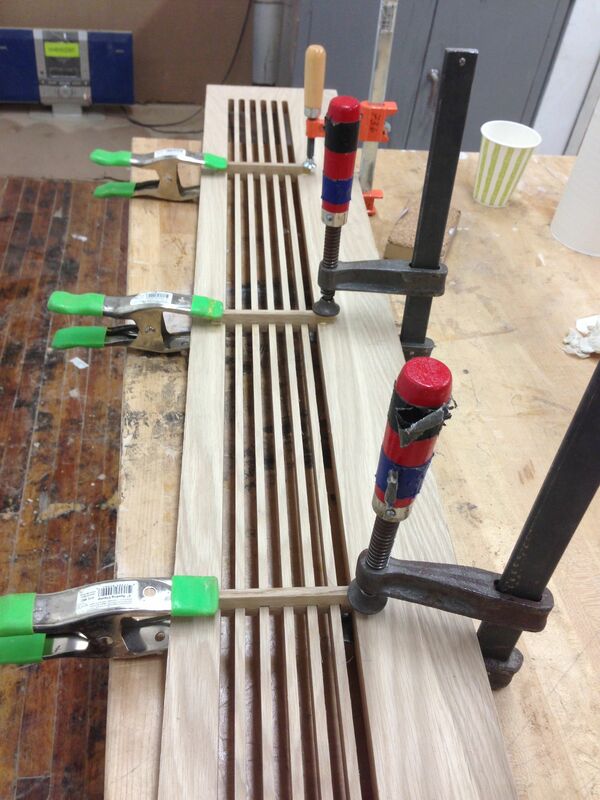 Everything is glued, dry clamped three sections together to fasten them together before install. 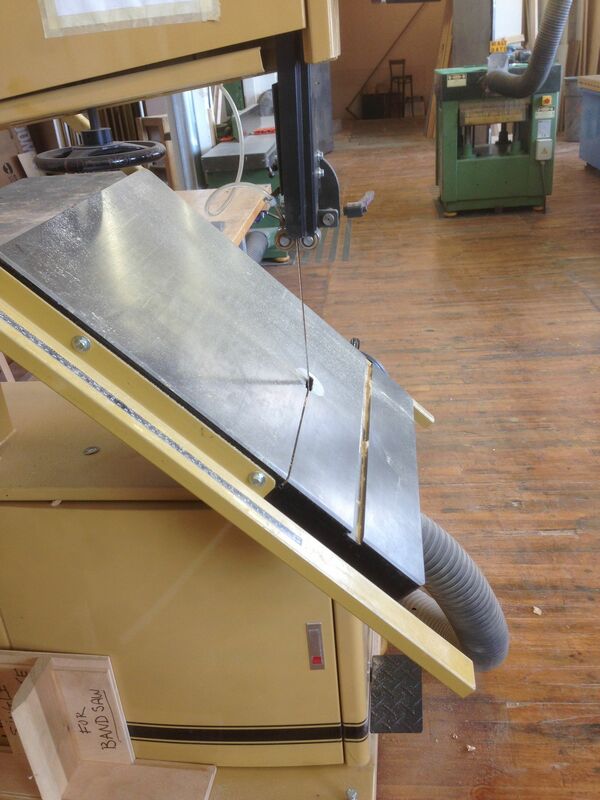 The entire unit will be removable in the event the units need to be repaired. 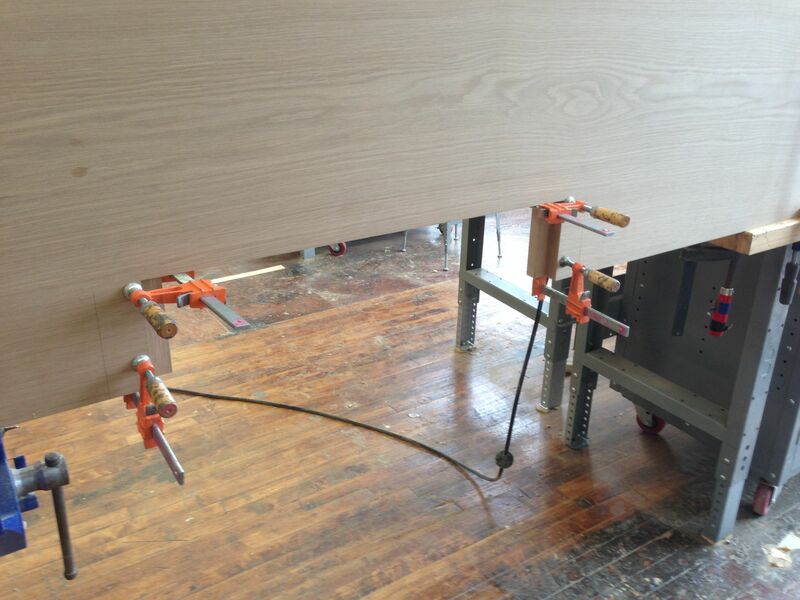 By the end of the gallery, everything has been detailed sanded. 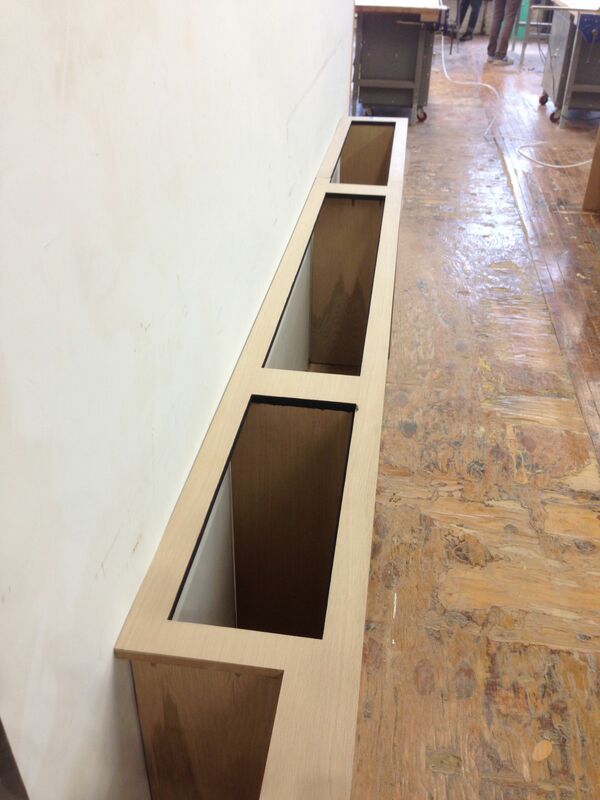 Hardware and finishing next, install by the end of the week. 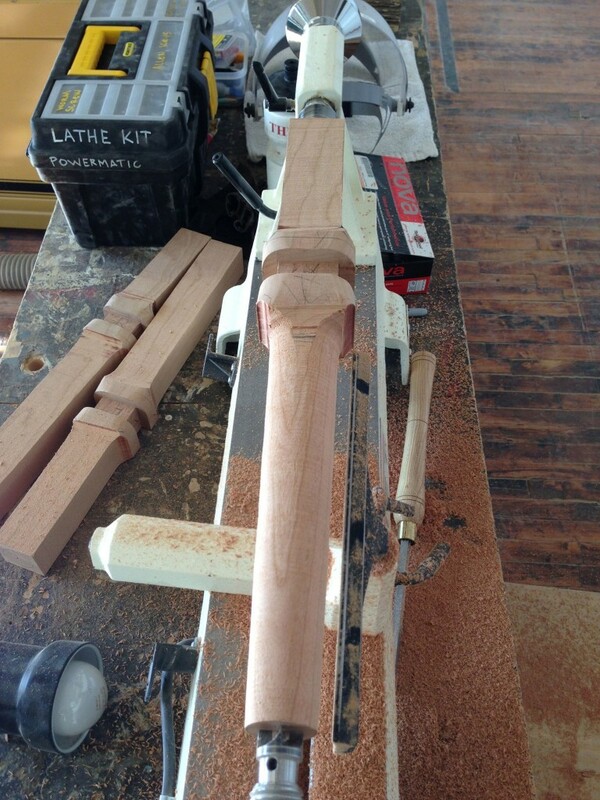 This entry was posted in Recent Work, Updates on March 10, 2013 by Matthew Mullen. 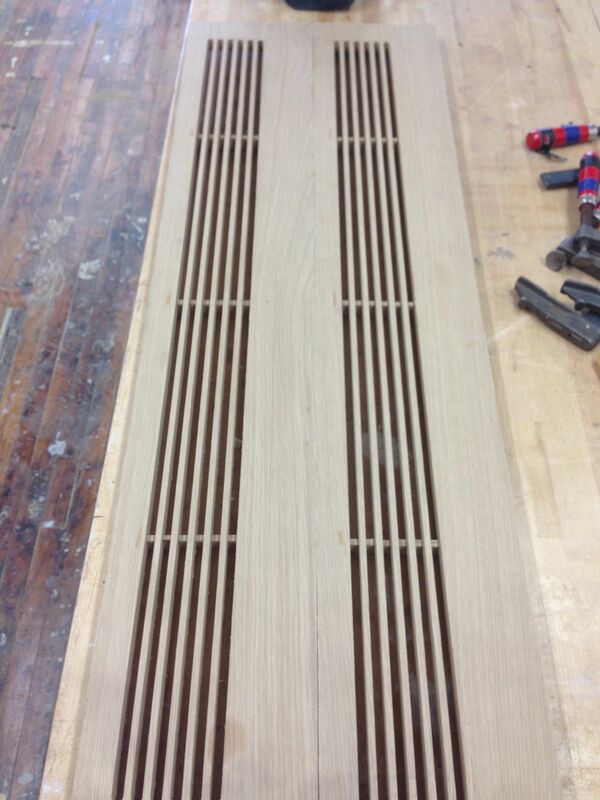 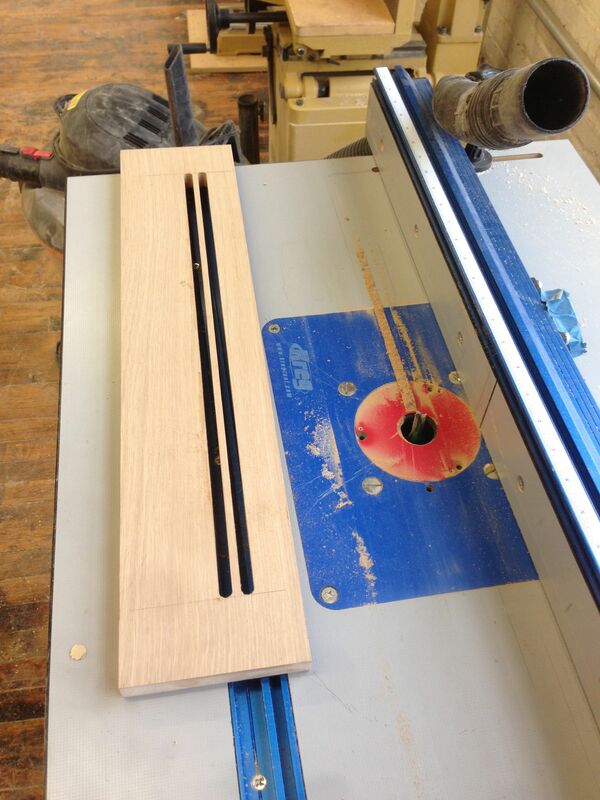 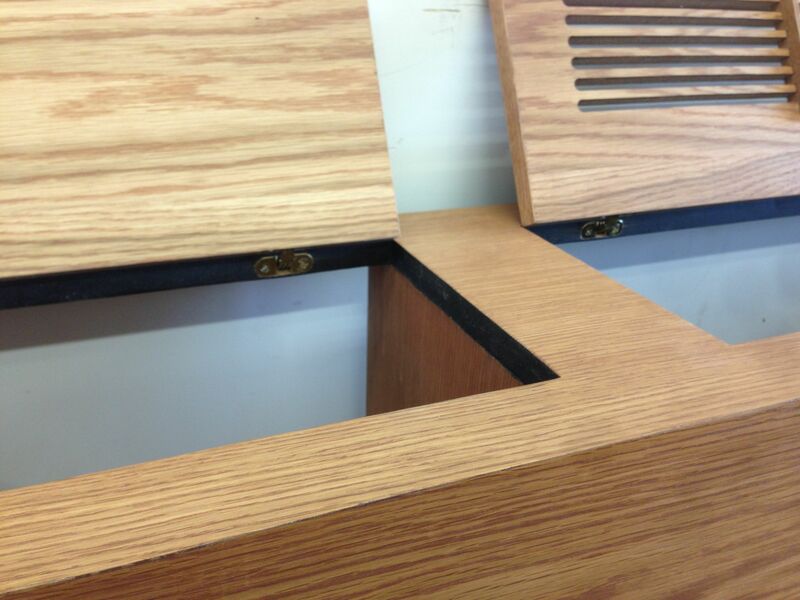 After using a CNC router bit in a trim router and setting a nice, crisp 1/16″ heavy door gap, it was time to cut the hatches out completely for the custom radiator covers. 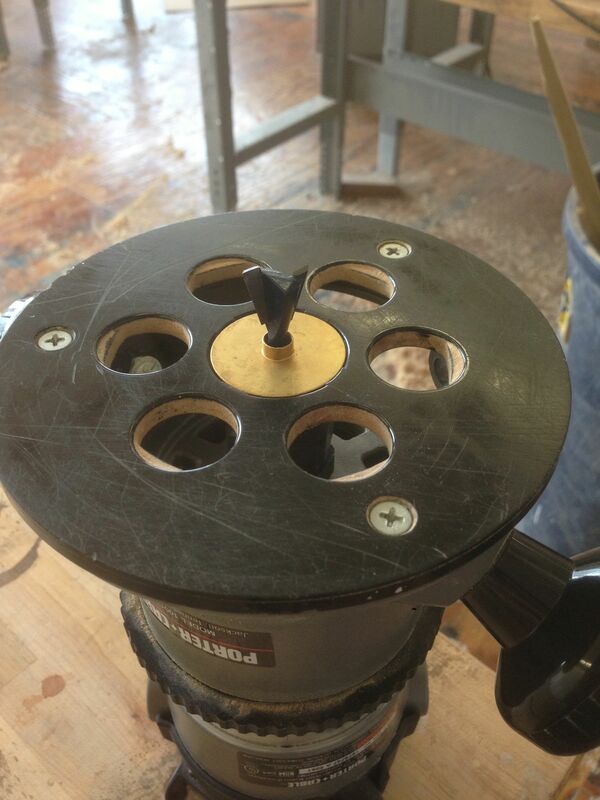 It was a chance to use a brand new tool though I had used a version of it previously while building boats in Annapolis. 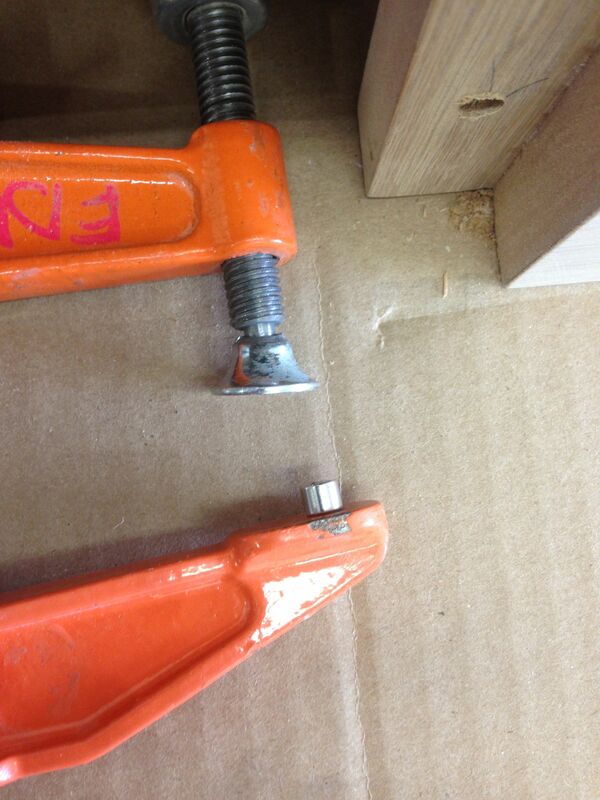 It is the Porter-Cable version of the FEIN multi tool. 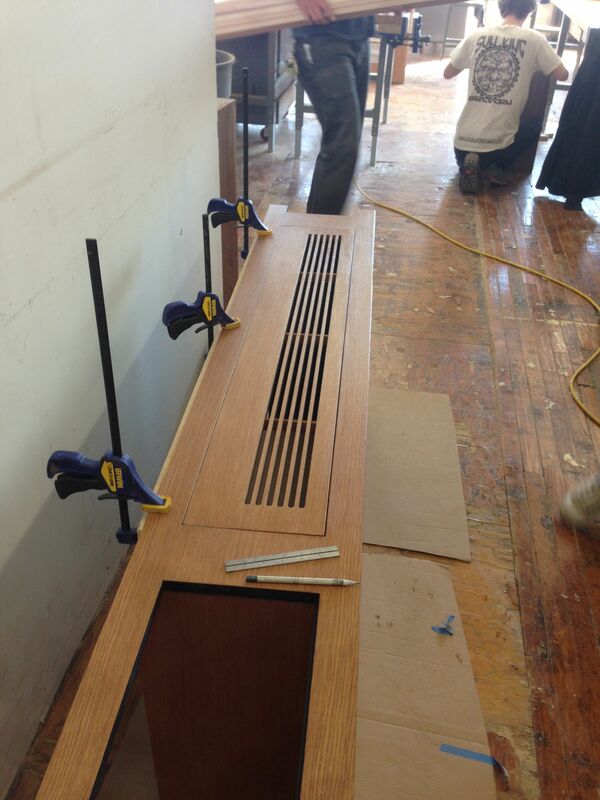 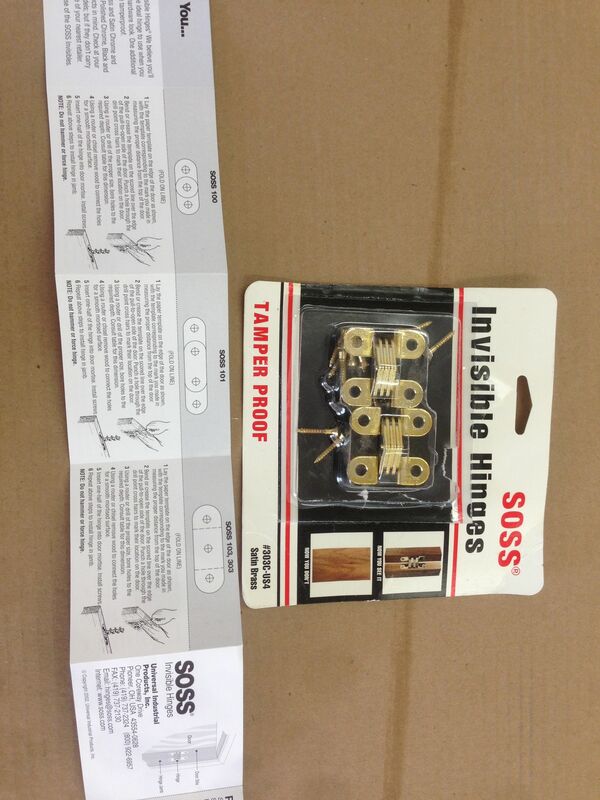 It’s really amazing and so versatile, I don’t know how people get along without when doing on site installations. 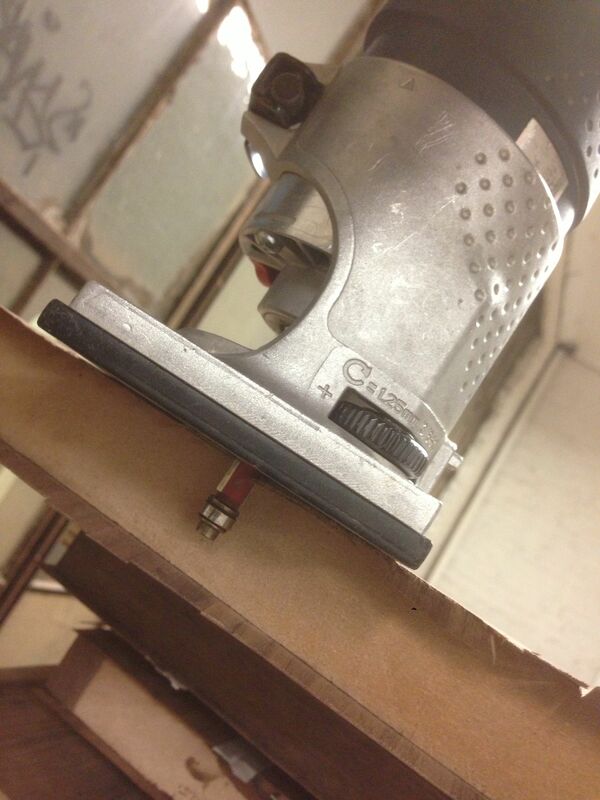 Its small enough to get into very tight spaces and sports a plethora of blade attachments to accomplish any task. 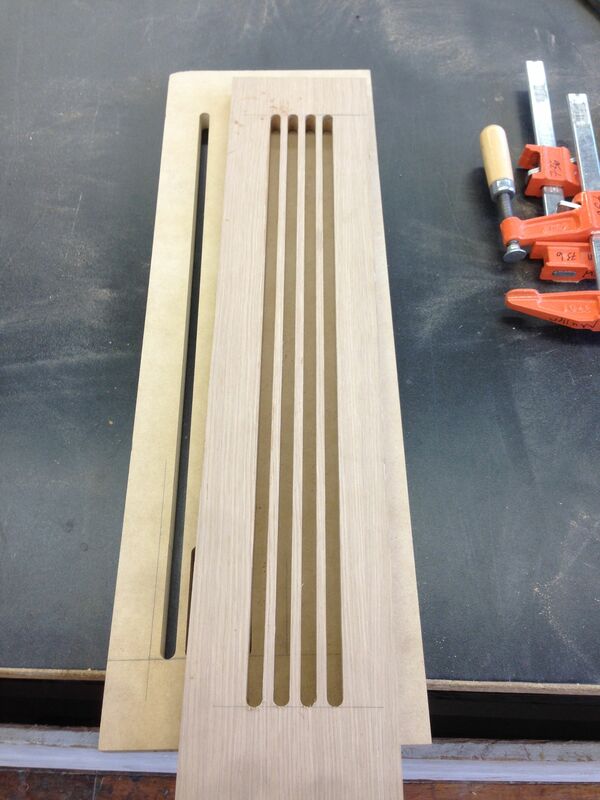 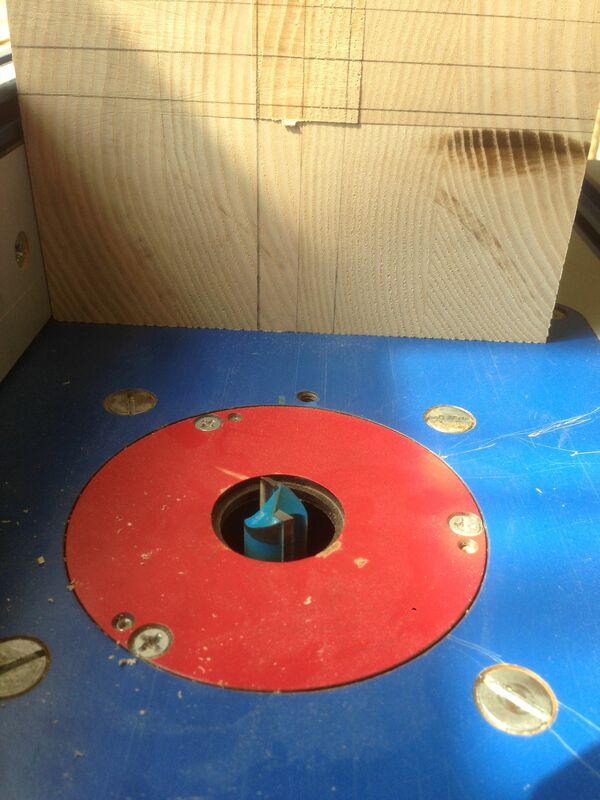 Anyway, hatches are out, some clean up left, edge banding and routing the louvres next. 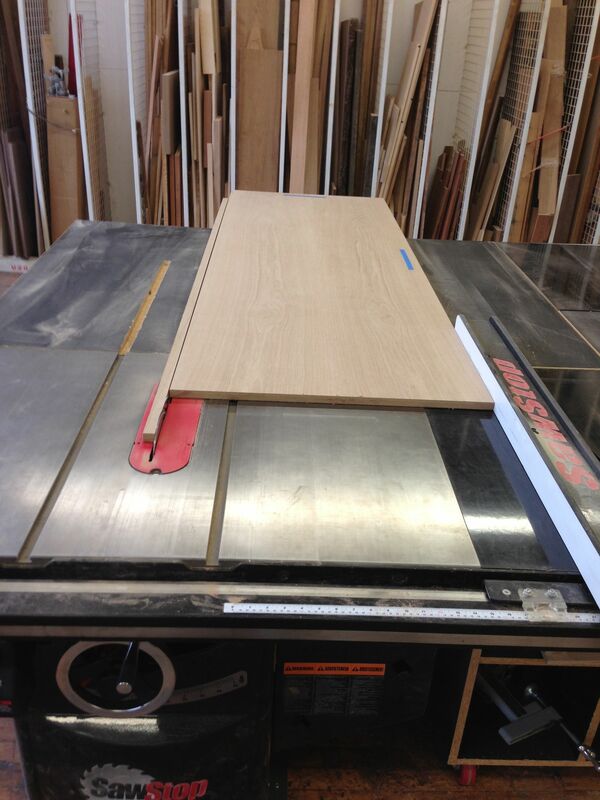 This entry was posted in Built-ins, Updates on March 5, 2013 by Matthew Mullen. 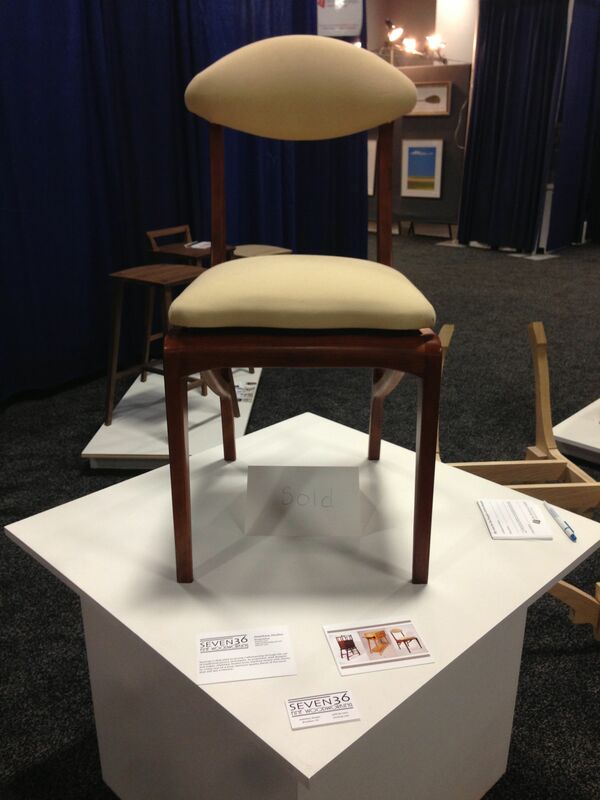 The Furniture Project is a unique group of furniture makers that are in their third year of putting on a juried show during the New England Home Show at the Seaport World Trade Center in Boston, MA. 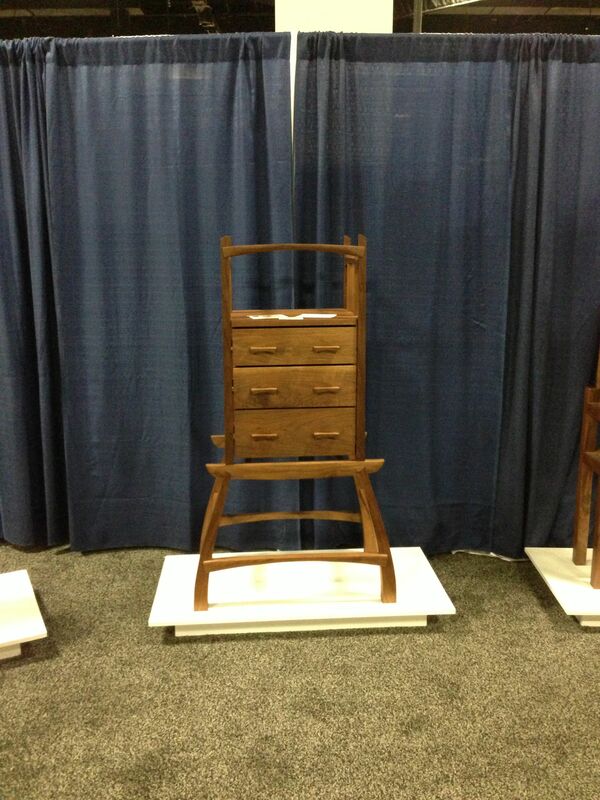 This years creative category was Chest on Stand and I was entered into the show because of my walnut chest on stand piece. 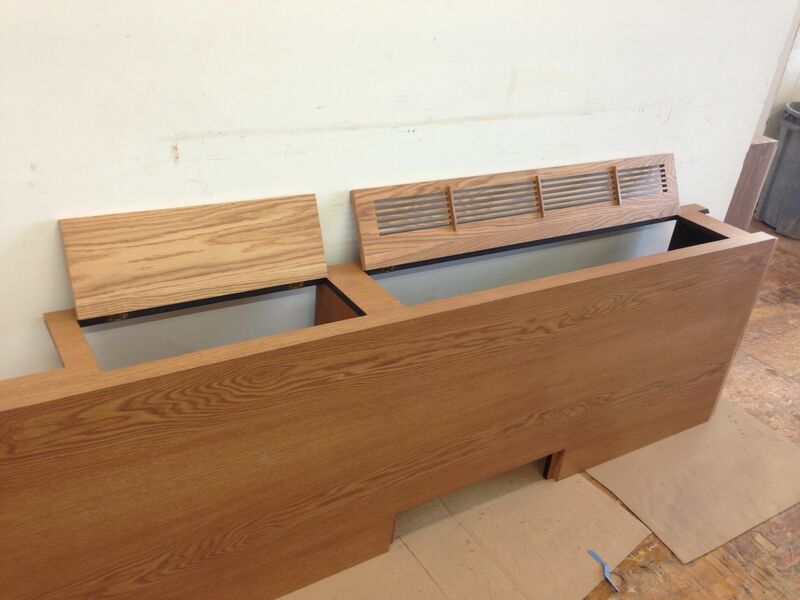 I was also able to show the sideboard and my upholstered chair. 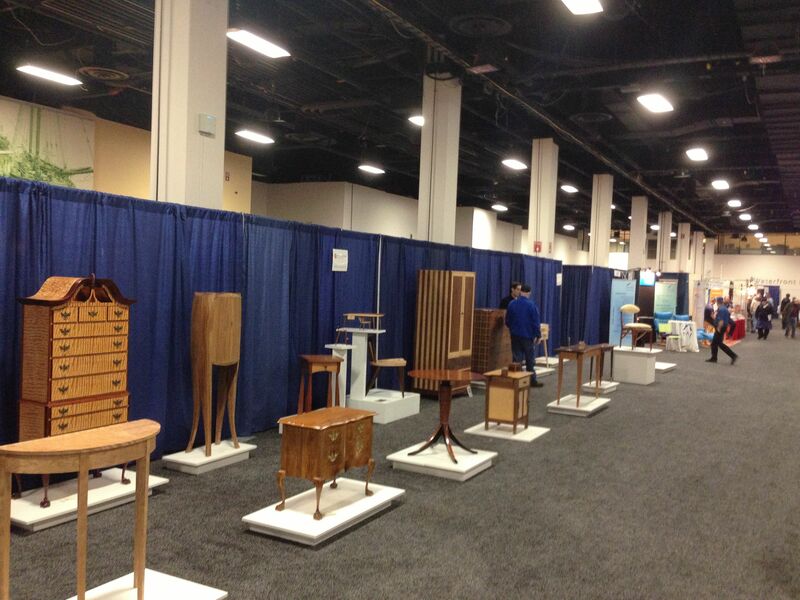 Among the notable makers there, Tom MacDonald of Rough Cut on PBS was there and offering his advice and critiques to all the exhibitors. 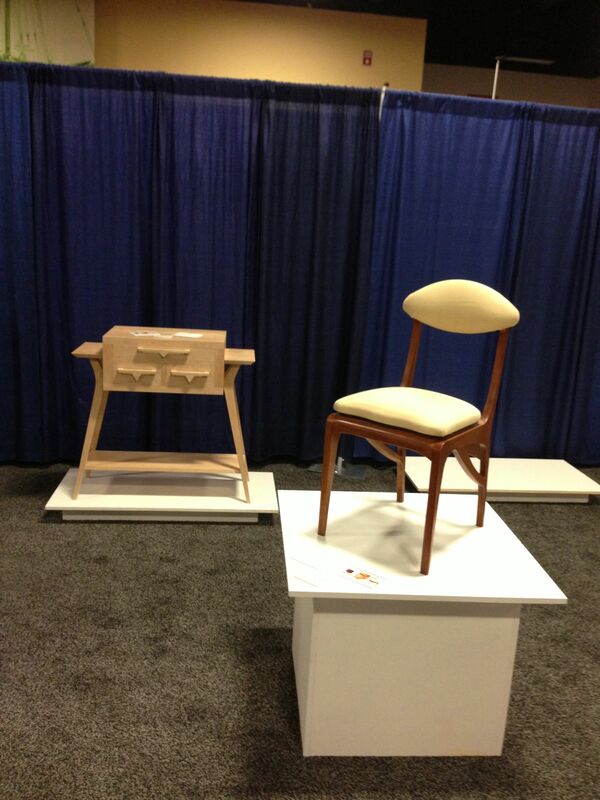 It was a tremendous experience meeting contemporaries; seeing what they were making and designing. 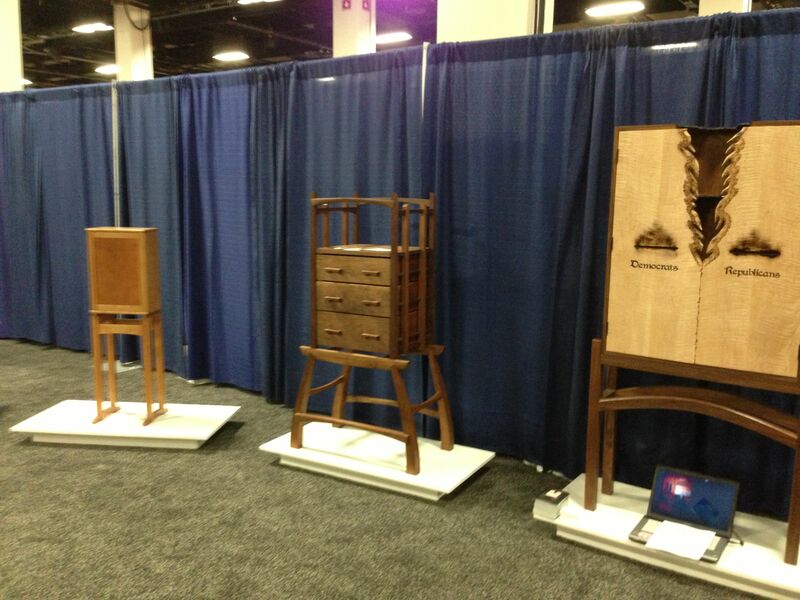 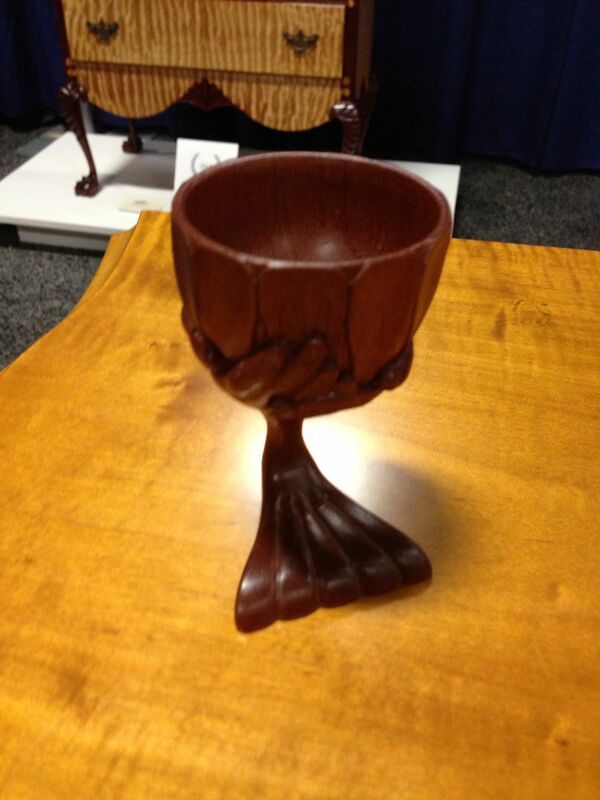 There were many notable makers there, such as Phil Lowe and Glen Gaurino. 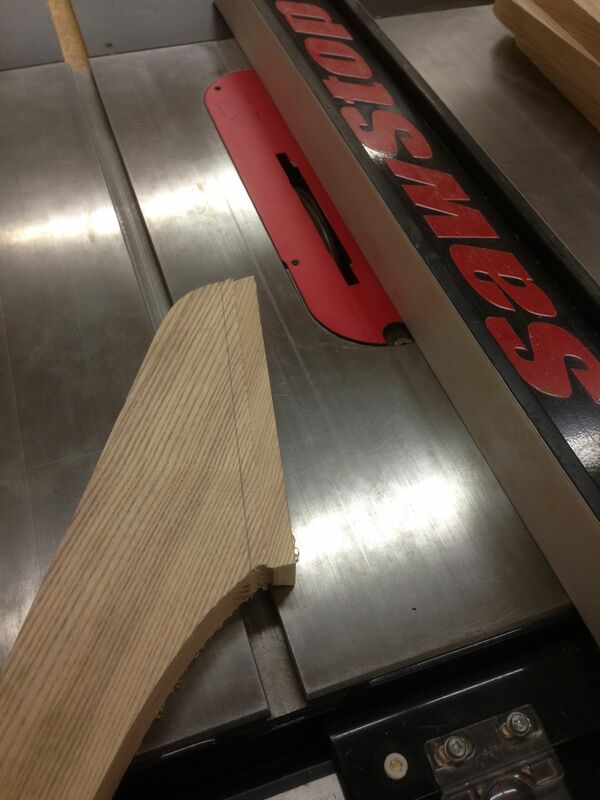 There were two exciting moments during the weekend. 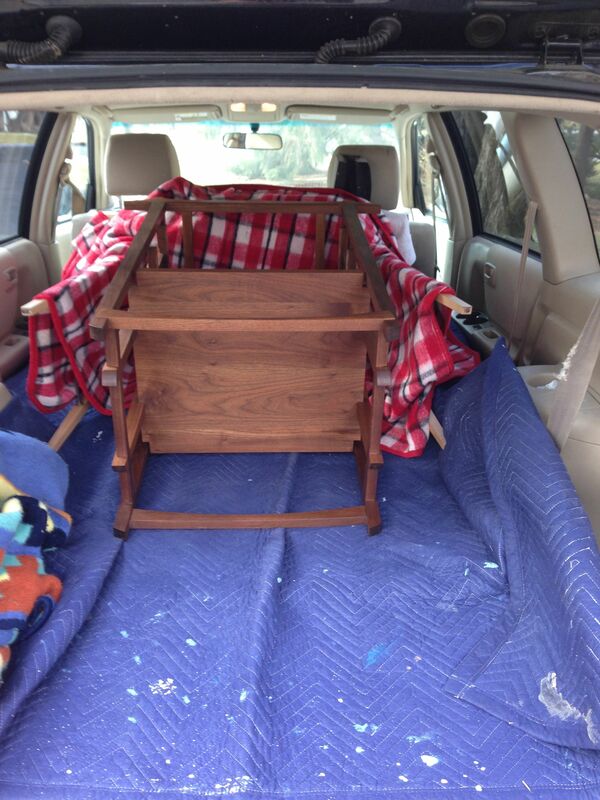 The best being the sale of the upholstered chair. 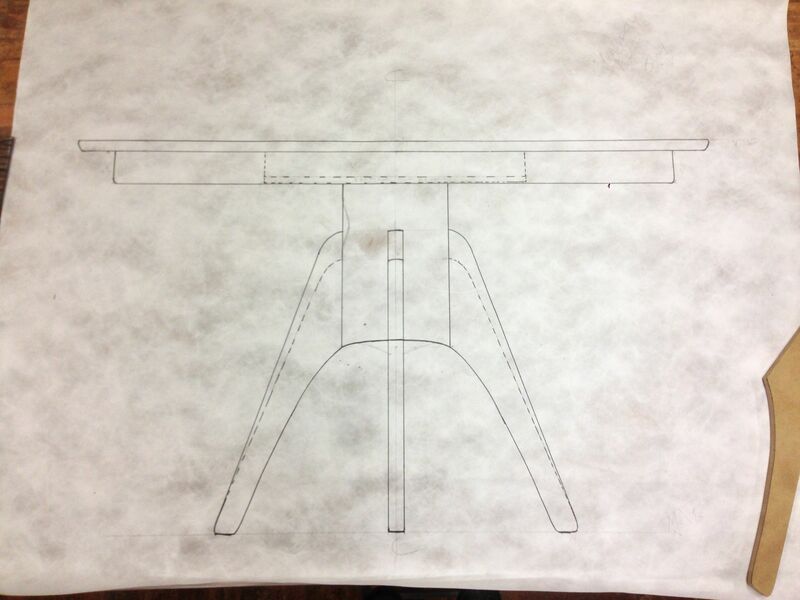 It was my first sale in a gallery setting and it was invigorating to know someone appreciated my design and craftsmanship to want to own an original piece of mine. 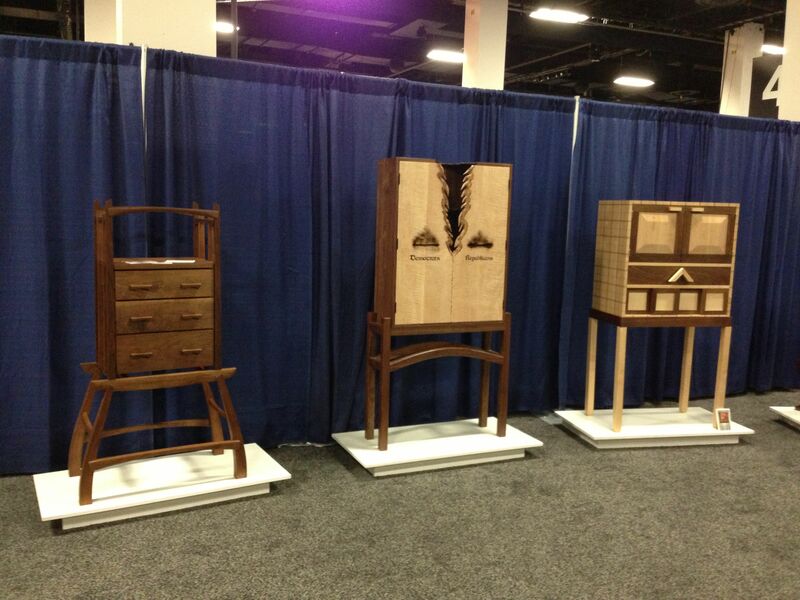 The other news was the chest on stand winning the People’s Choice Award for the weekend. 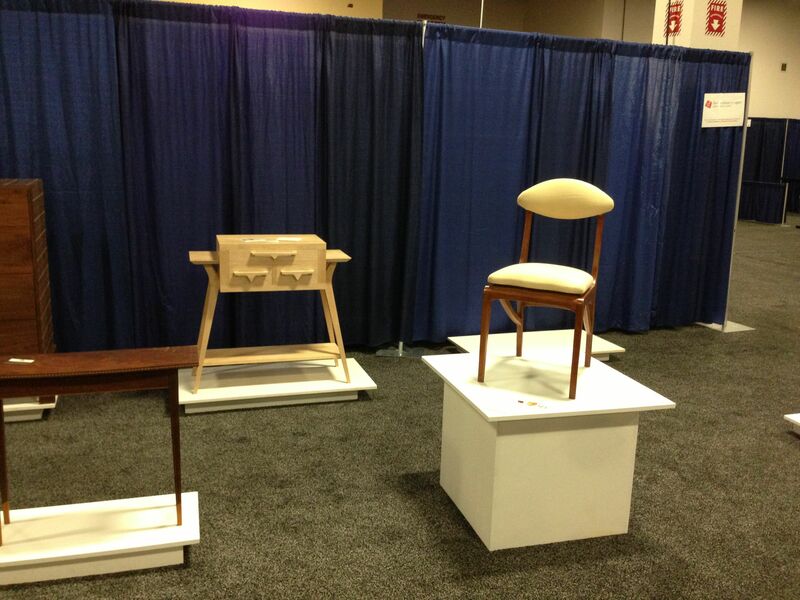 These two events have opened up some old design ideas and I am very excited for the BRKLYN Designs show in May. 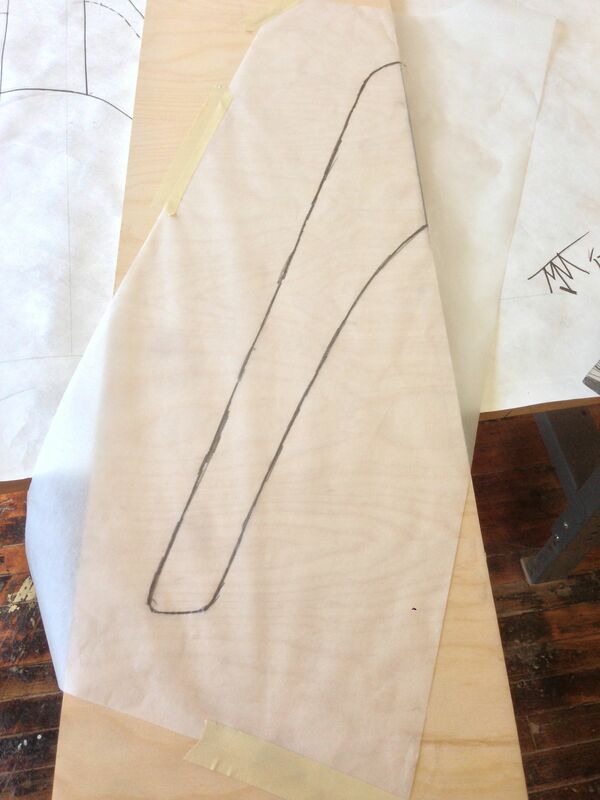 I hope to have one or two new pieces made exploring new designs and iterations of these pieces. 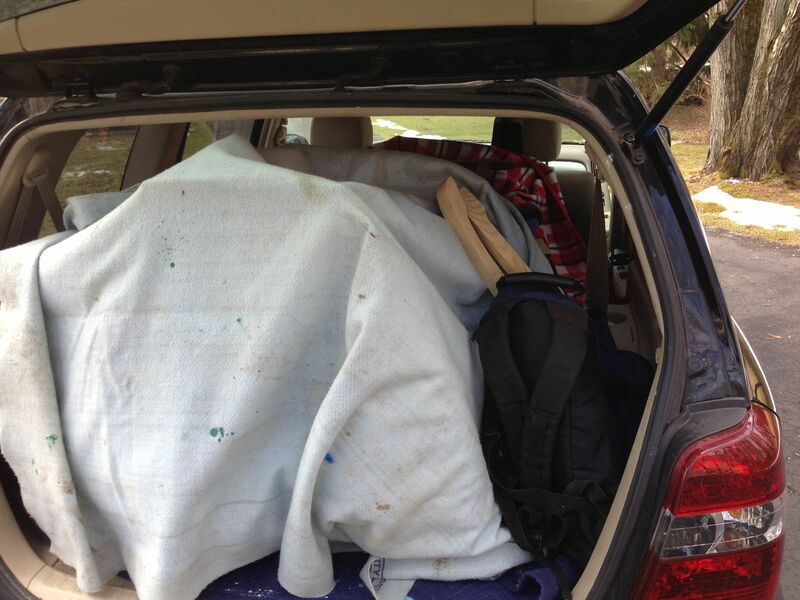 There was a professional photographer there and once the pictures become available, I will post a link. 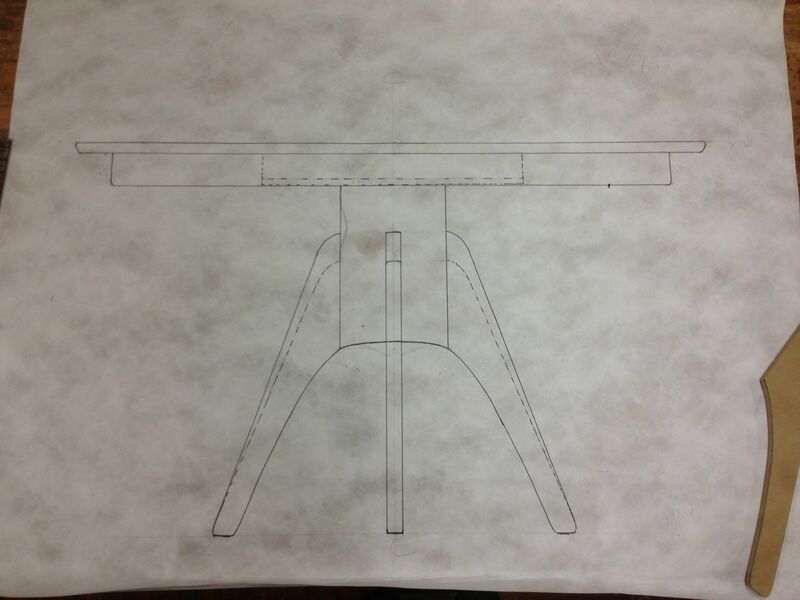 Enjoy what I have below and thanks for the support. 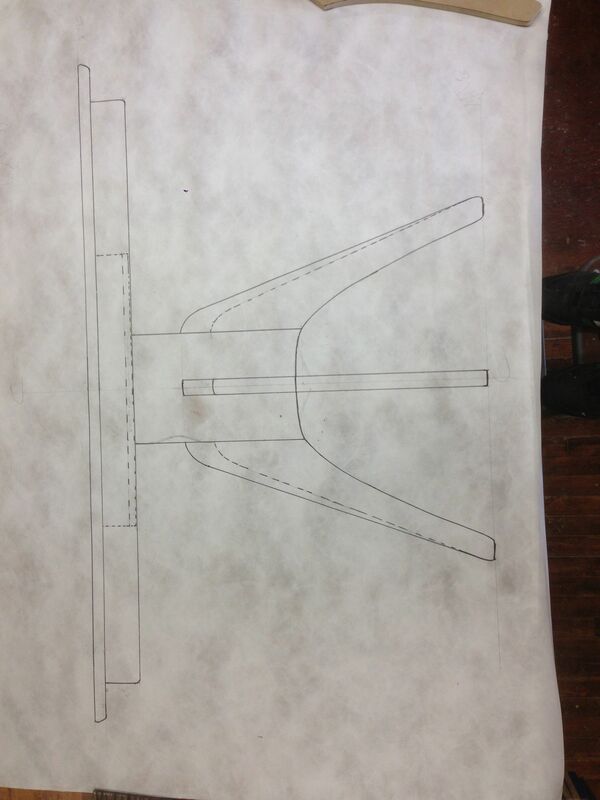 This entry was posted in Updates on March 3, 2013 by Matthew Mullen. 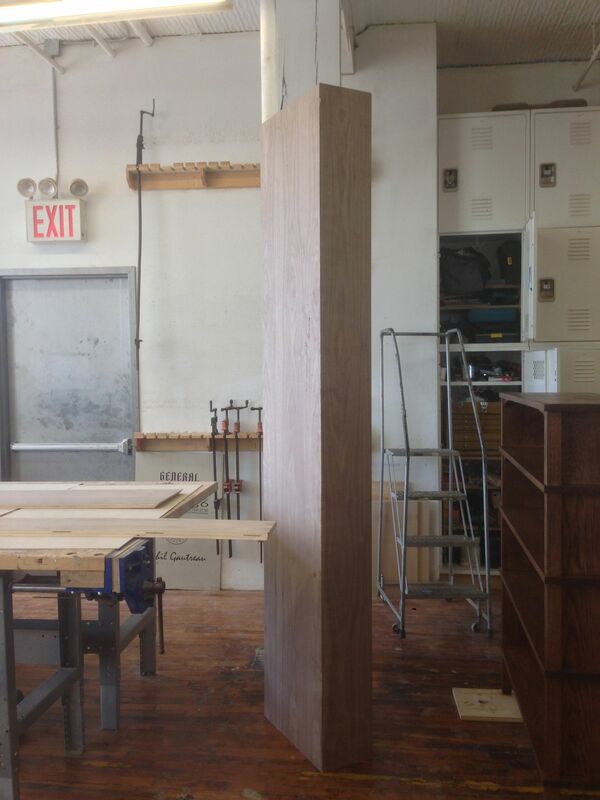 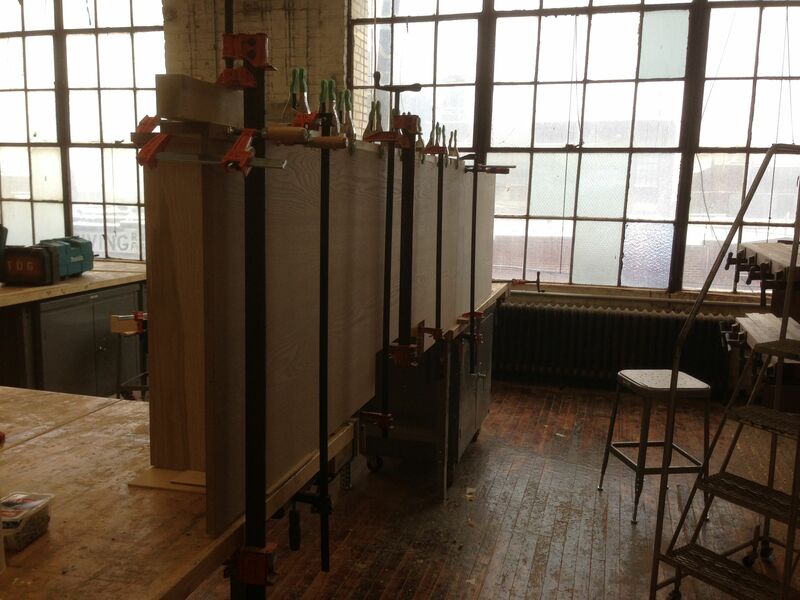 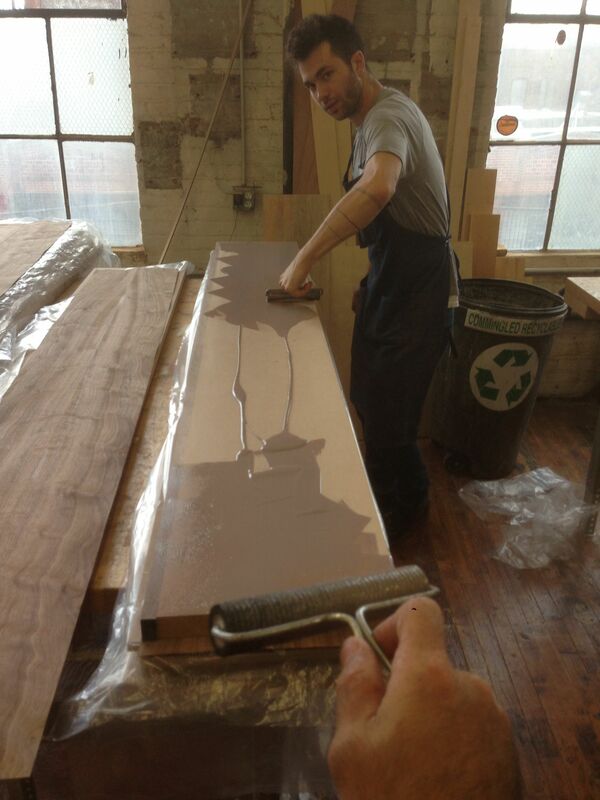 This gallery covers the build of a 17′ long radiator cover for a master bedroom in a Brooklyn apartment. 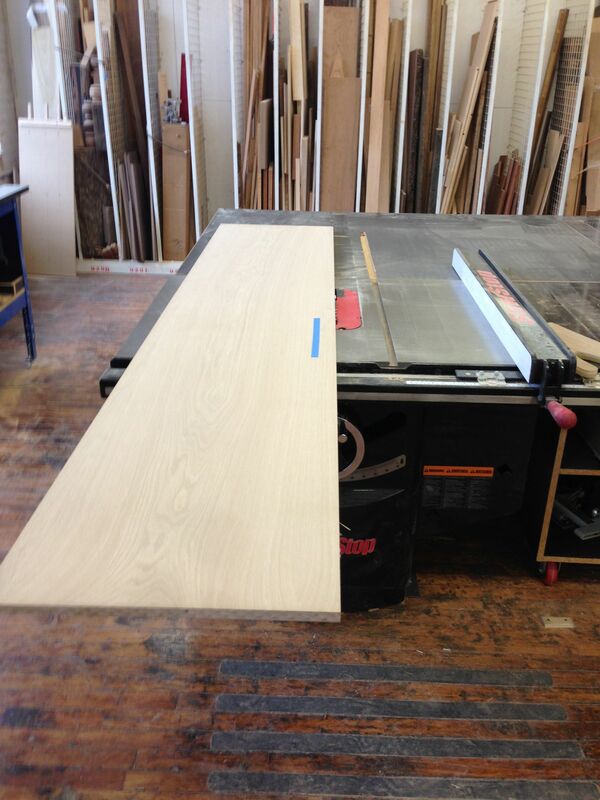 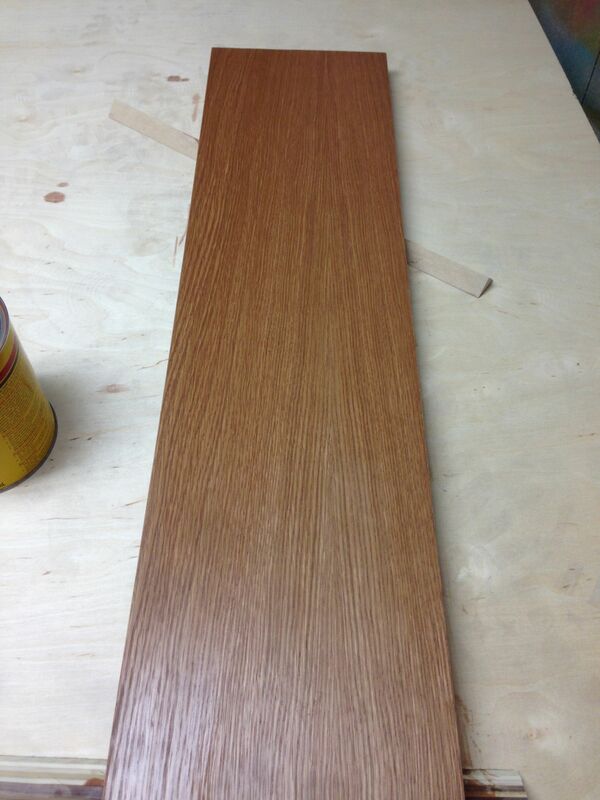 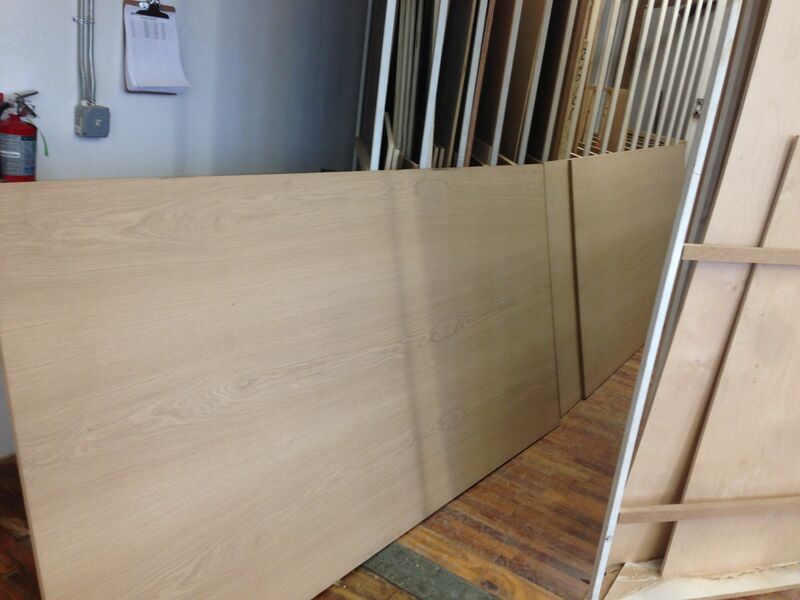 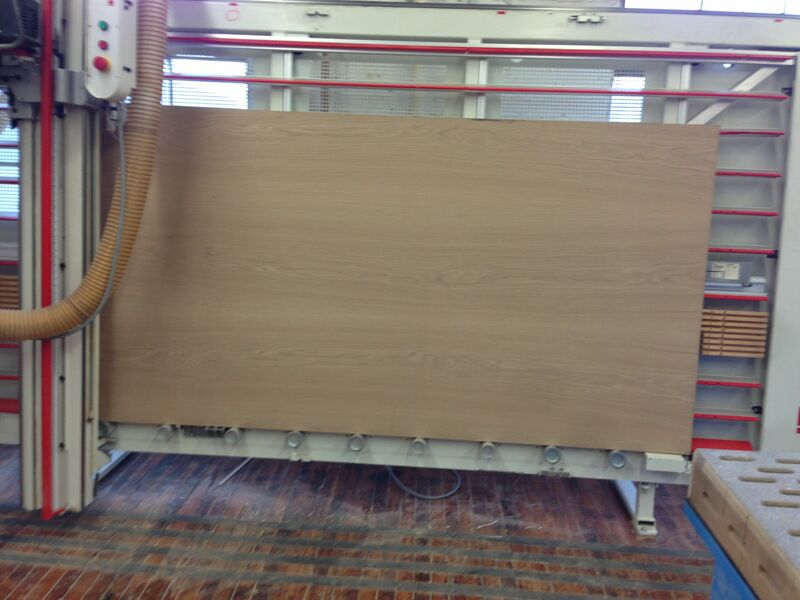 The client’s kitchen has oak veneered doors and they wanted to carry that into the rest of the furniture. 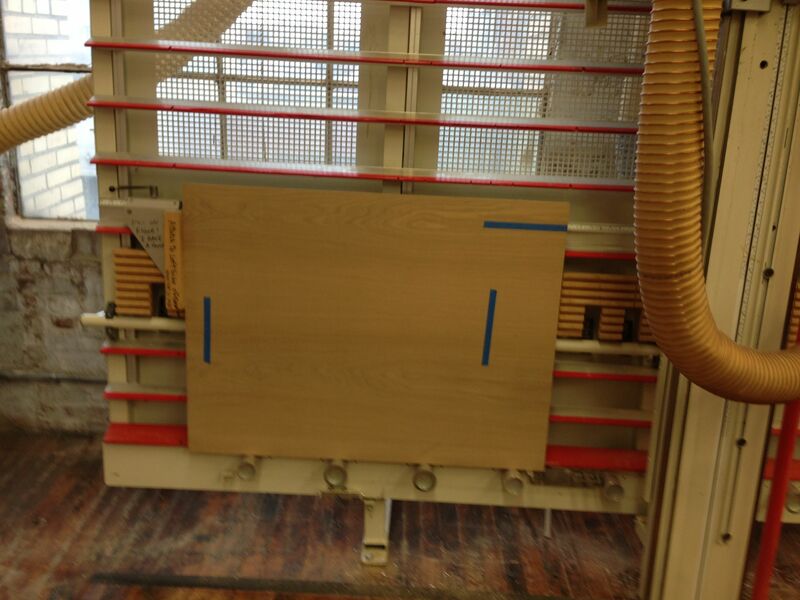 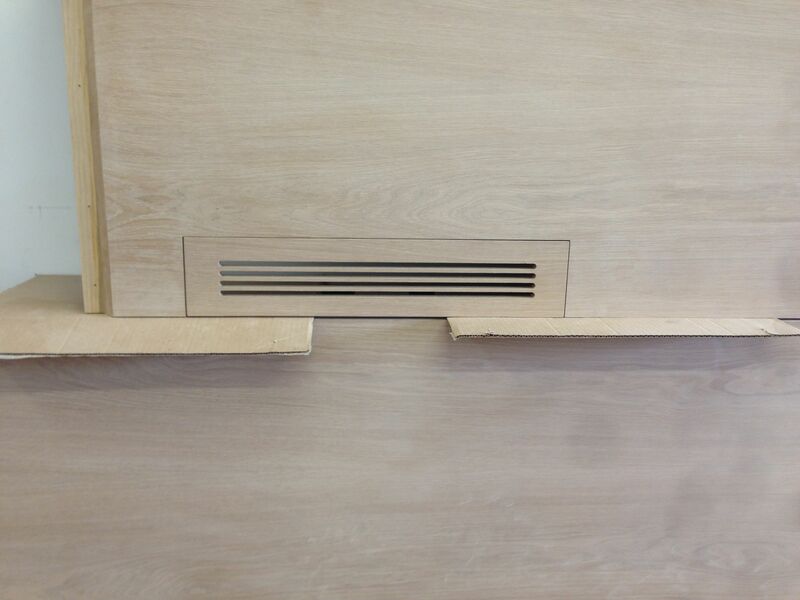 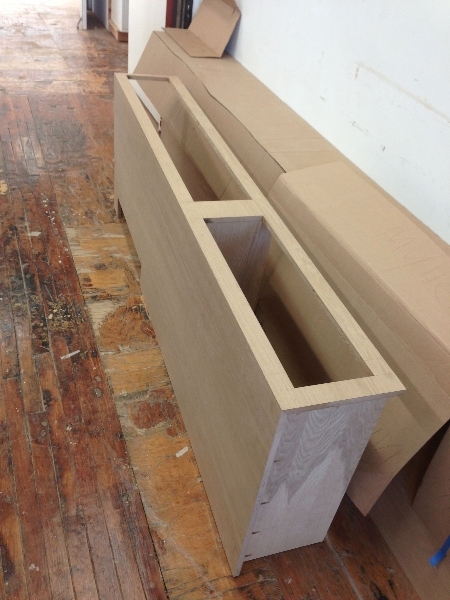 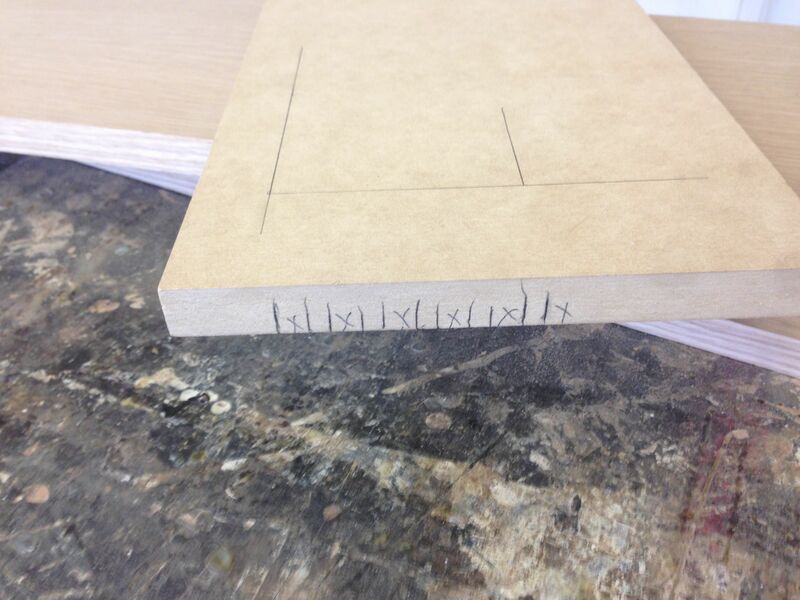 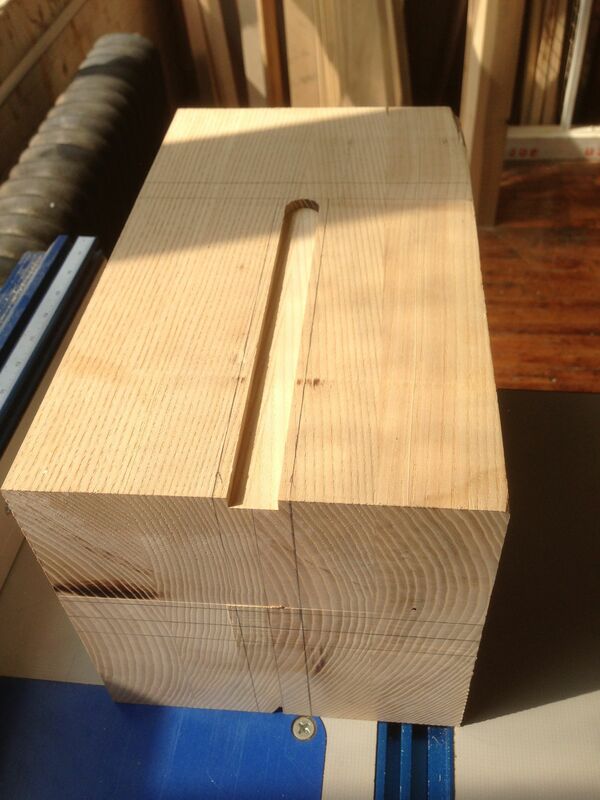 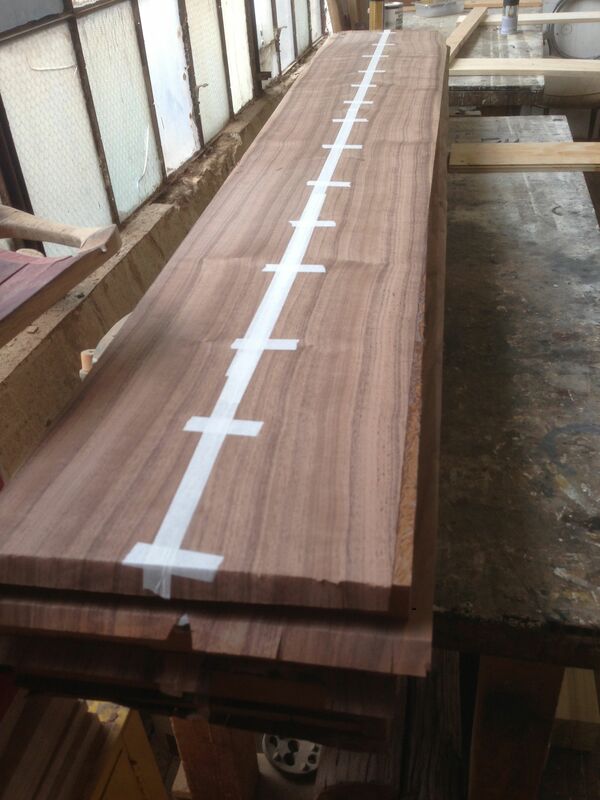 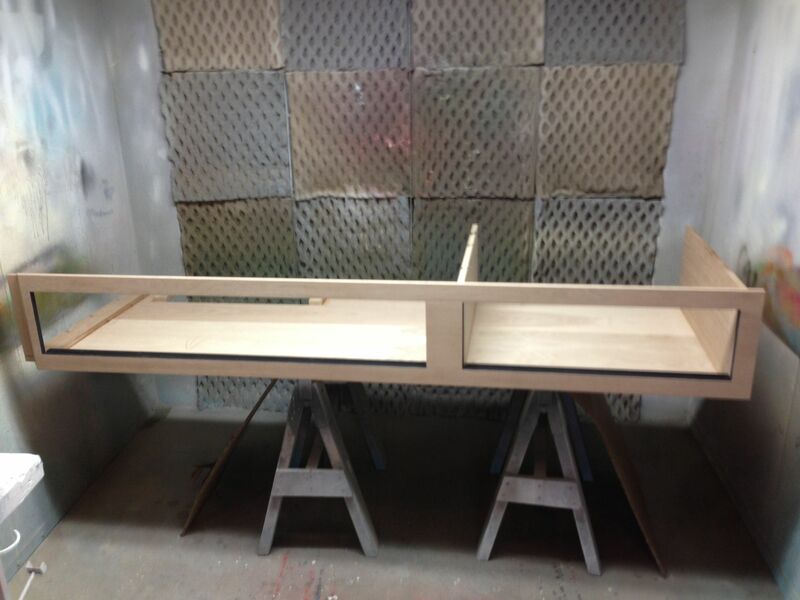 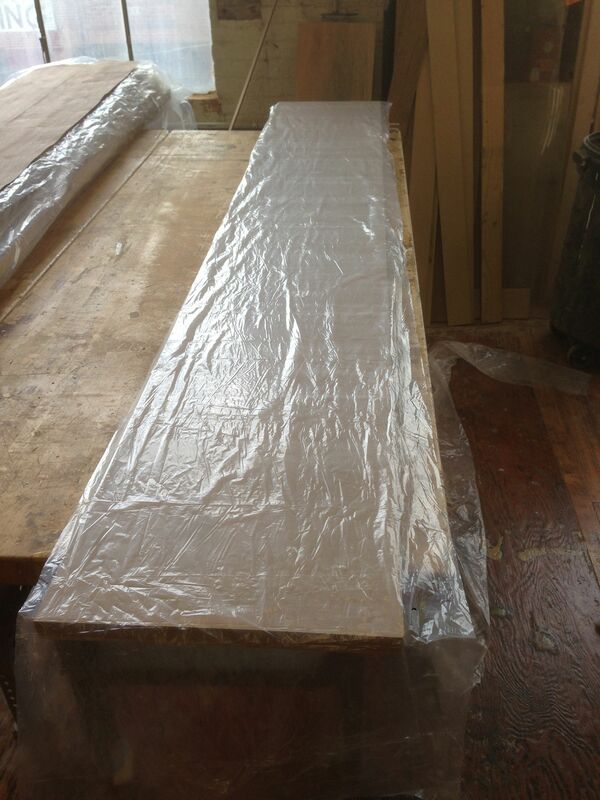 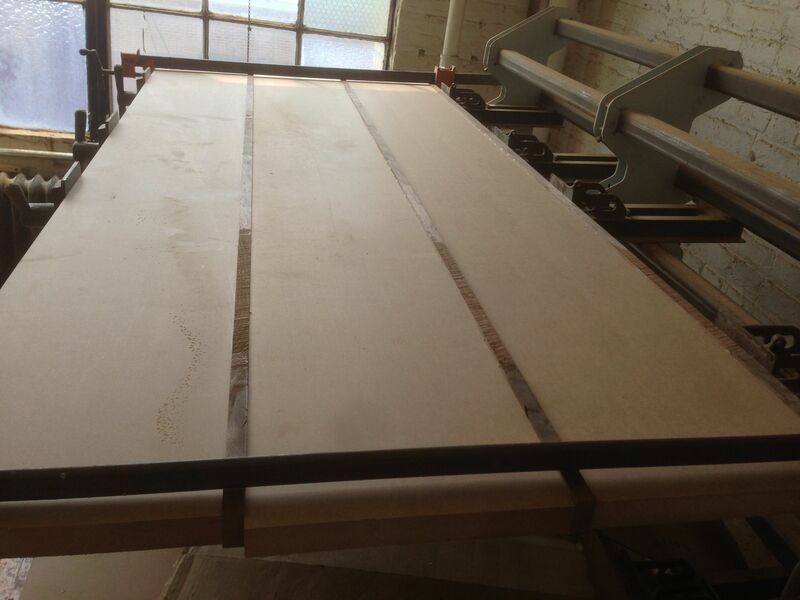 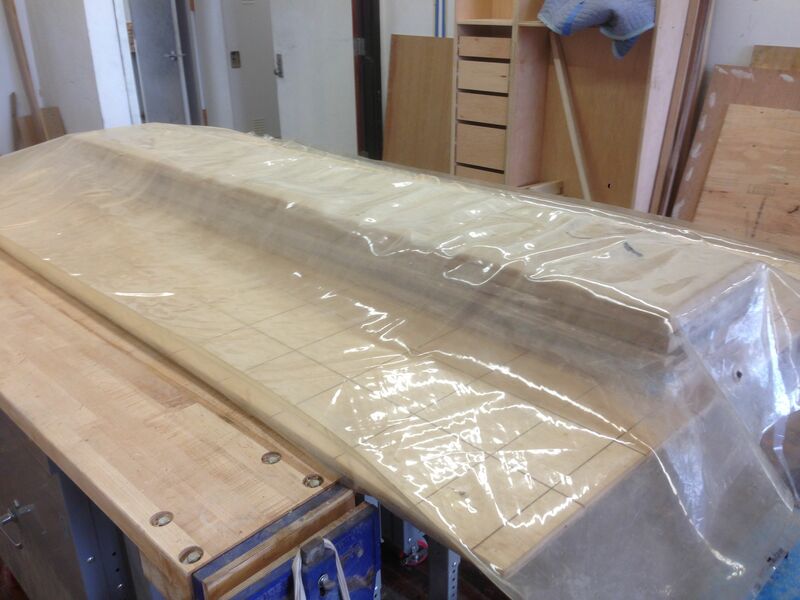 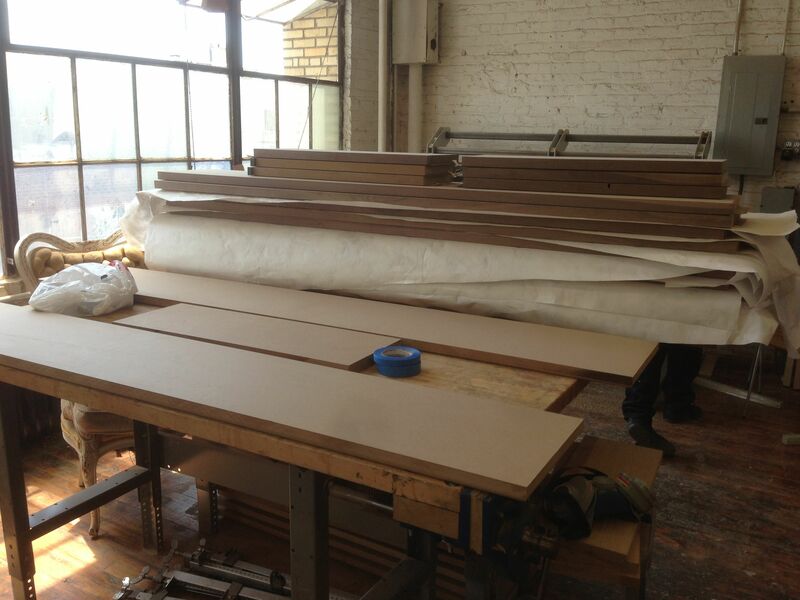 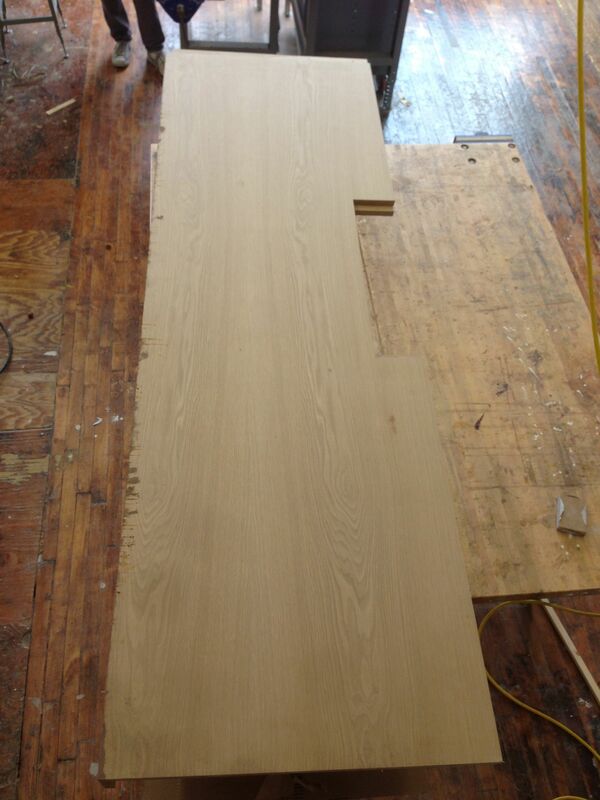 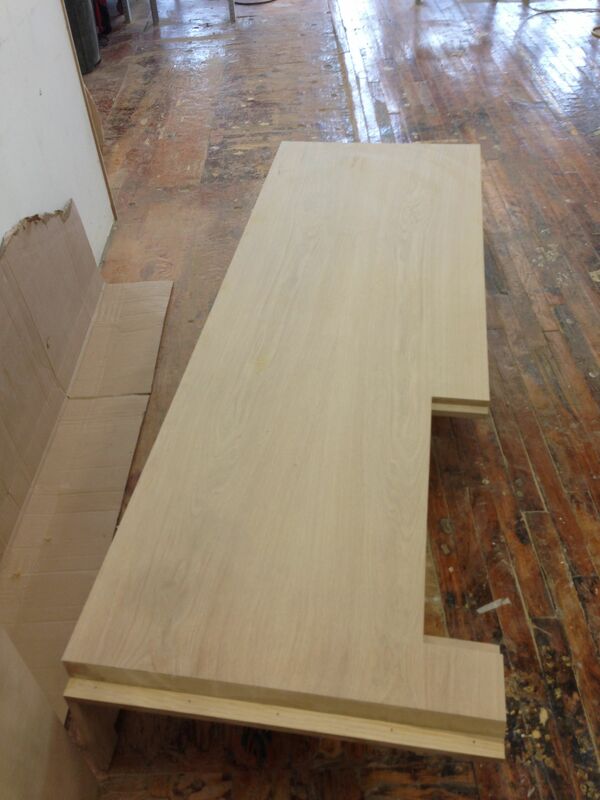 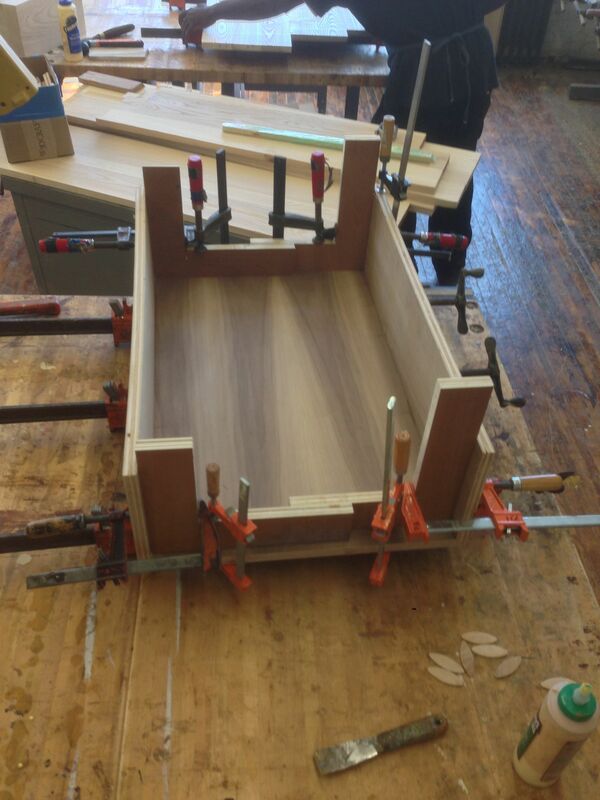 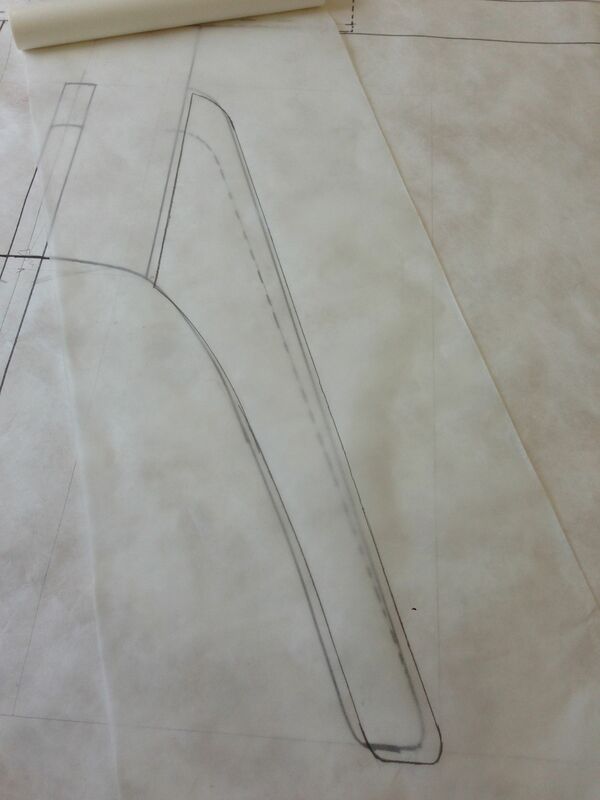 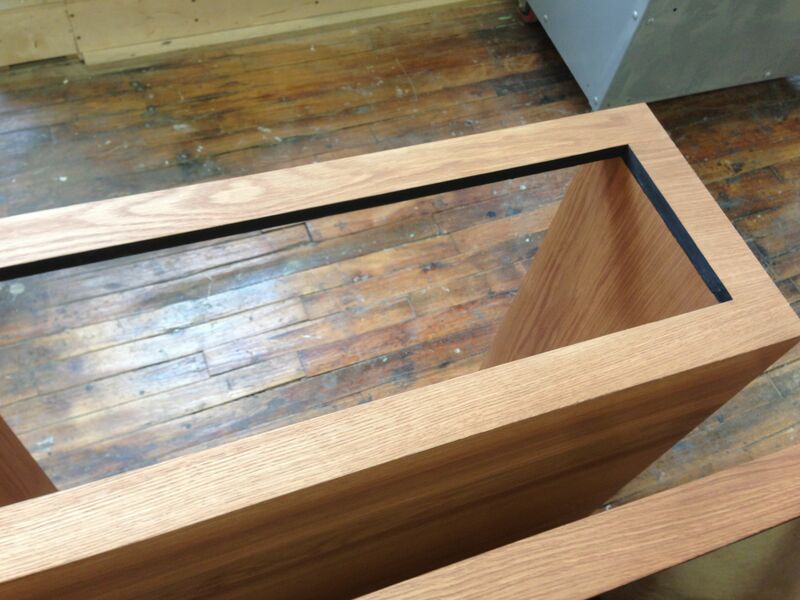 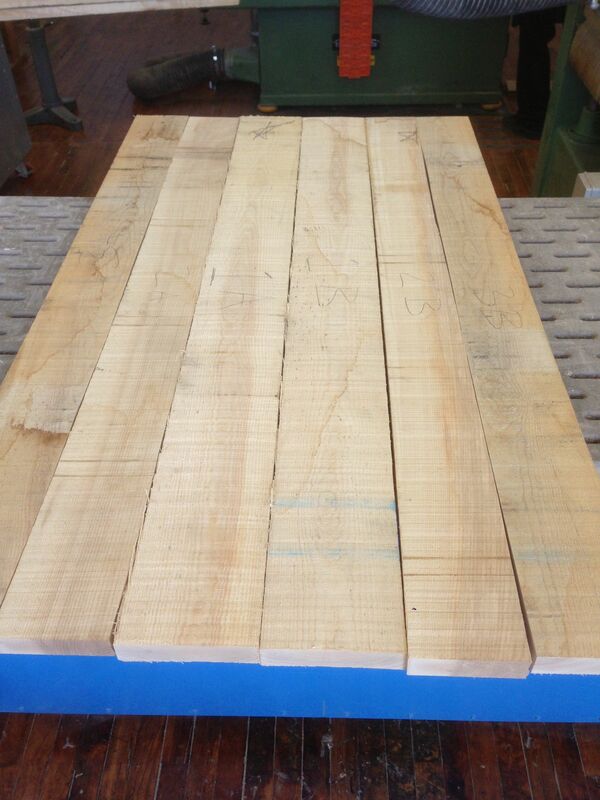 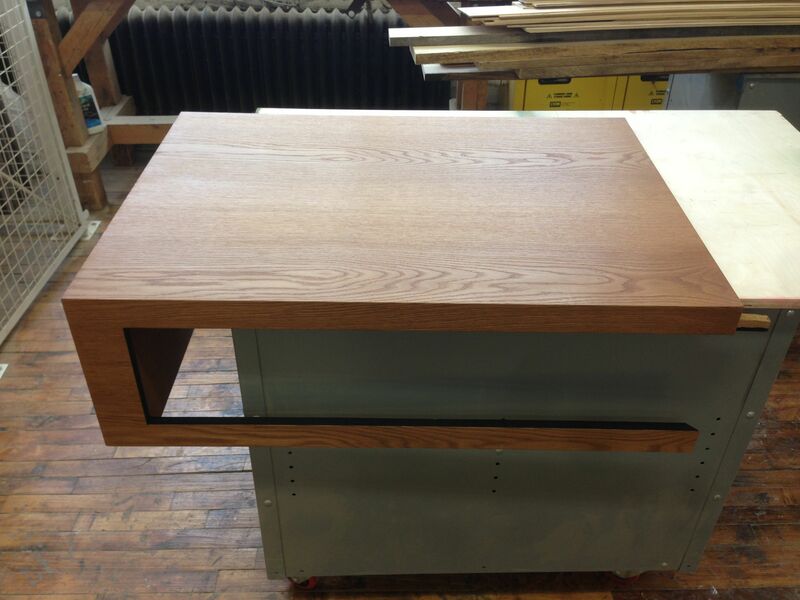 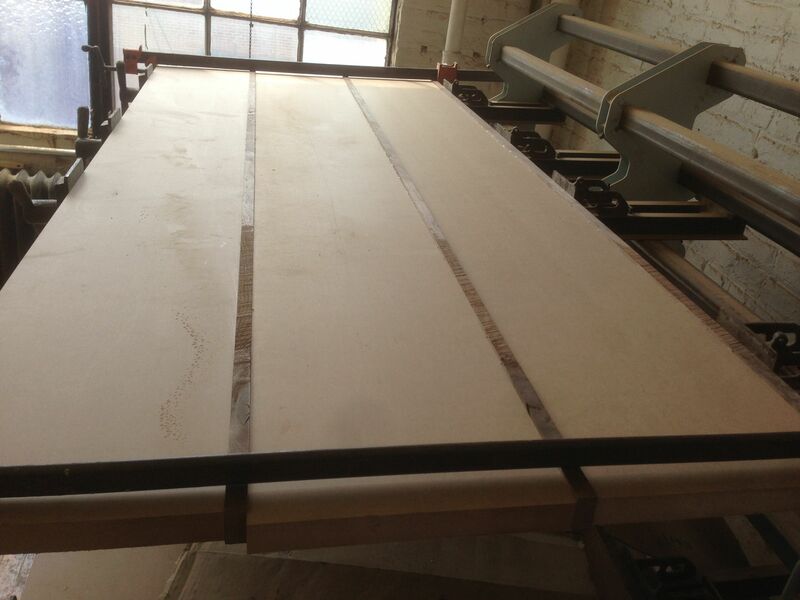 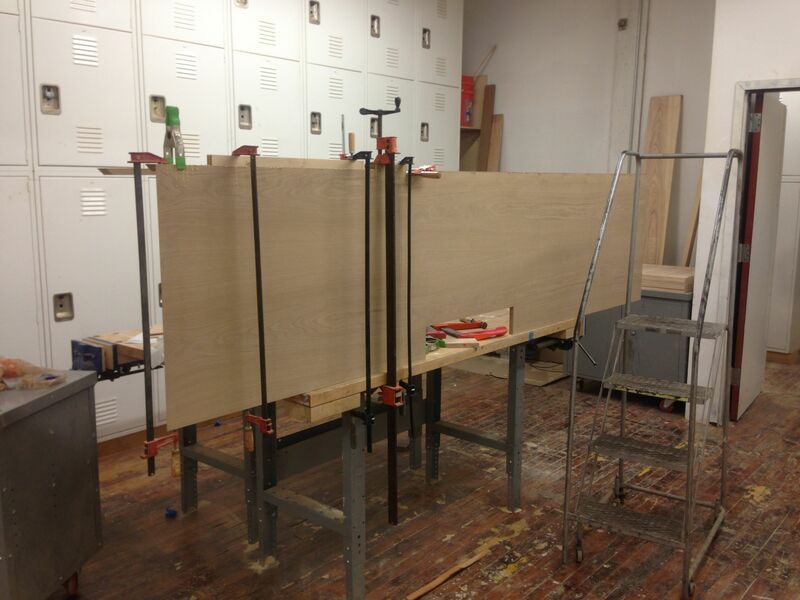 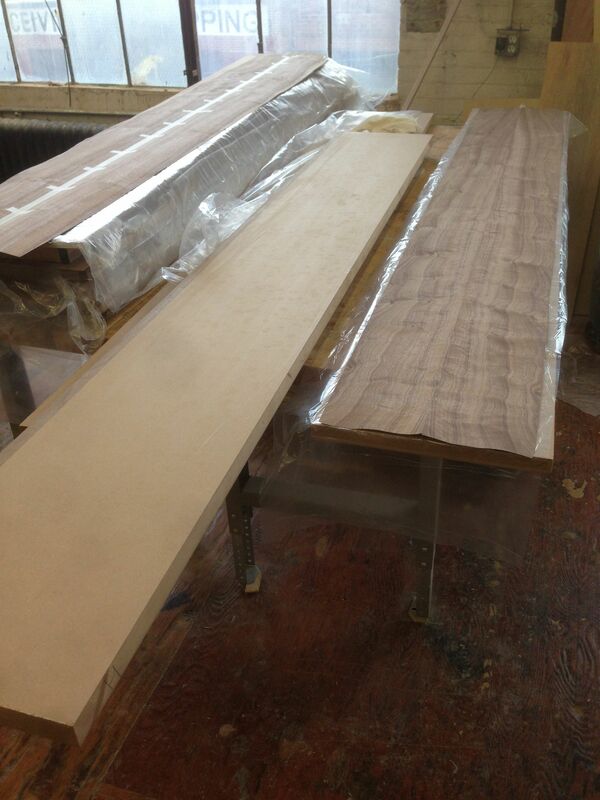 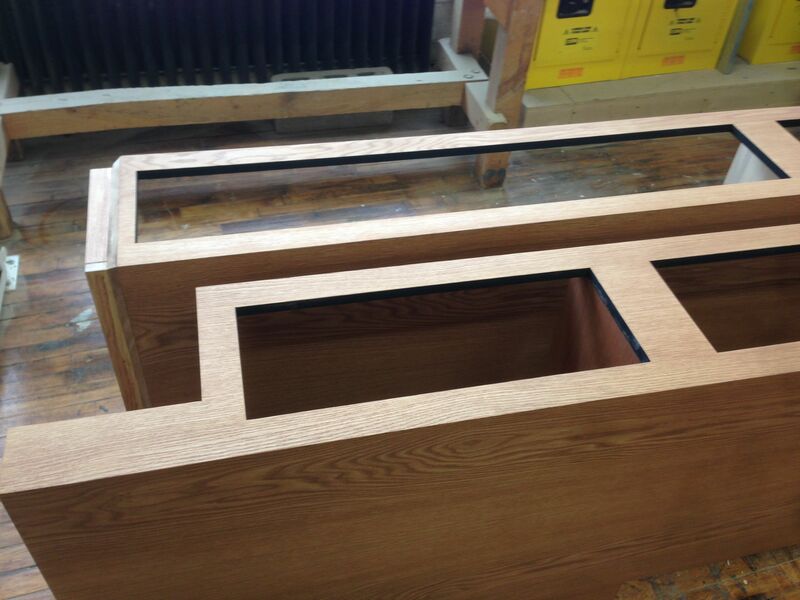 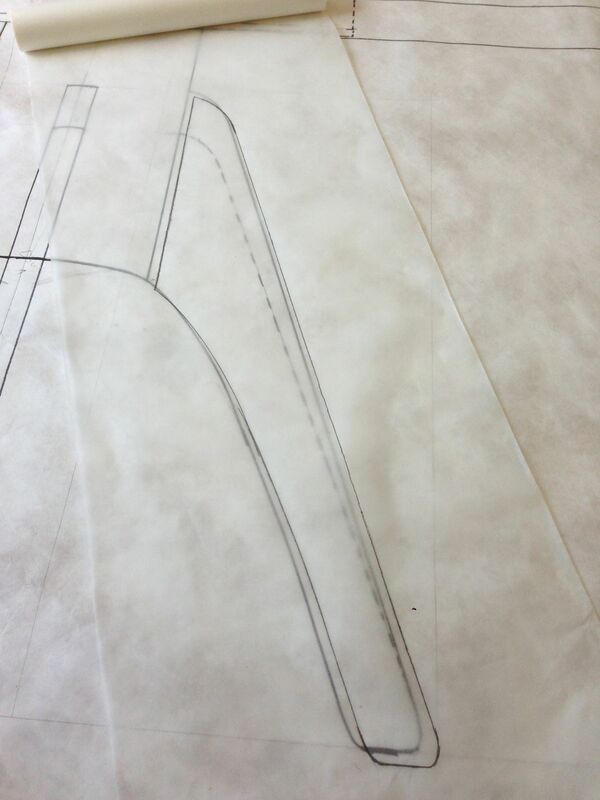 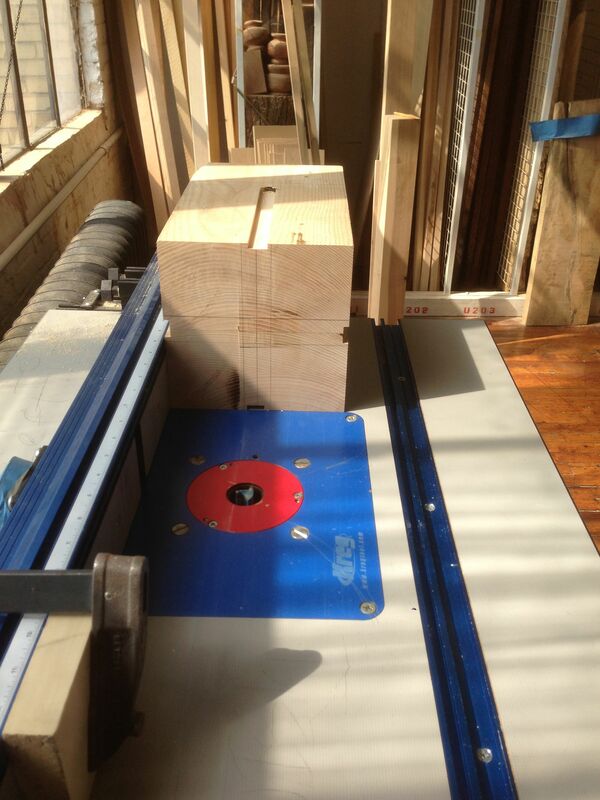 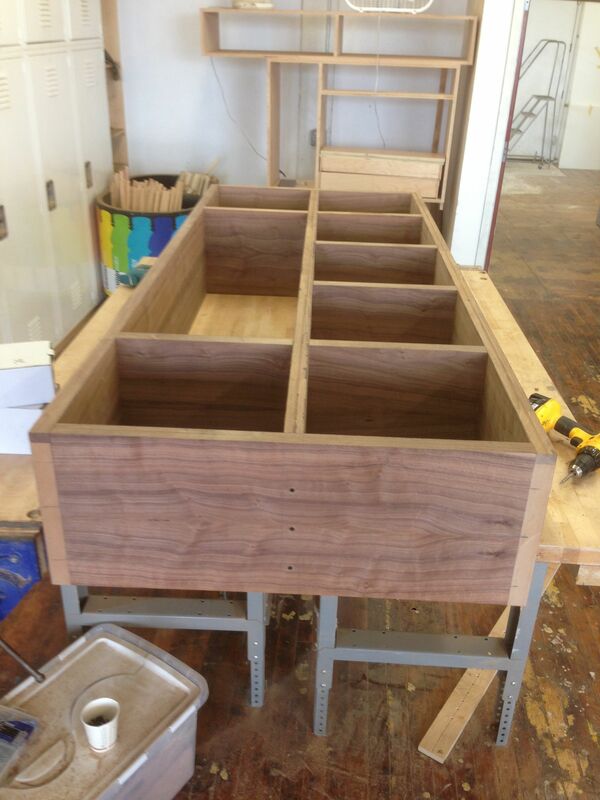 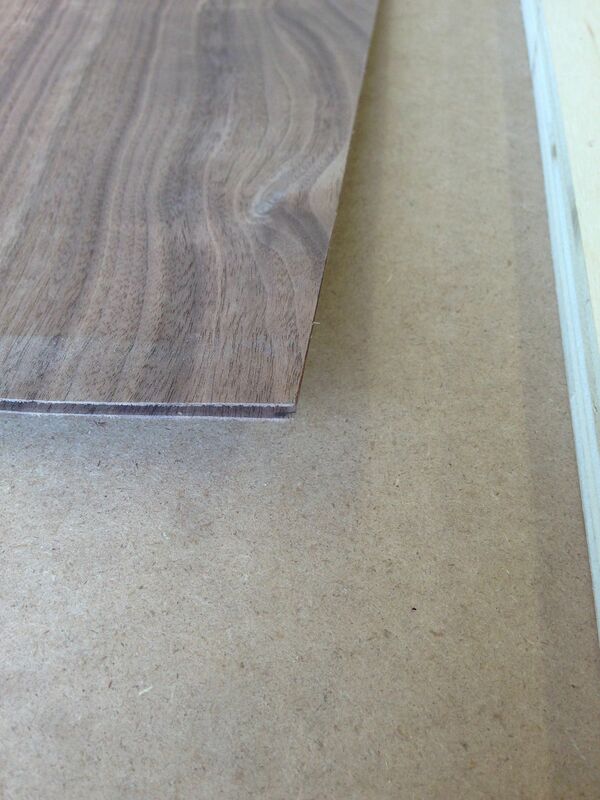 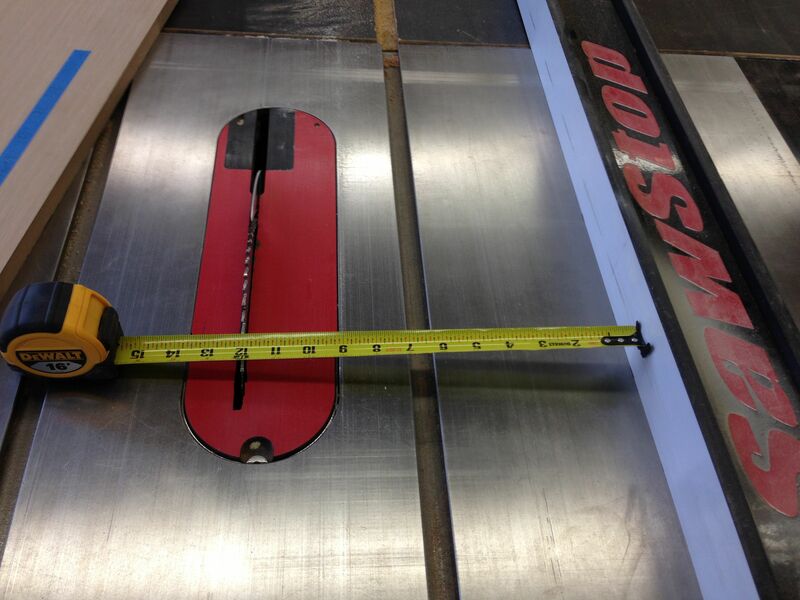 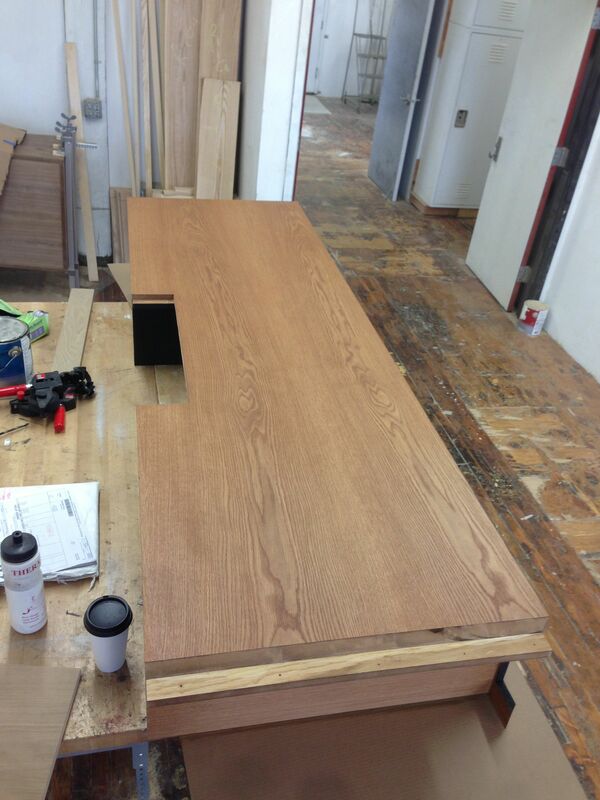 The cover will be made and delivered in three pieces and assembled on site. 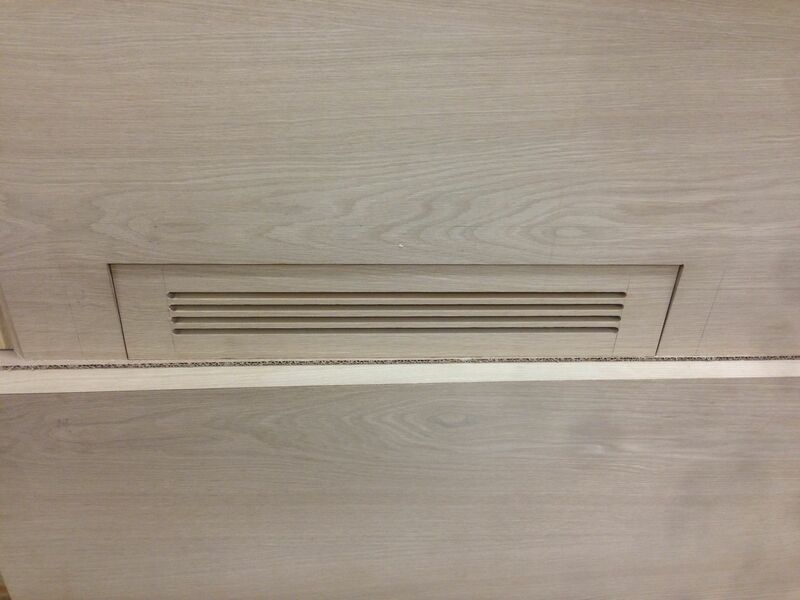 In order to have access to the radiators in case of major service, they will be screwed together from the inside. 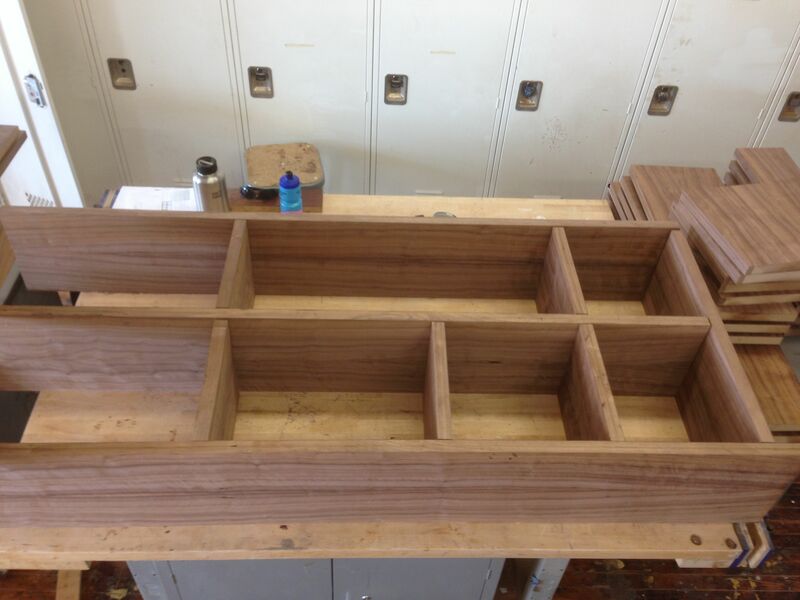 There are also five hatches across the top, three of which will be storage access. 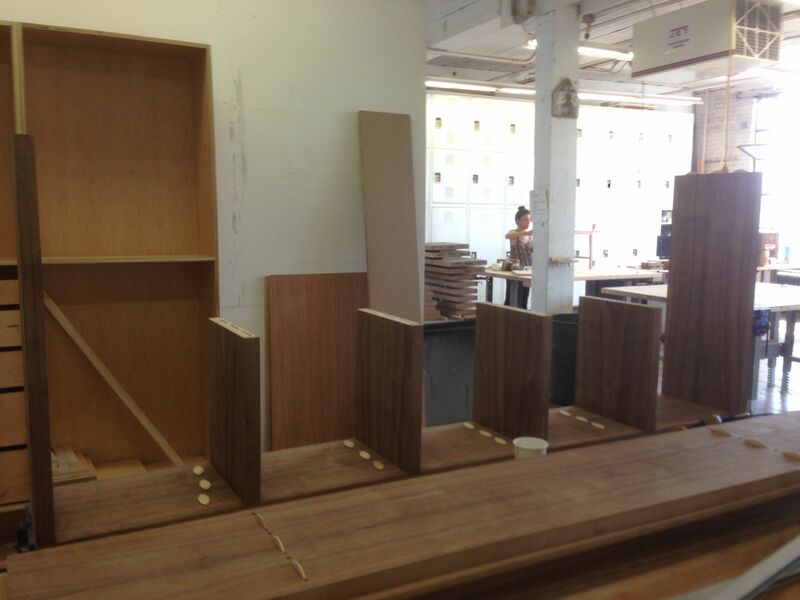 More photos to follow as the build progresses. 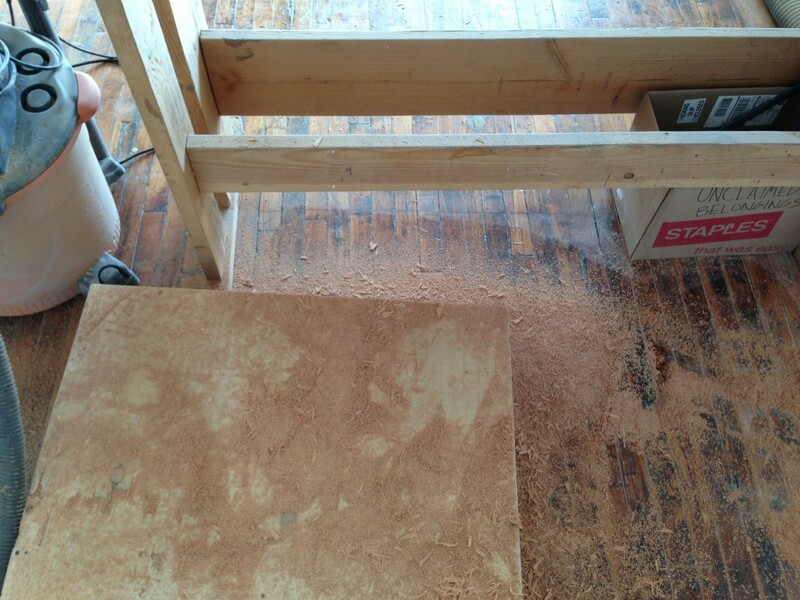 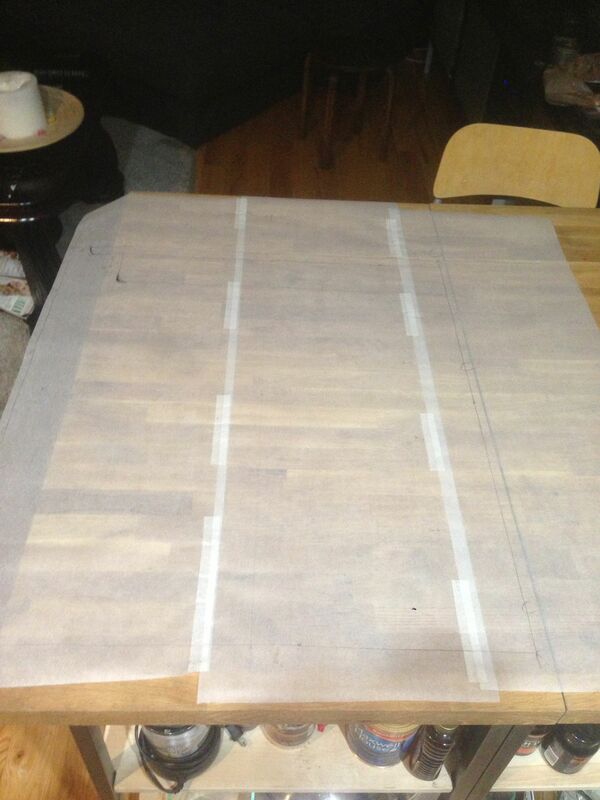 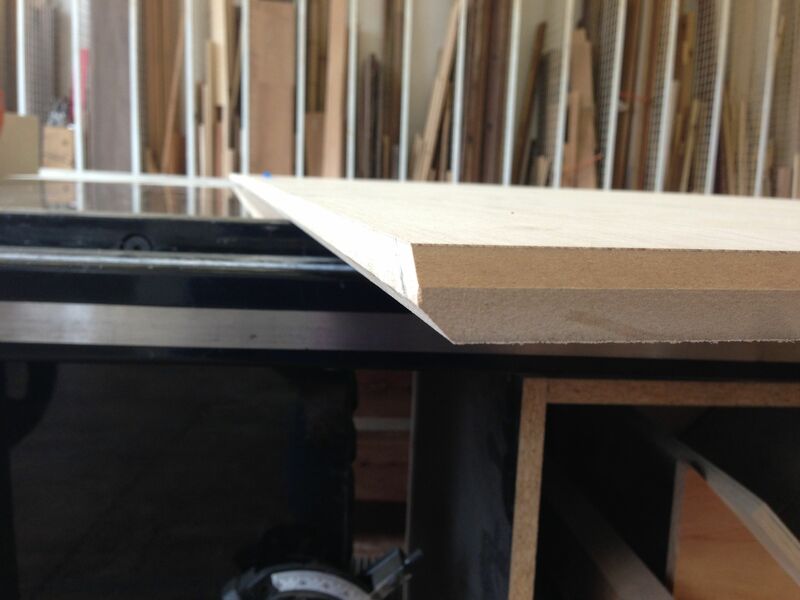 This entry was posted in Built-ins, Updates on March 3, 2013 by Matthew Mullen. 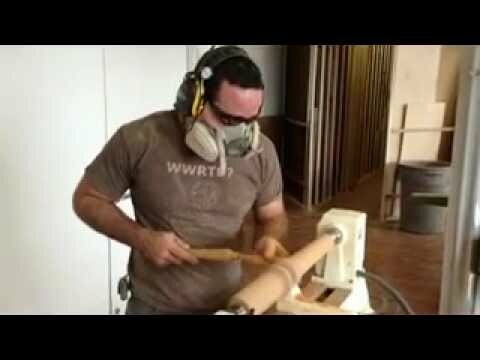 This is the video of the rocker front legs being turned on the lathe. 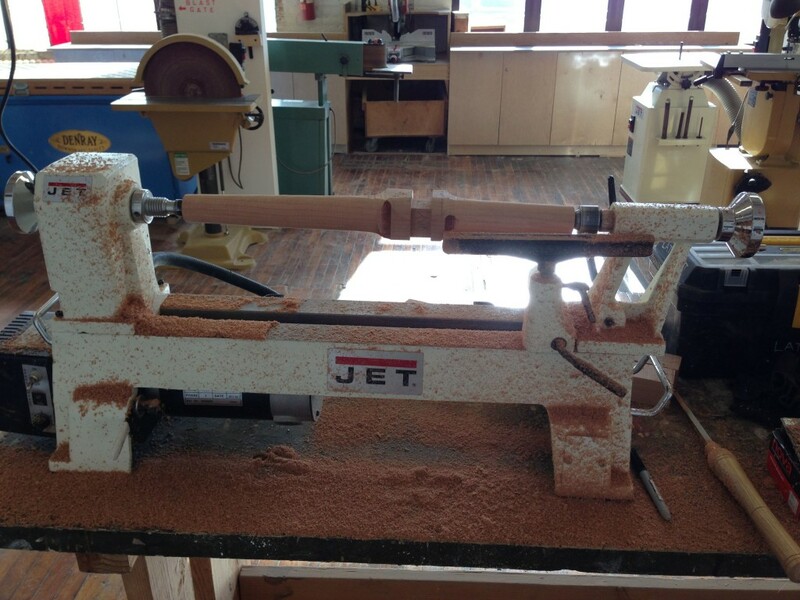 Thanks to Phil Gautreau, resident turner at 3rd Ward, for filming and getting me set up on the lathe after a seven-year hiatus. 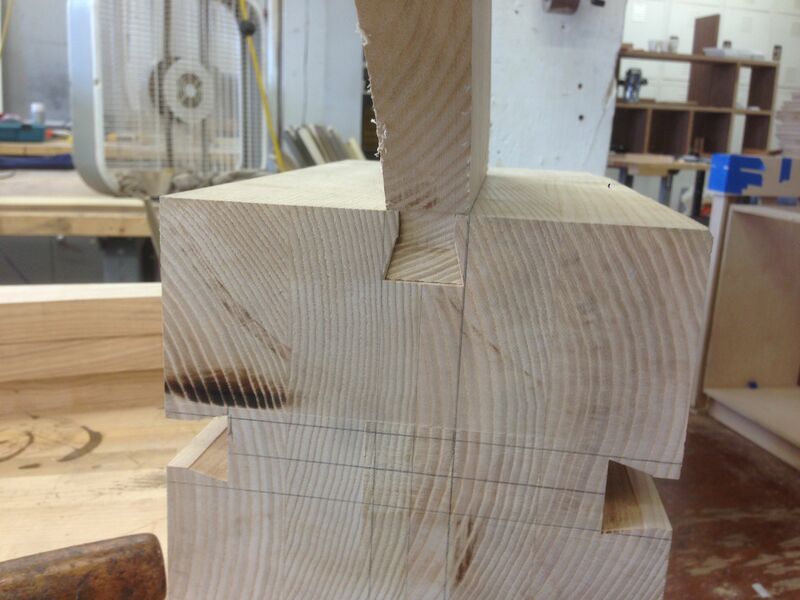 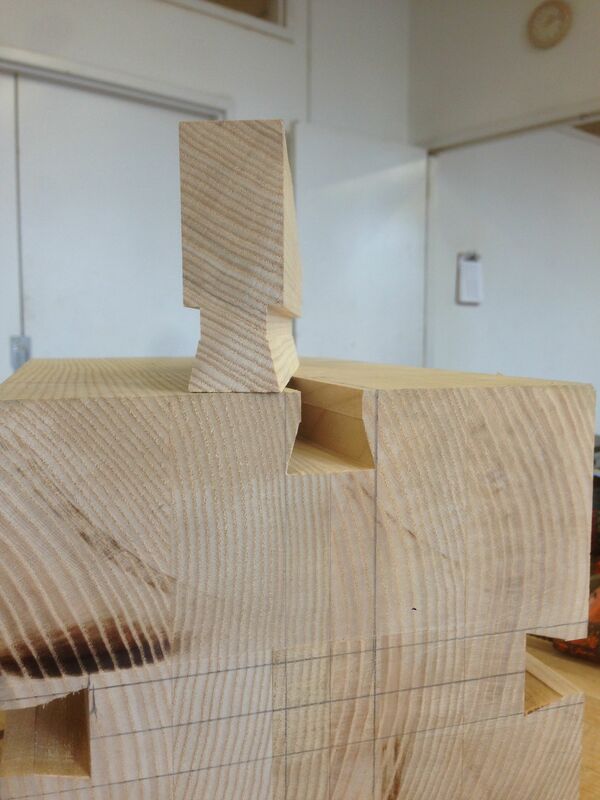 This entry was posted in Recent Work, Rocking Chair, Updates, Video Demos on January 22, 2013 by Matthew Mullen. 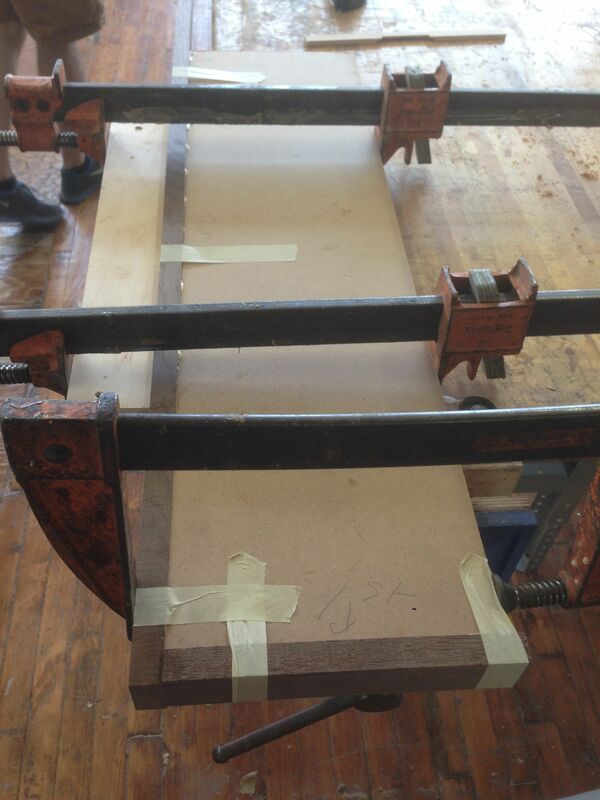 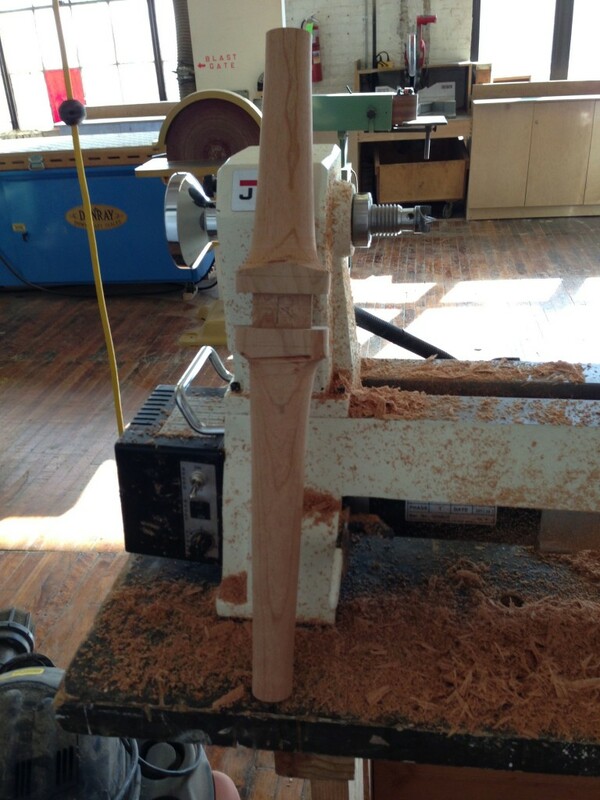 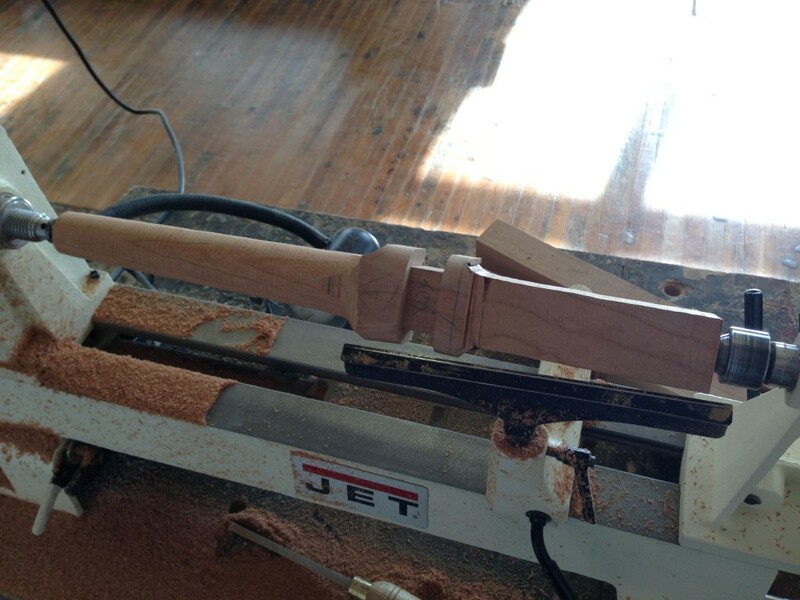 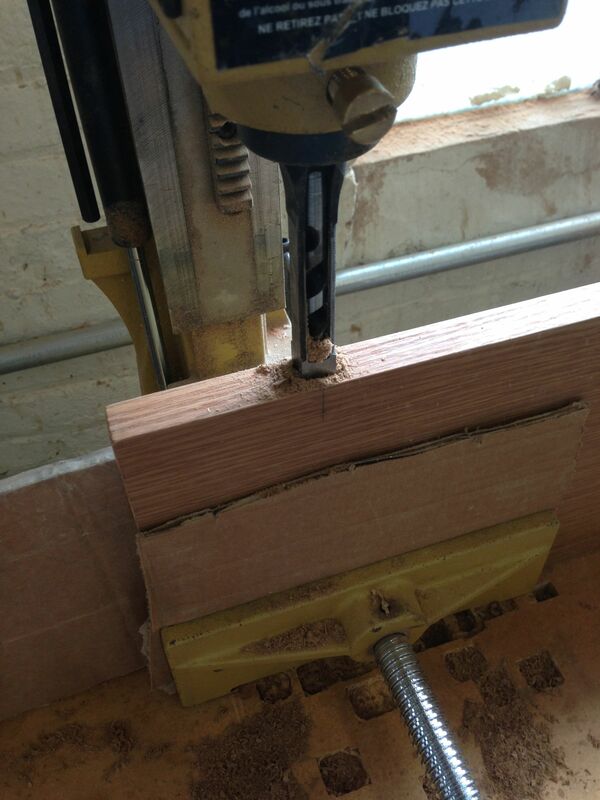 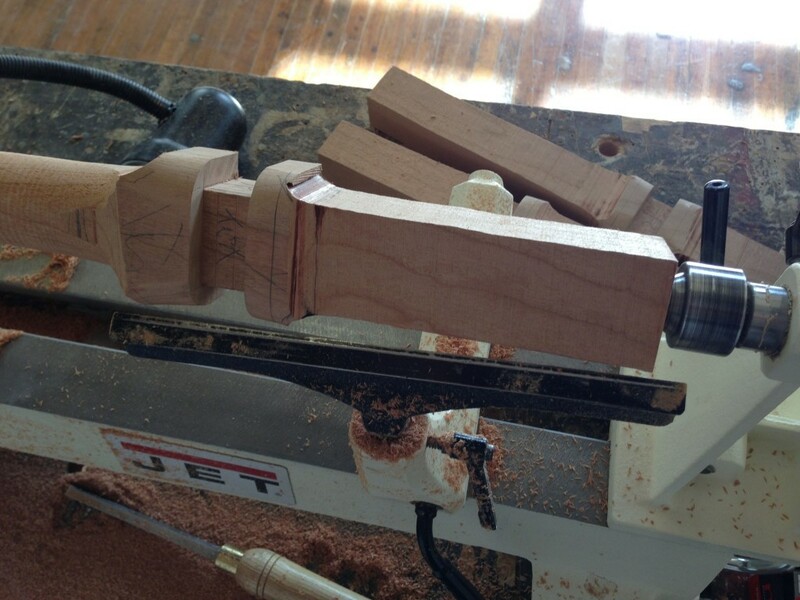 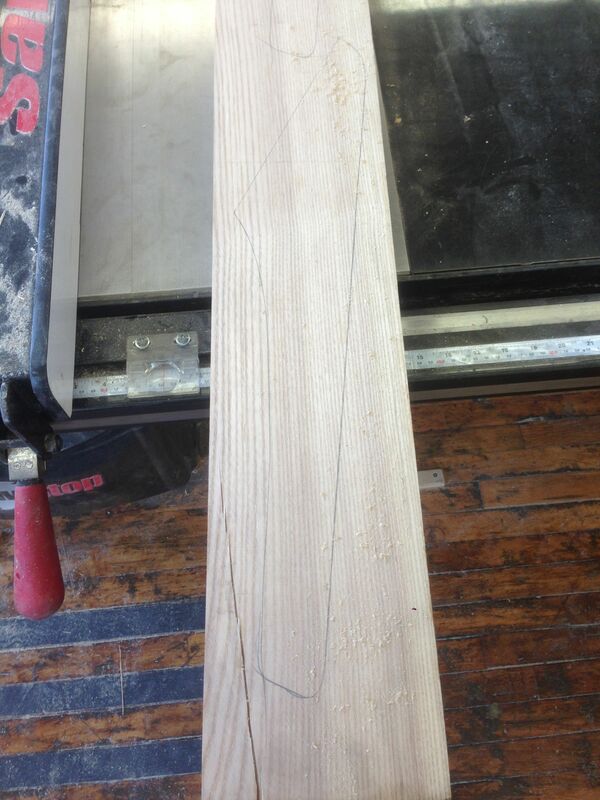 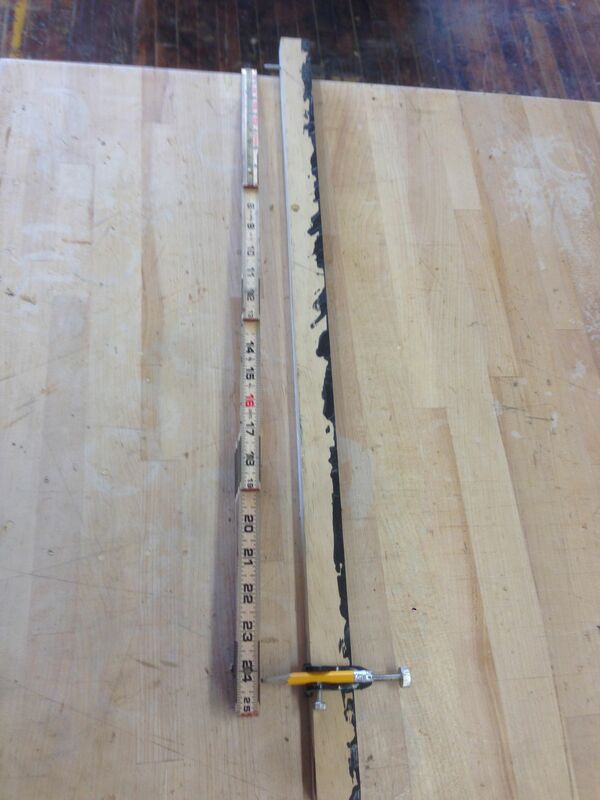 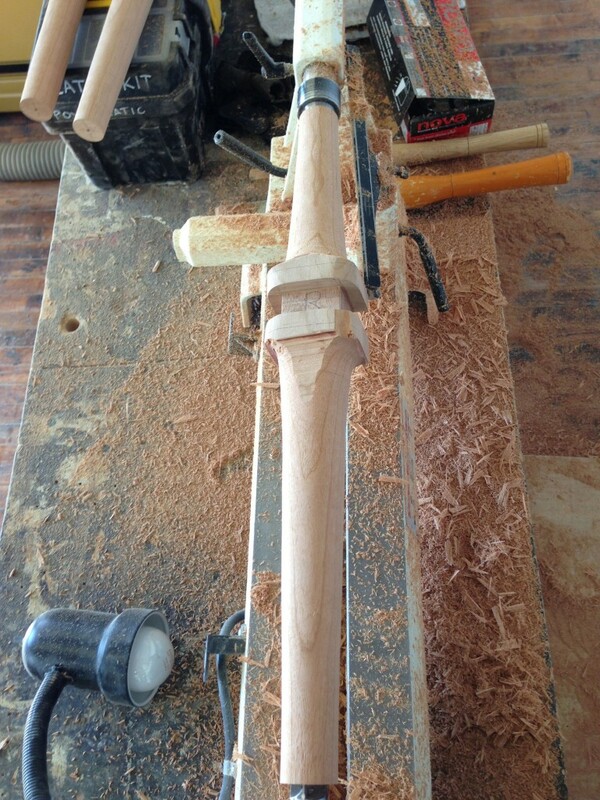 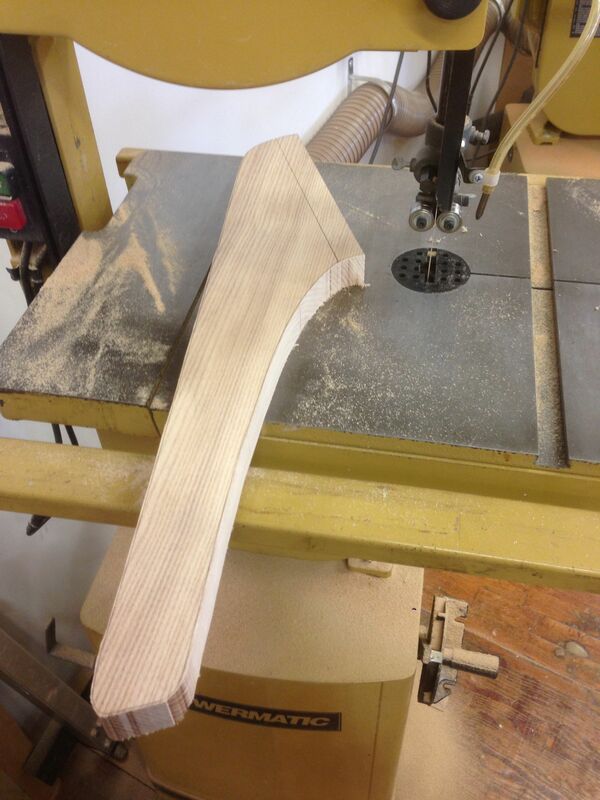 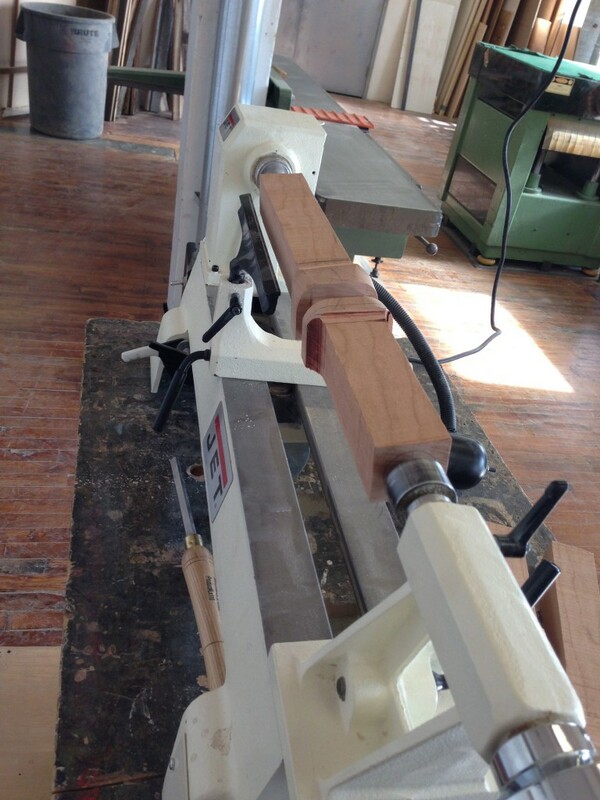 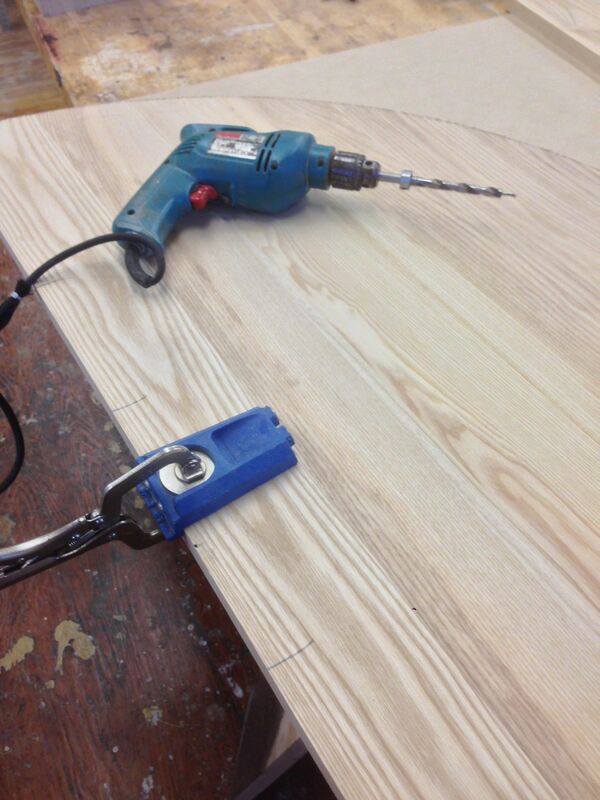 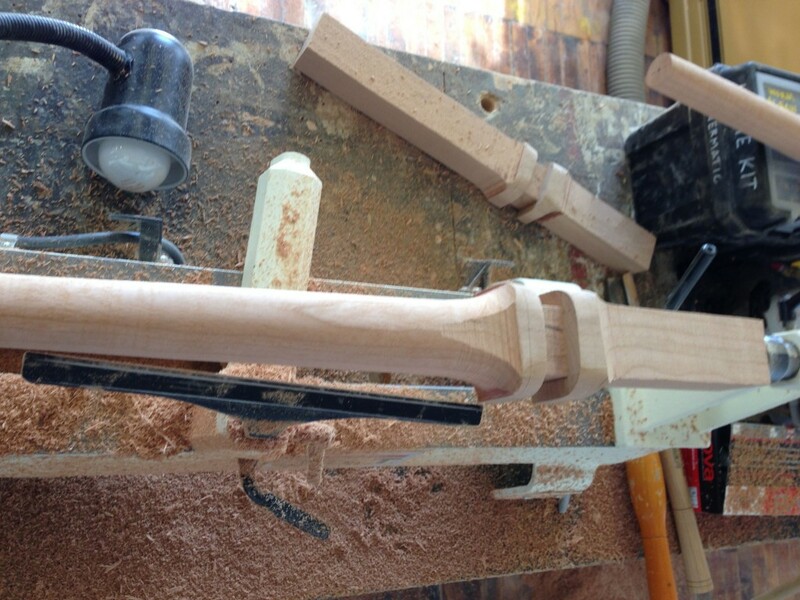 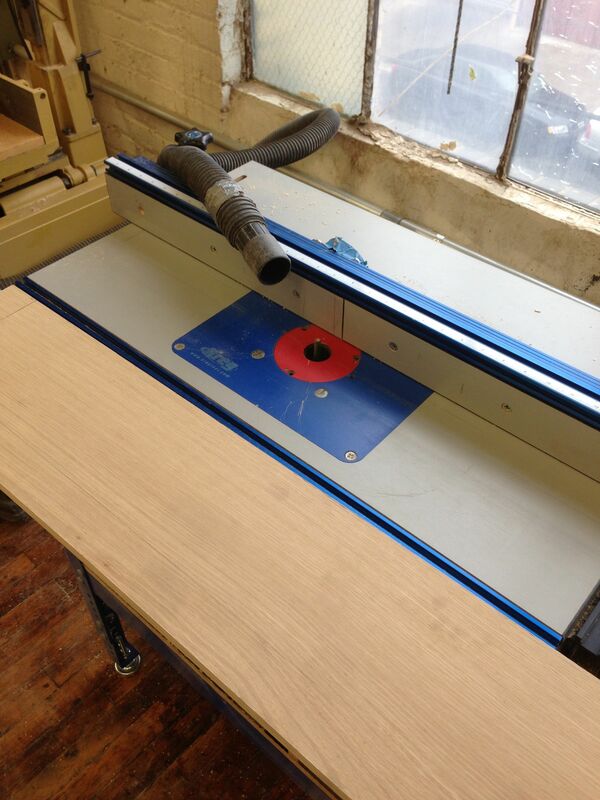 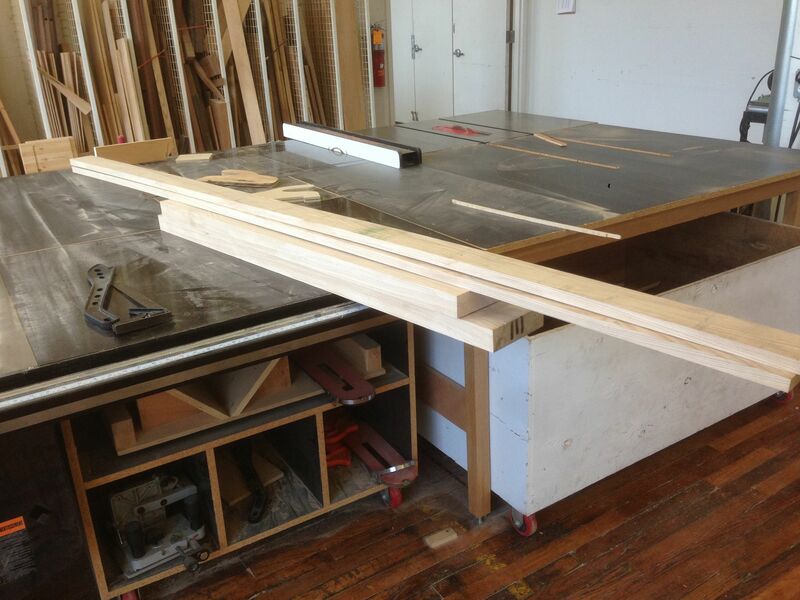 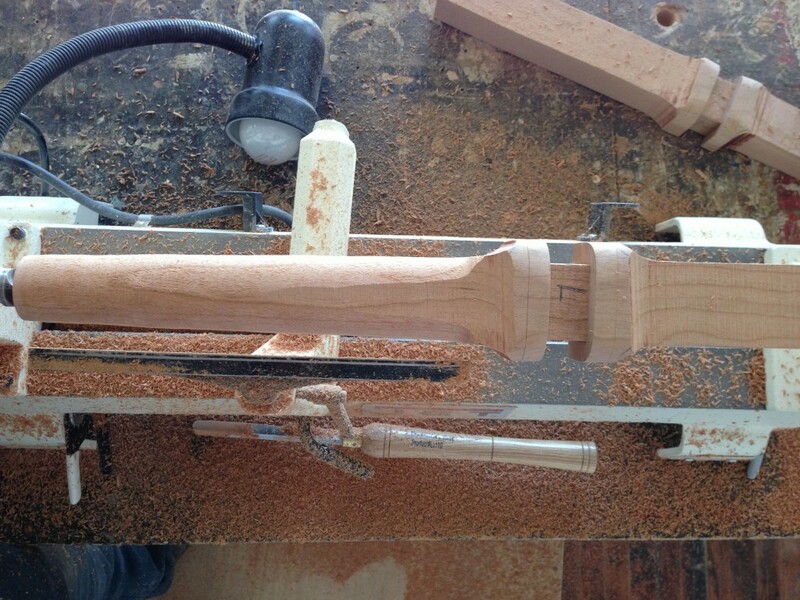 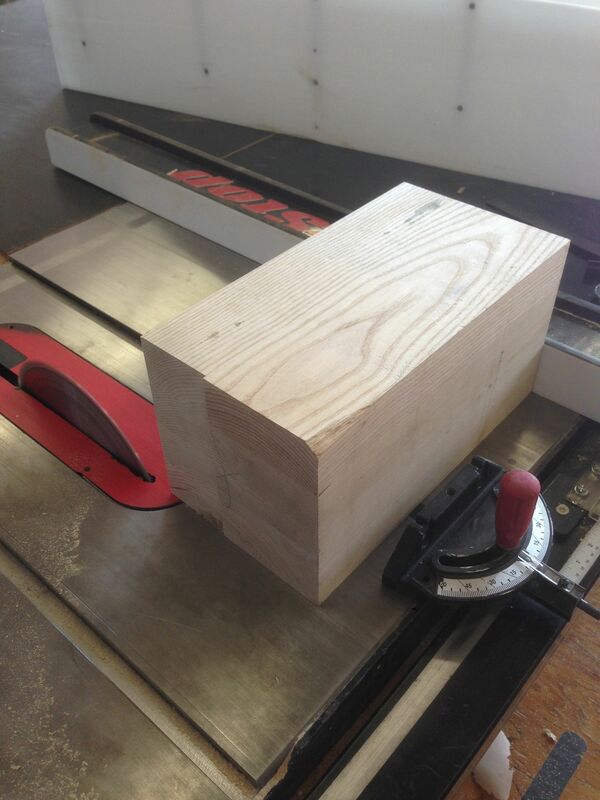 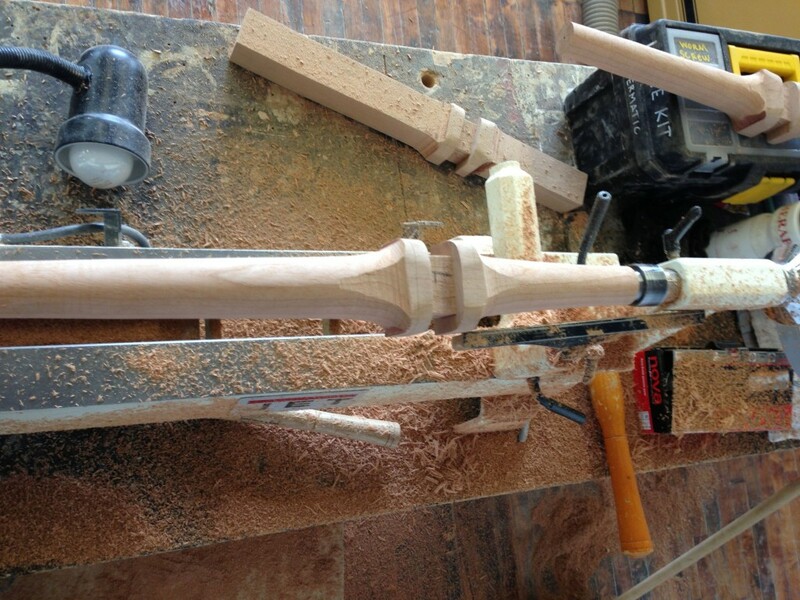 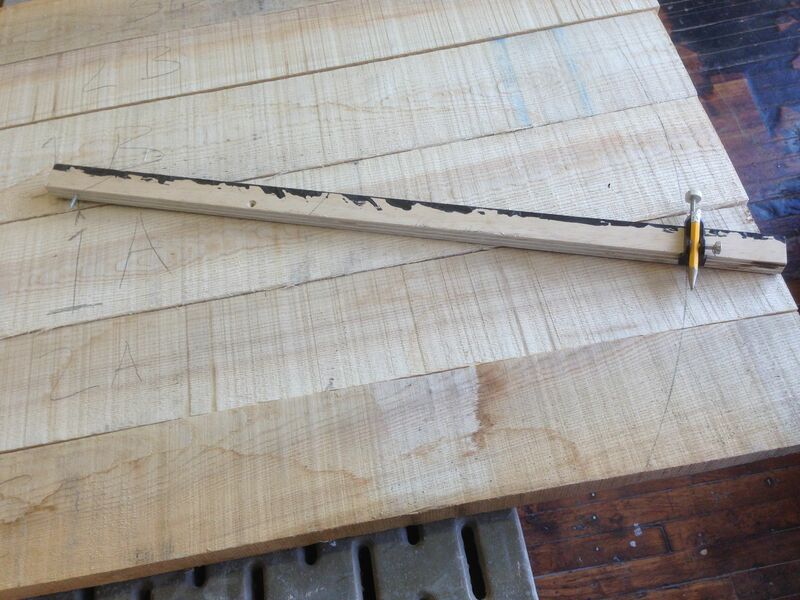 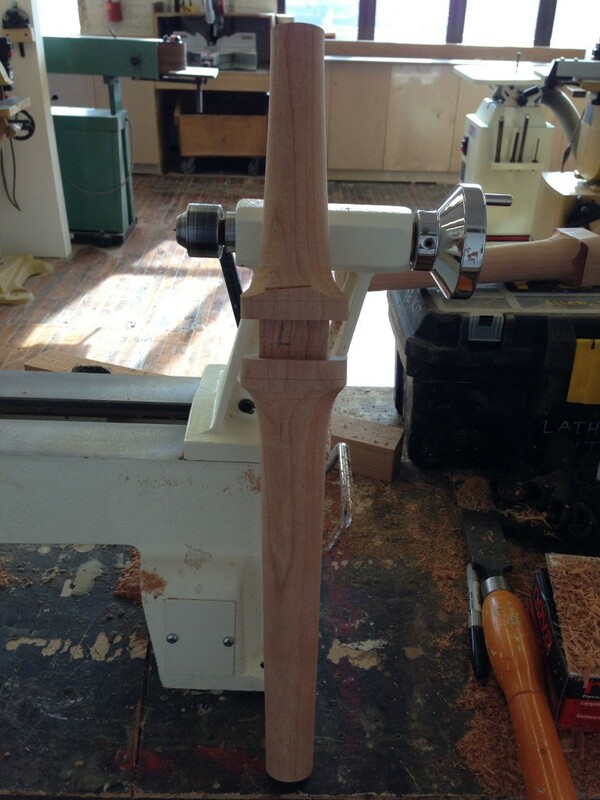 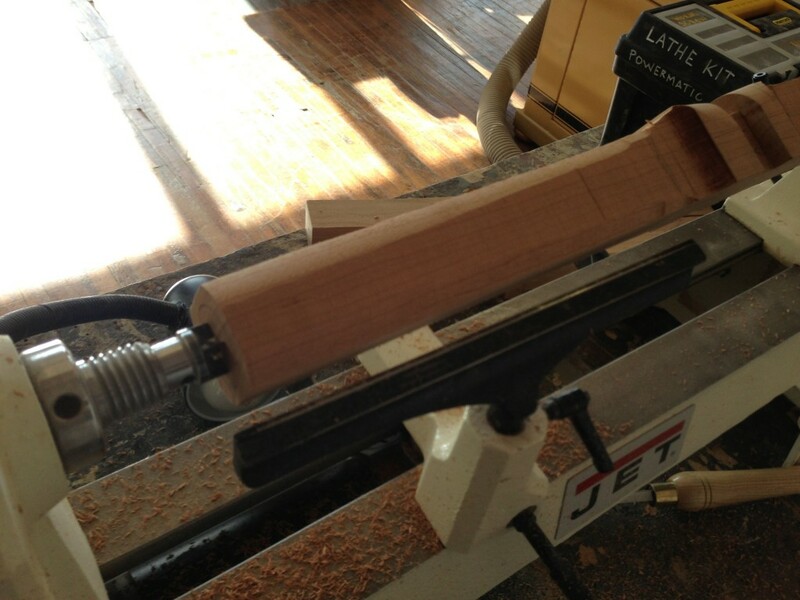 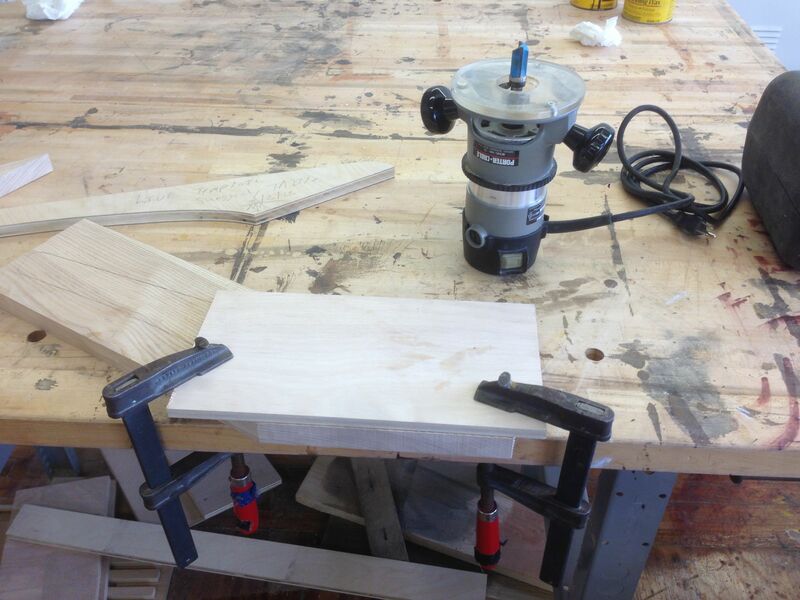 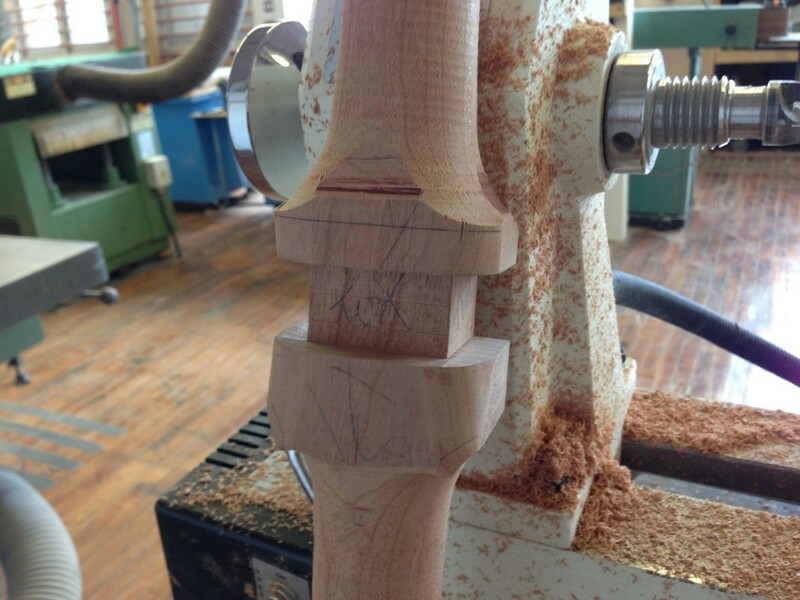 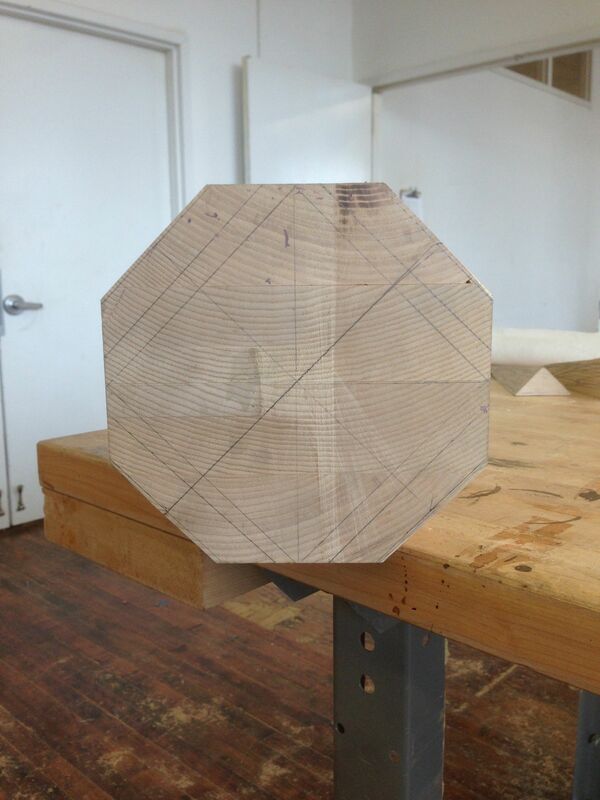 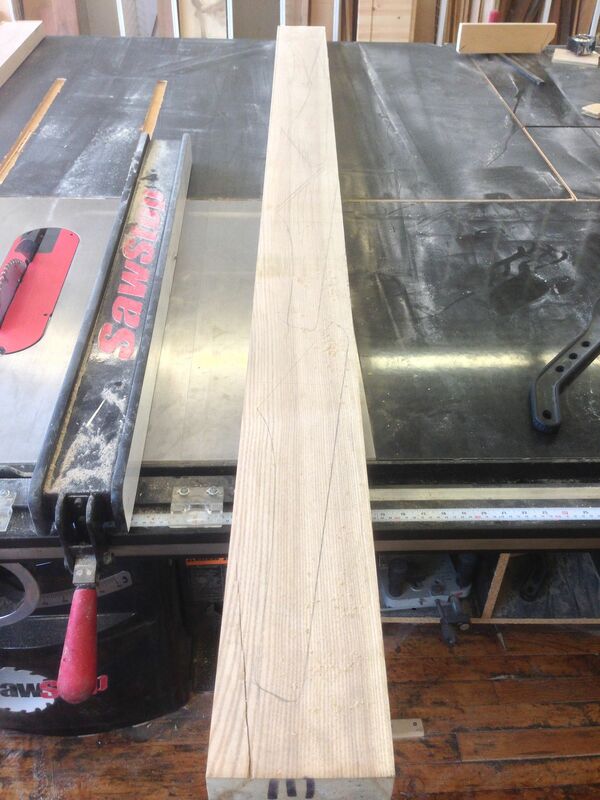 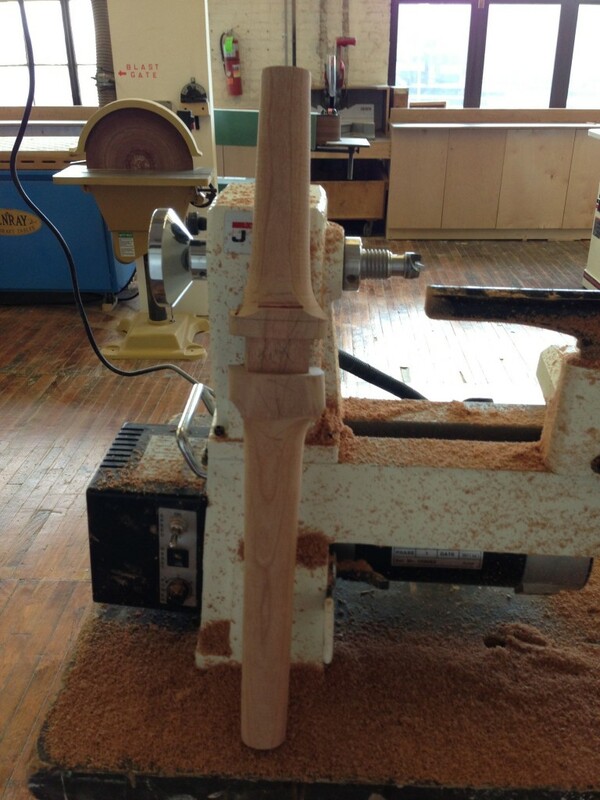 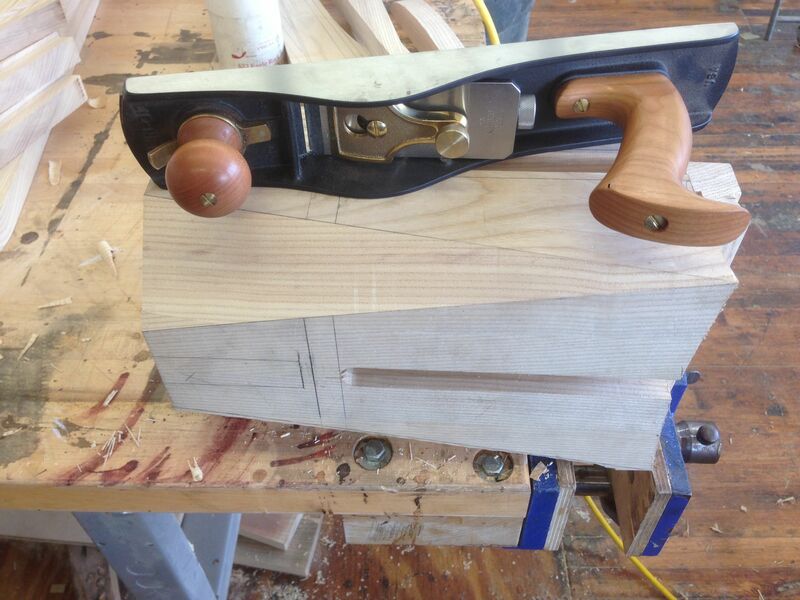 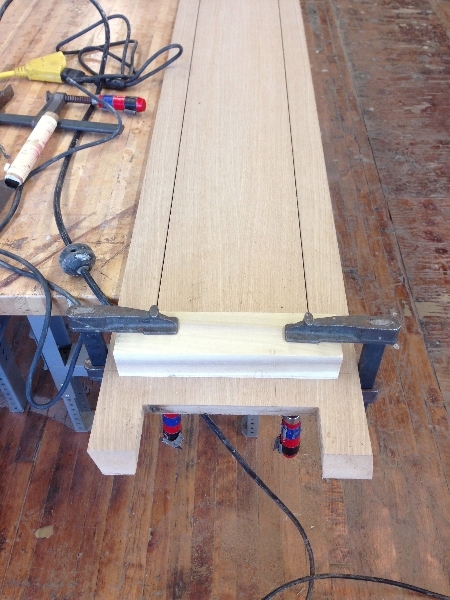 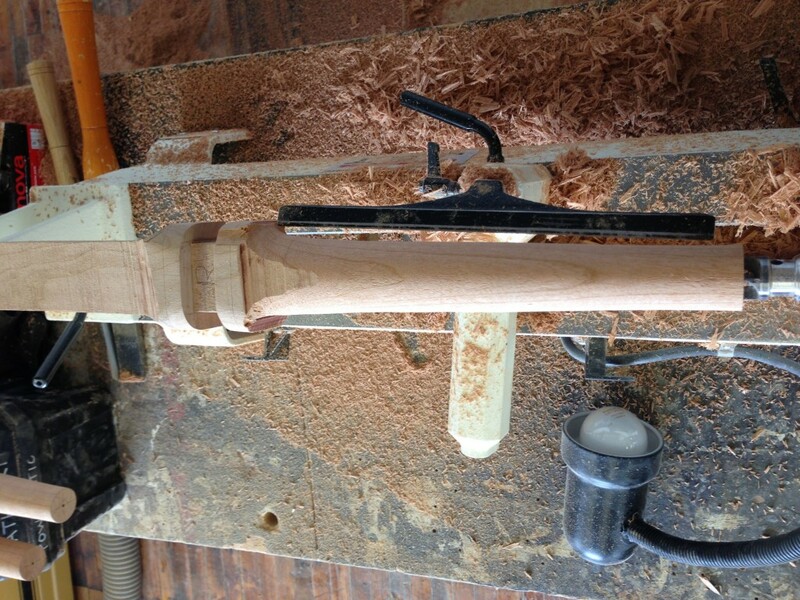 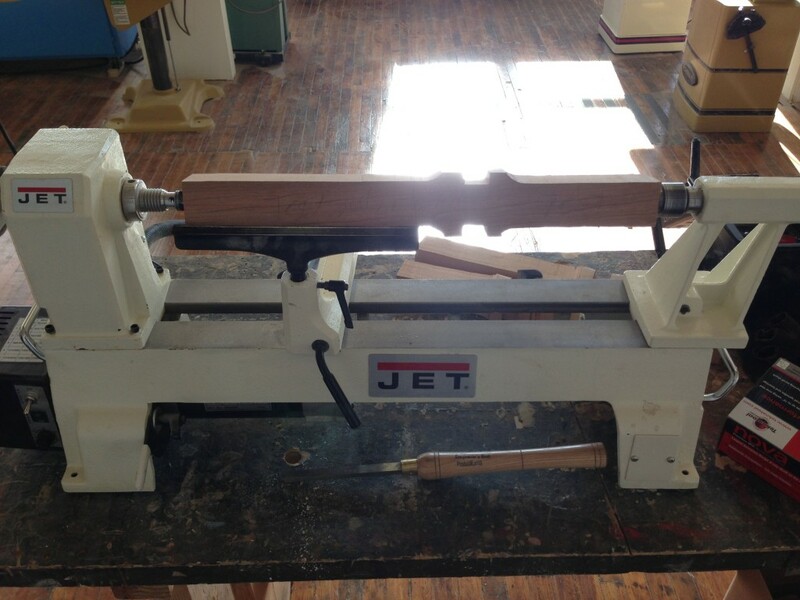 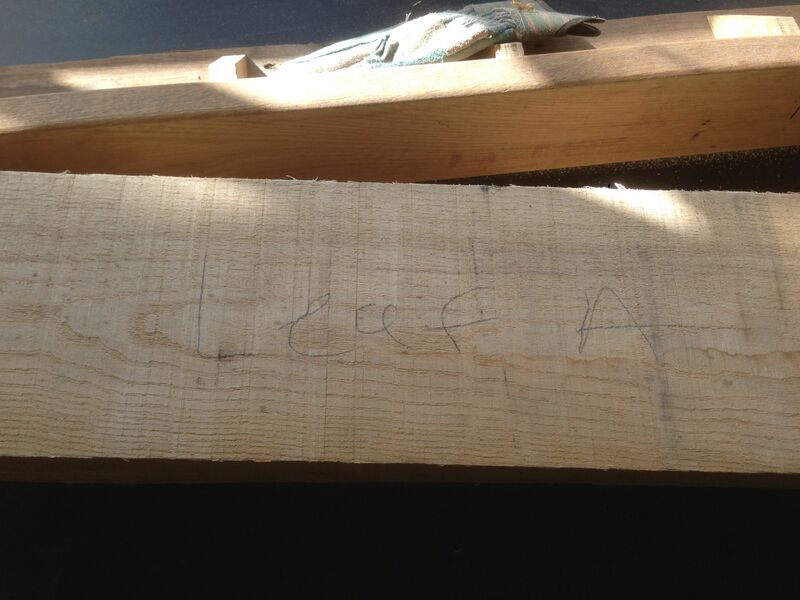 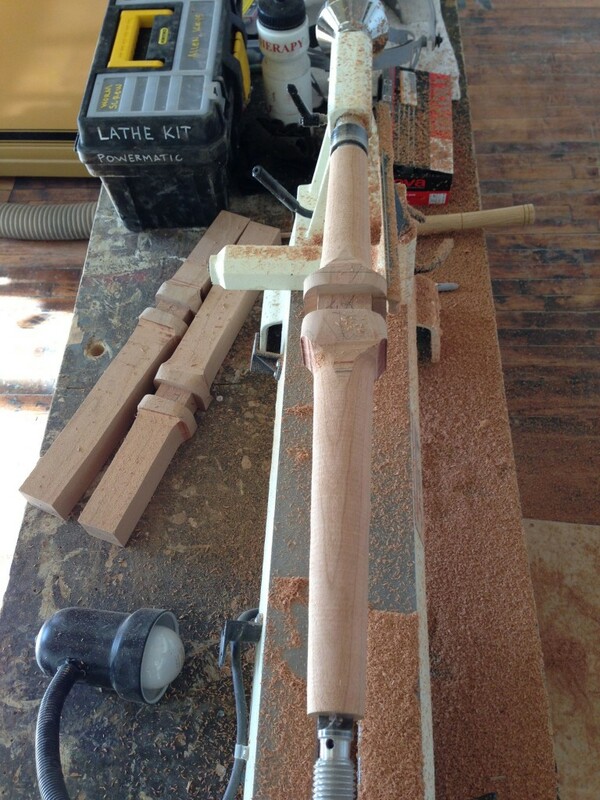 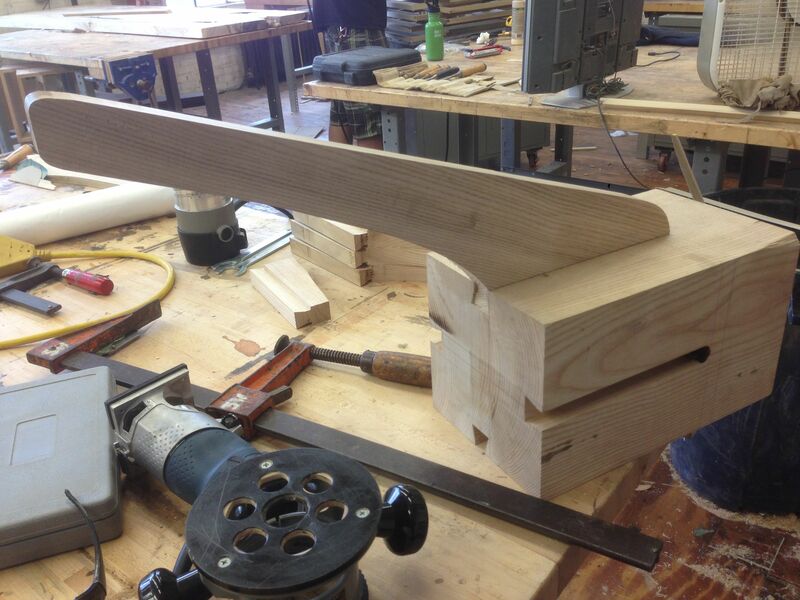 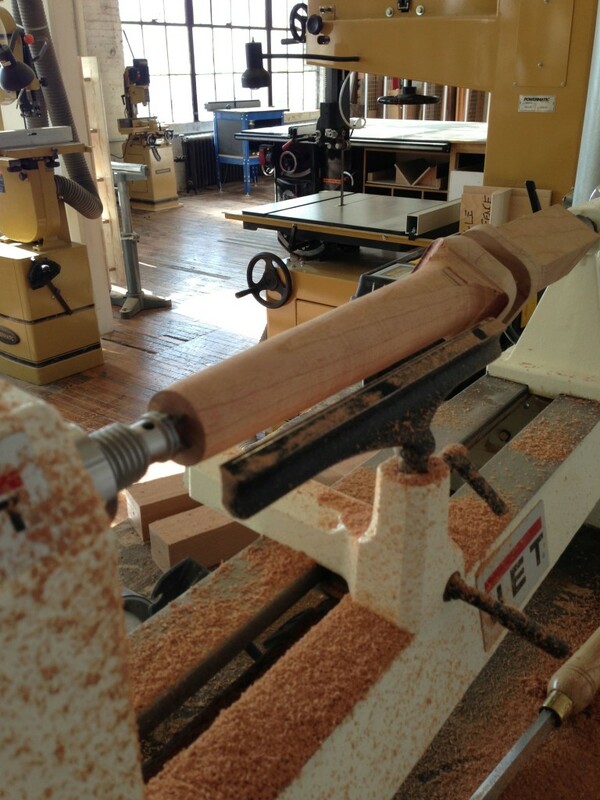 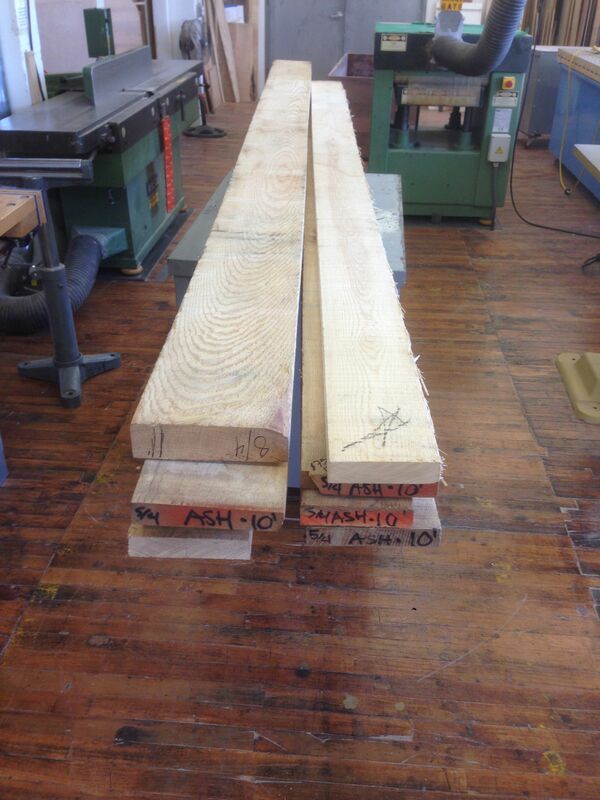 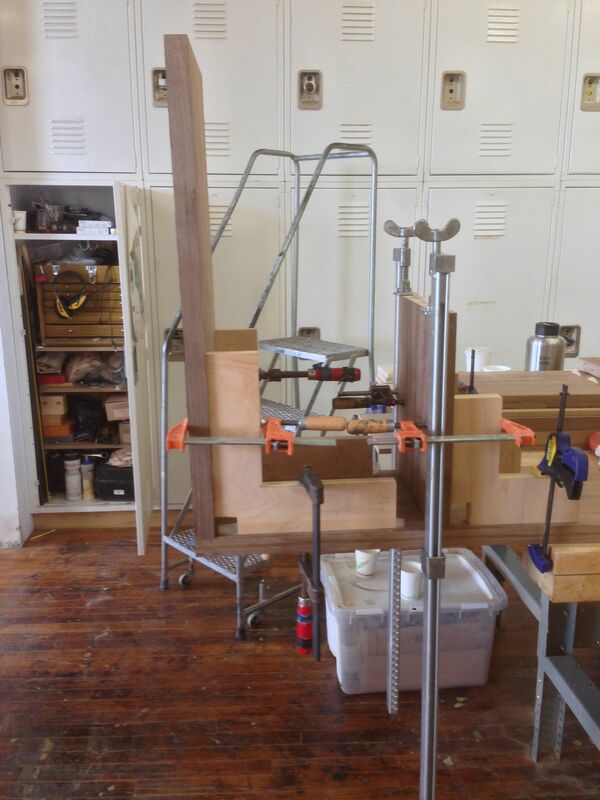 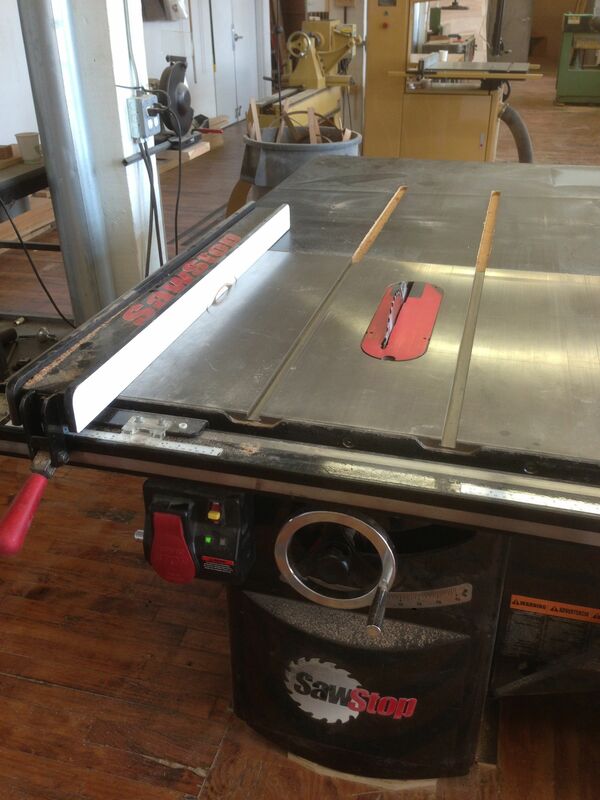 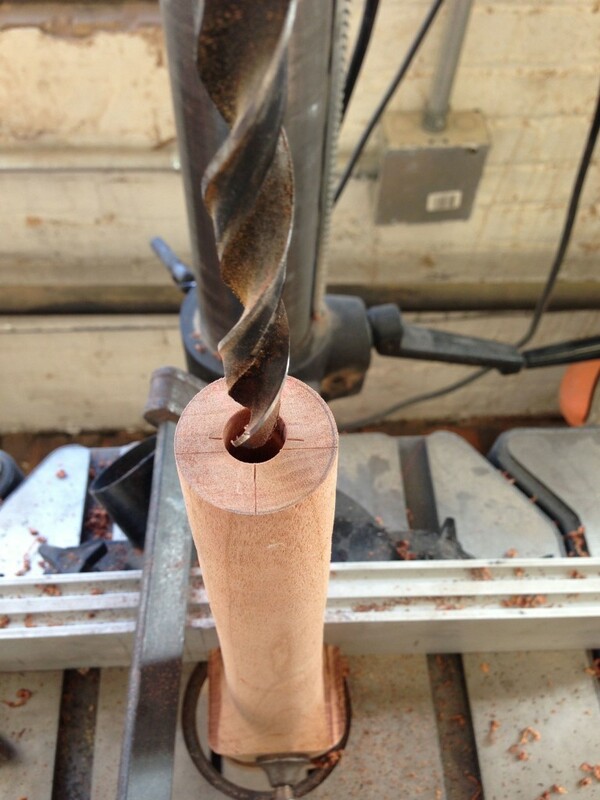 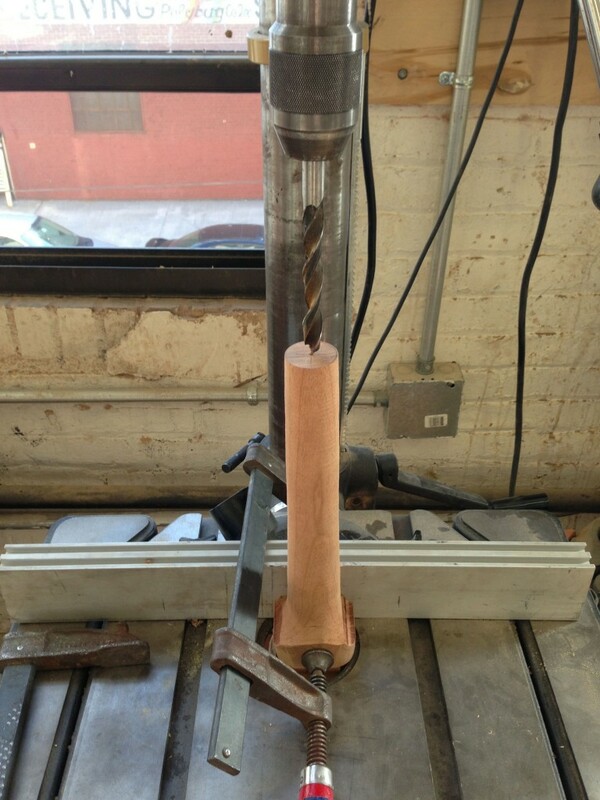 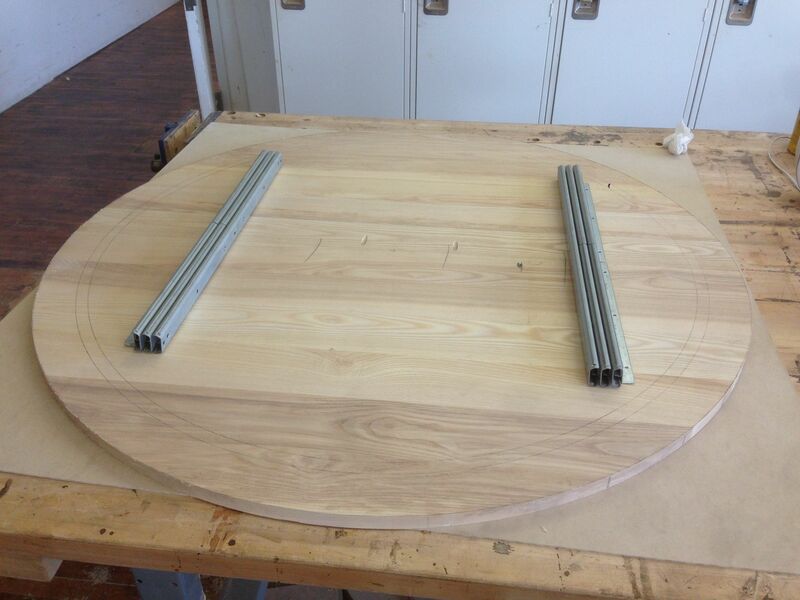 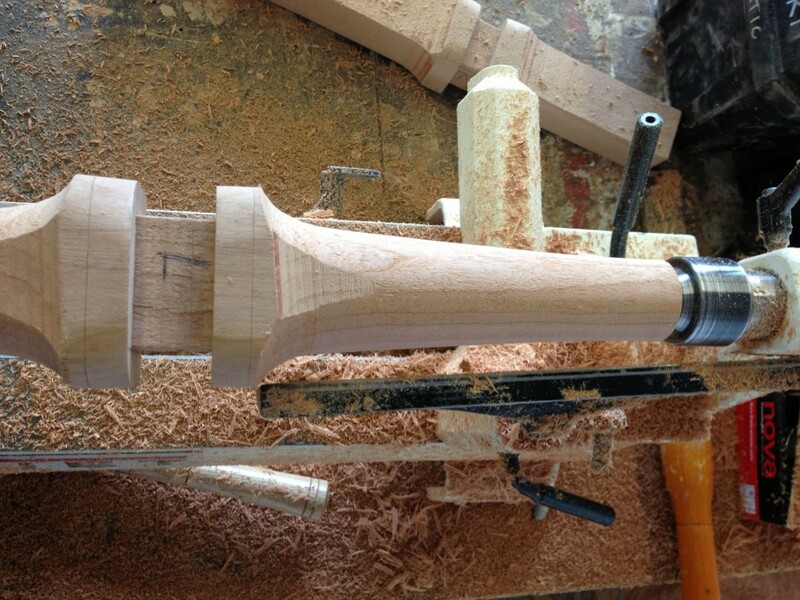 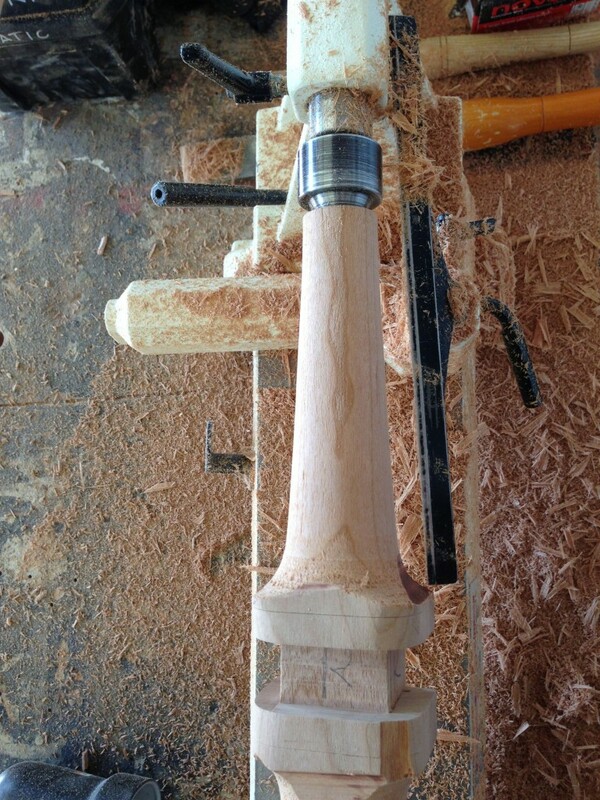 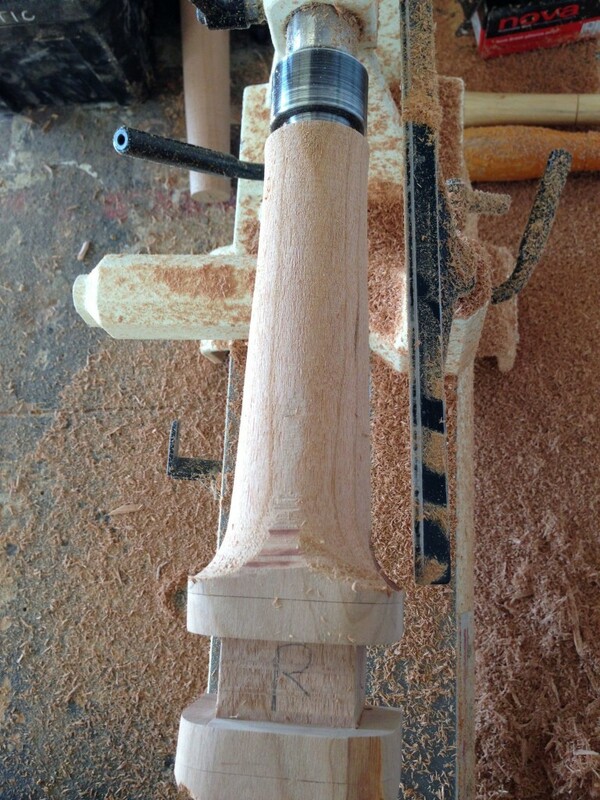 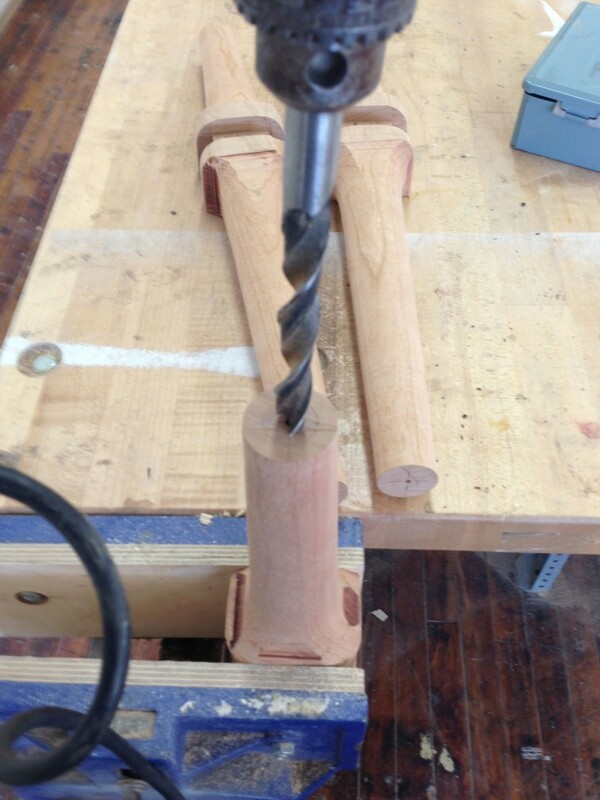 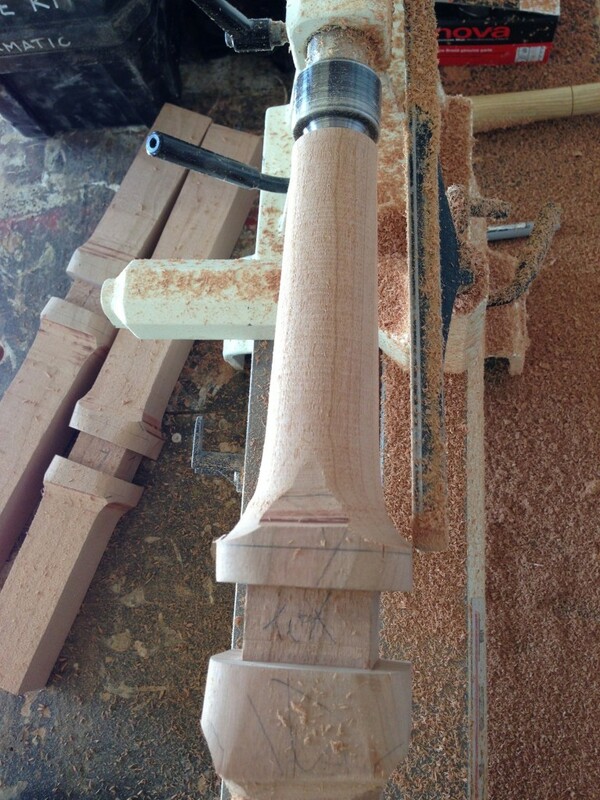 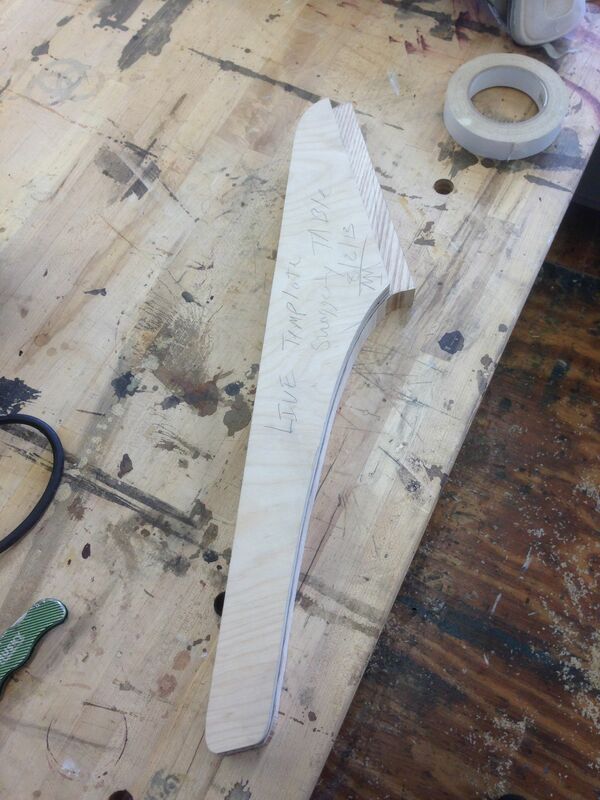 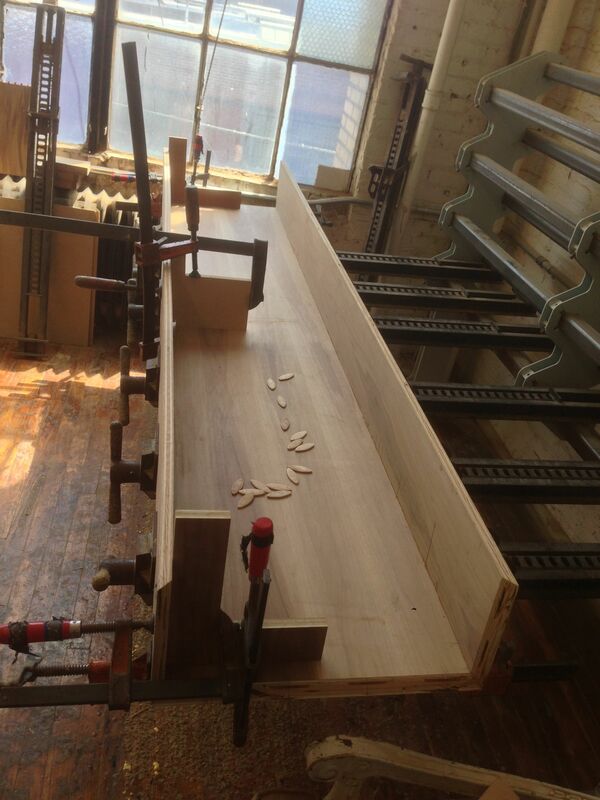 This rocker gallery update follows the process of putting the legs on the lathe to turn them. 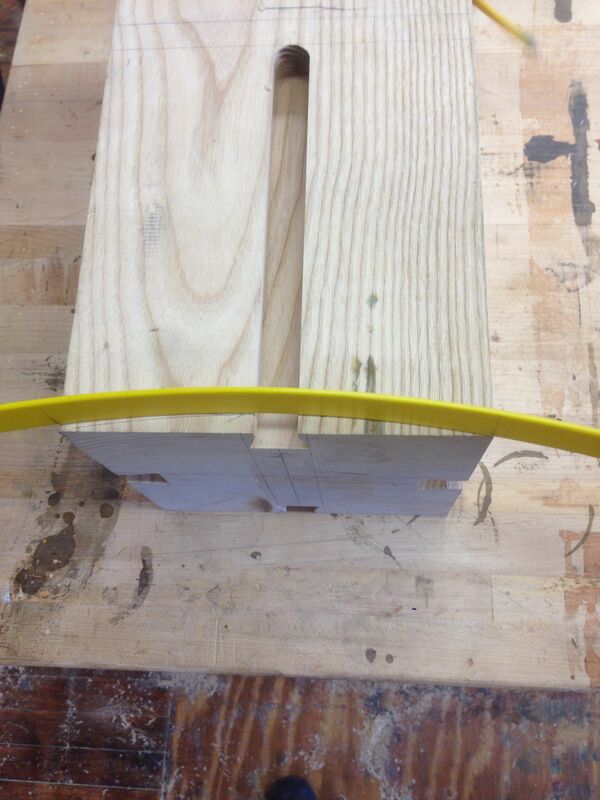 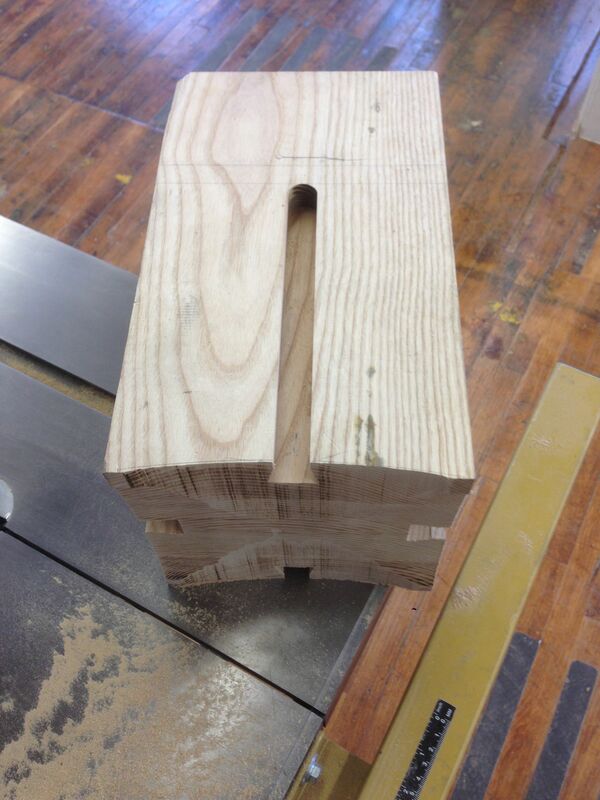 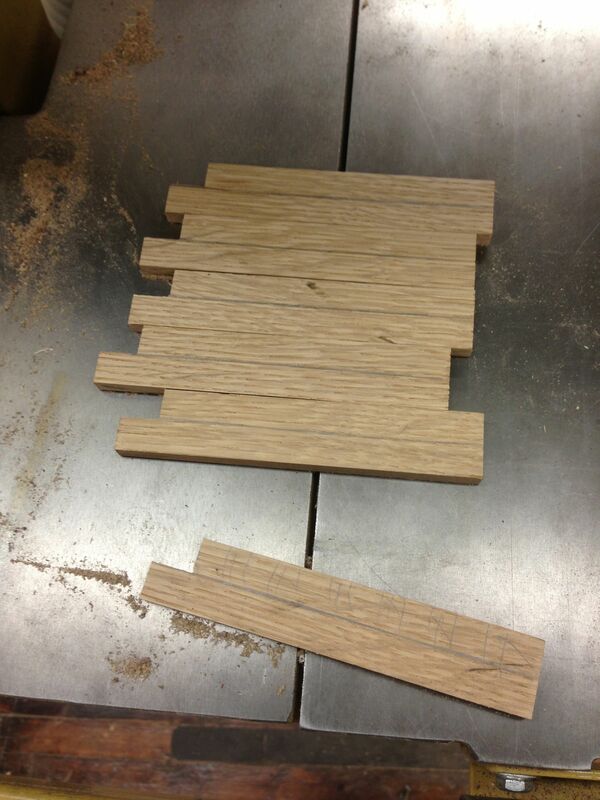 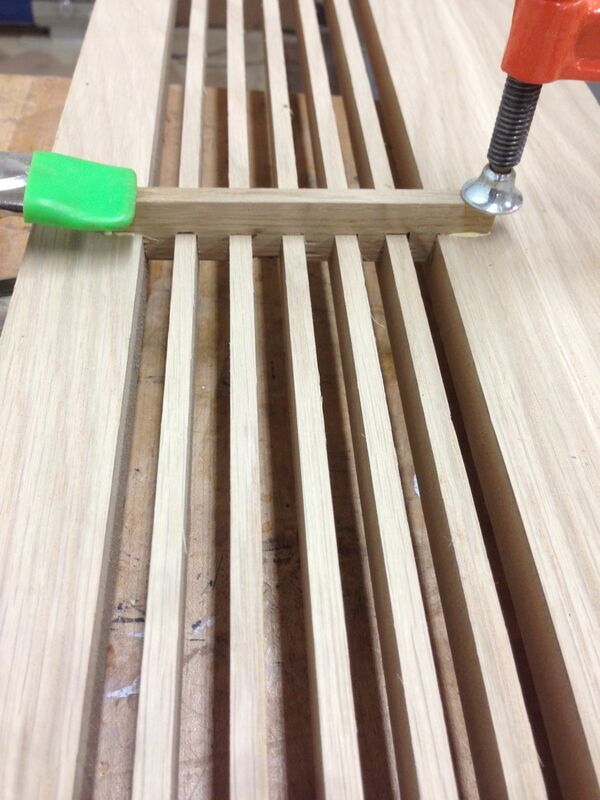 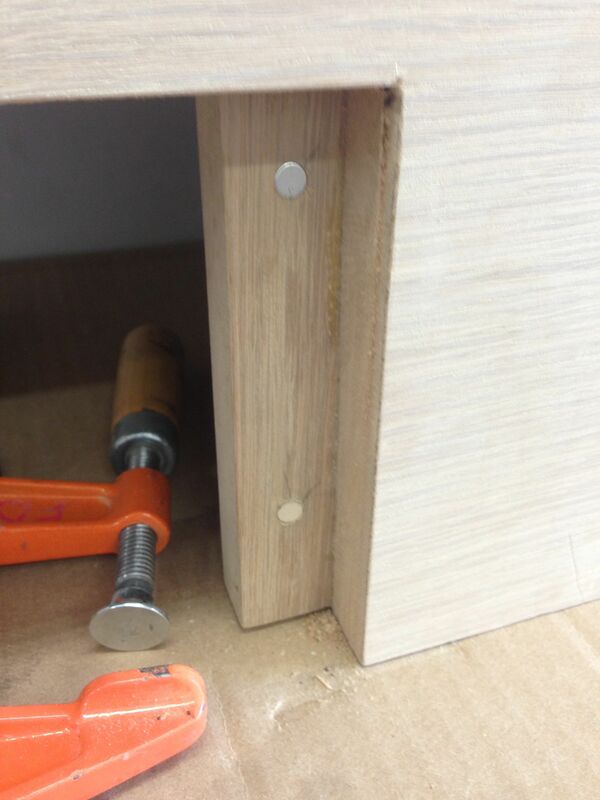 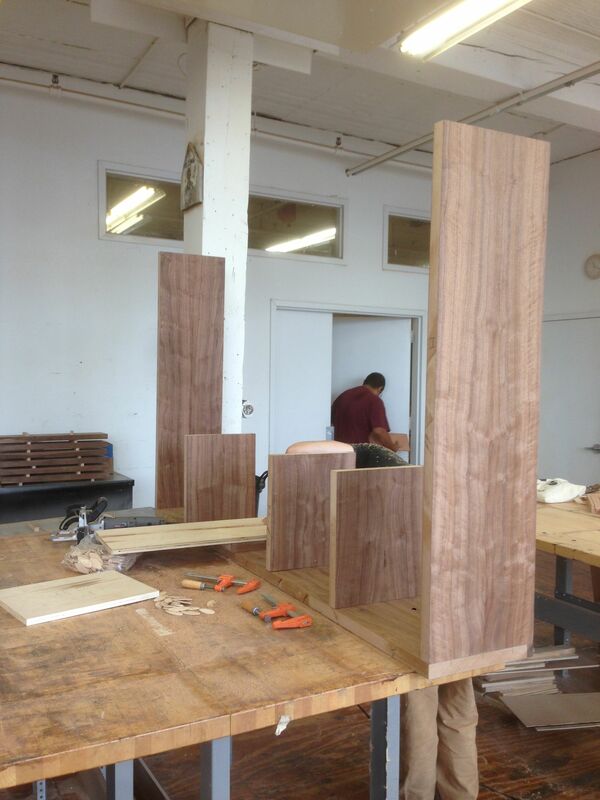 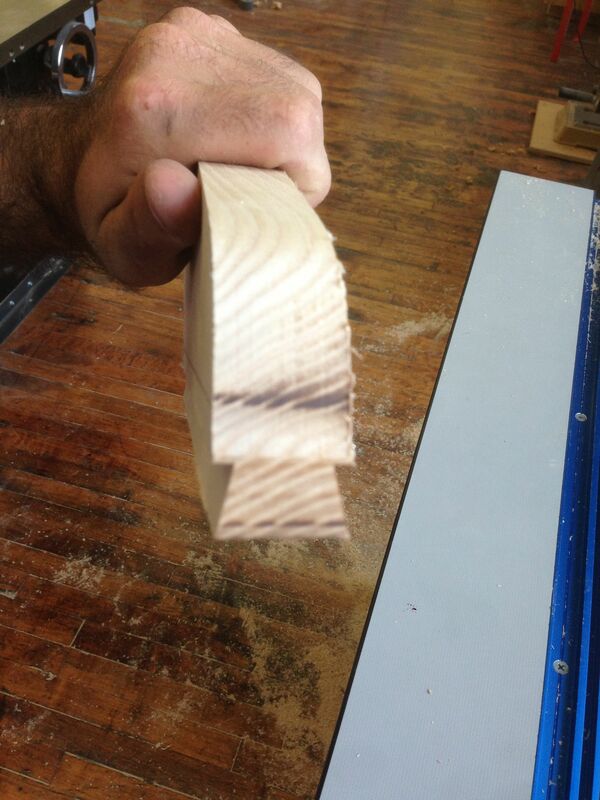 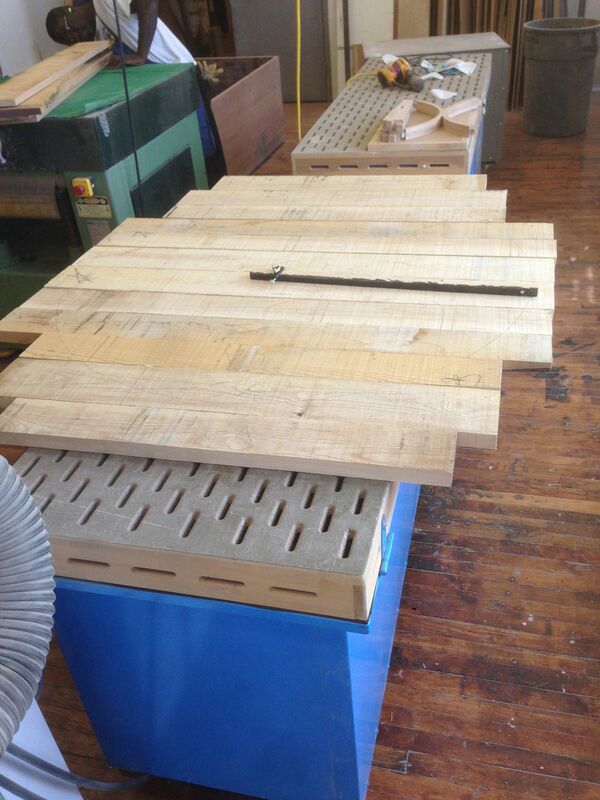 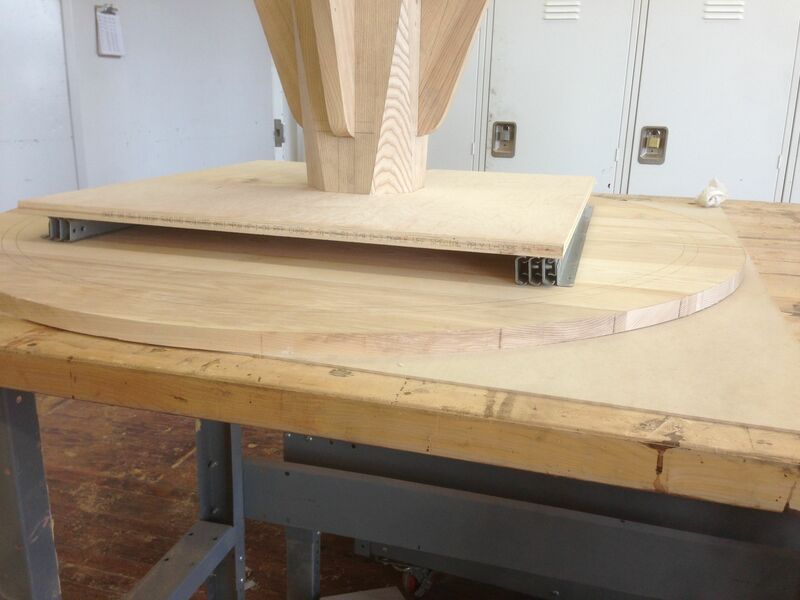 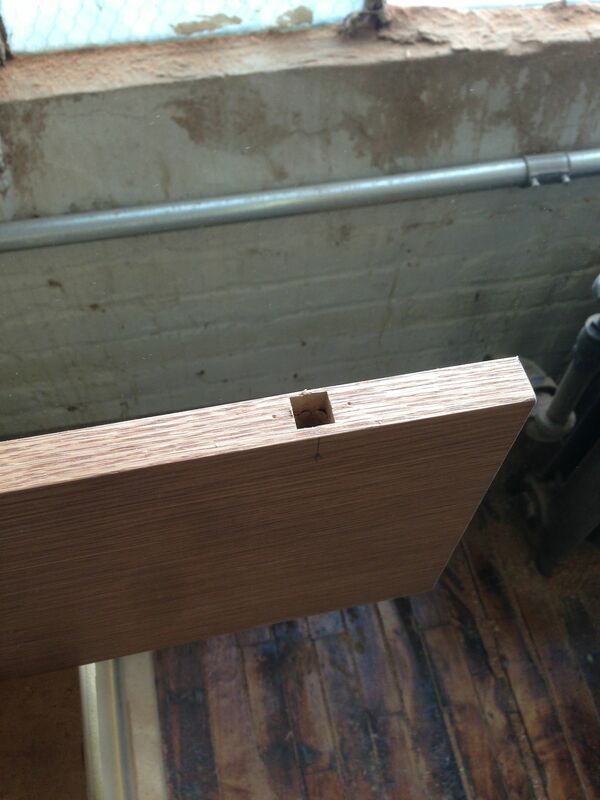 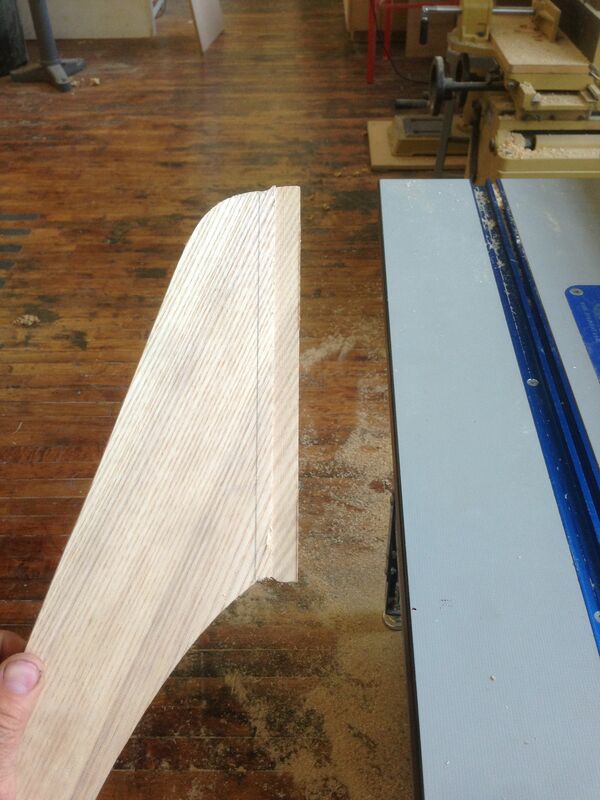 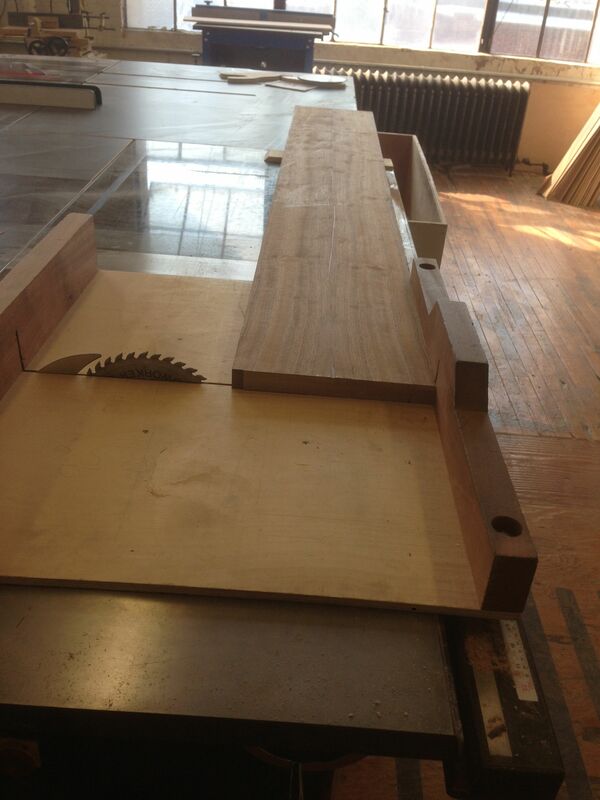 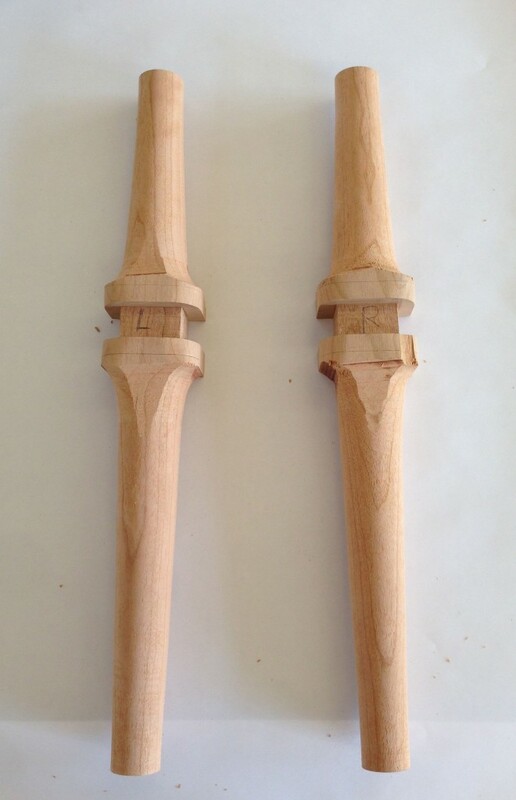 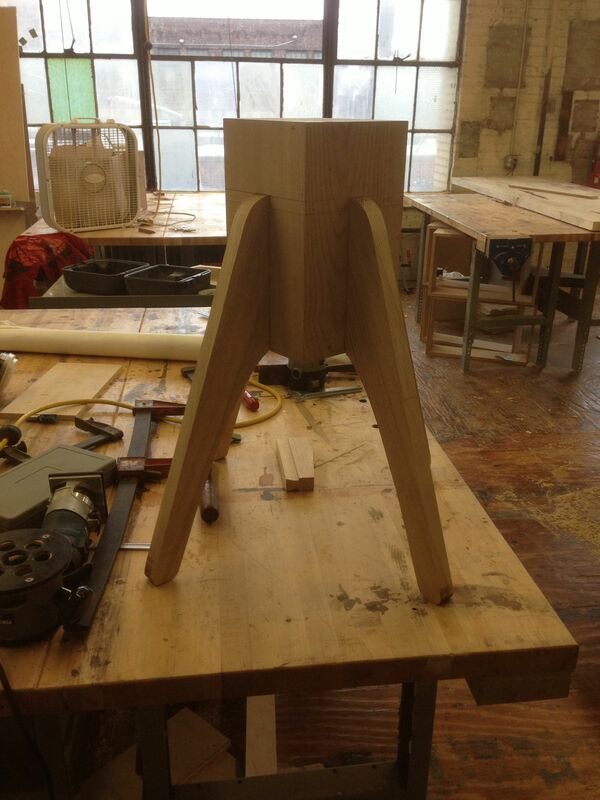 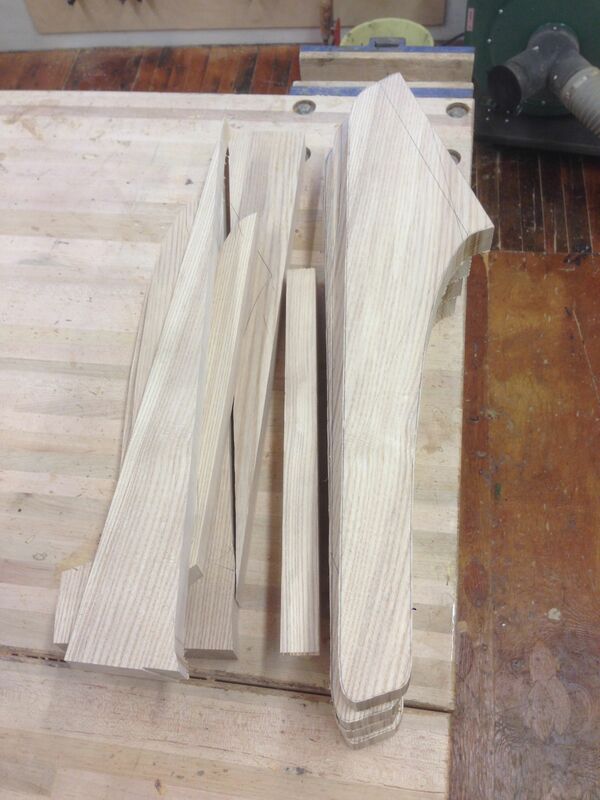 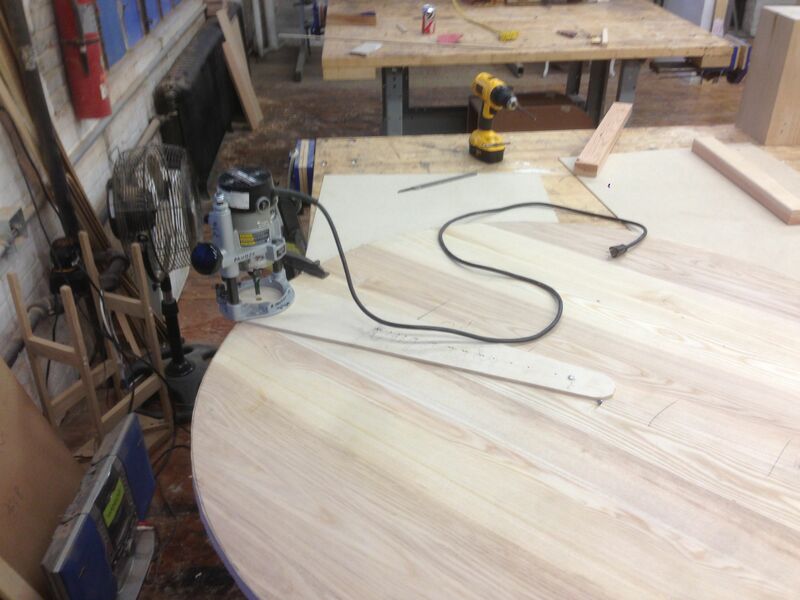 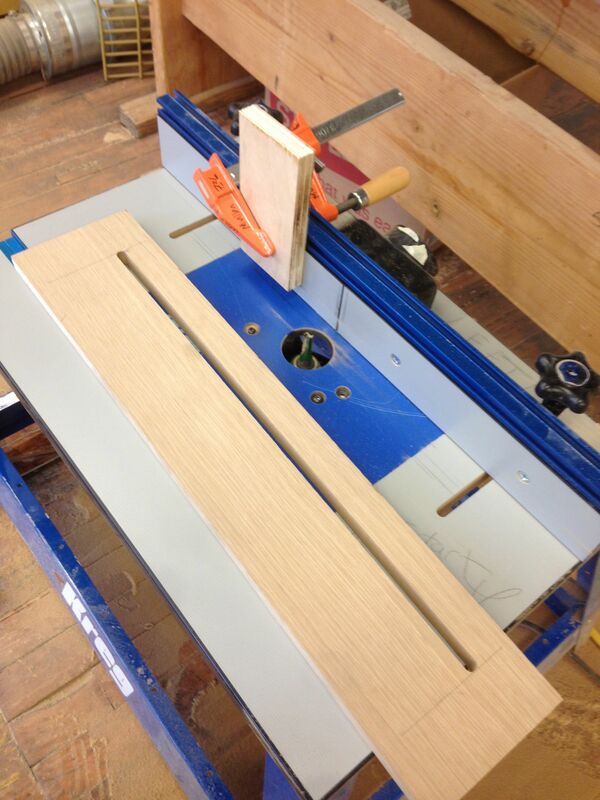 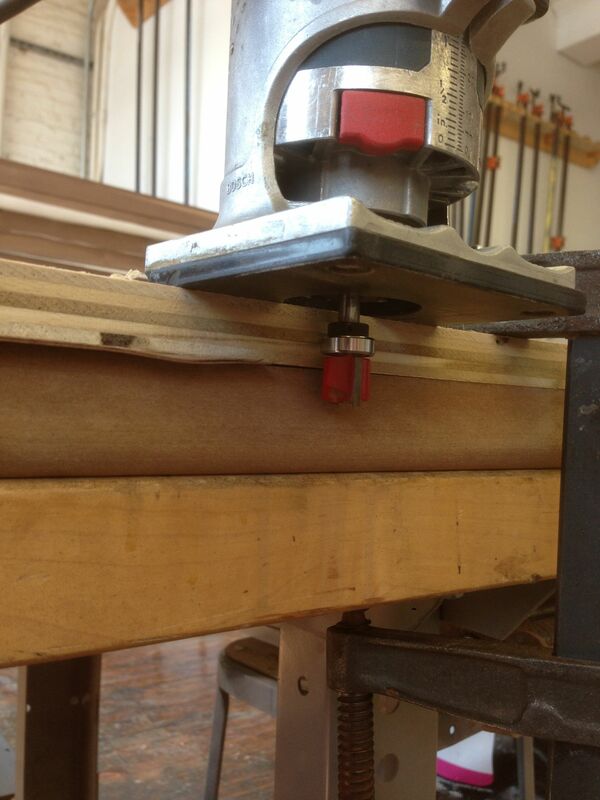 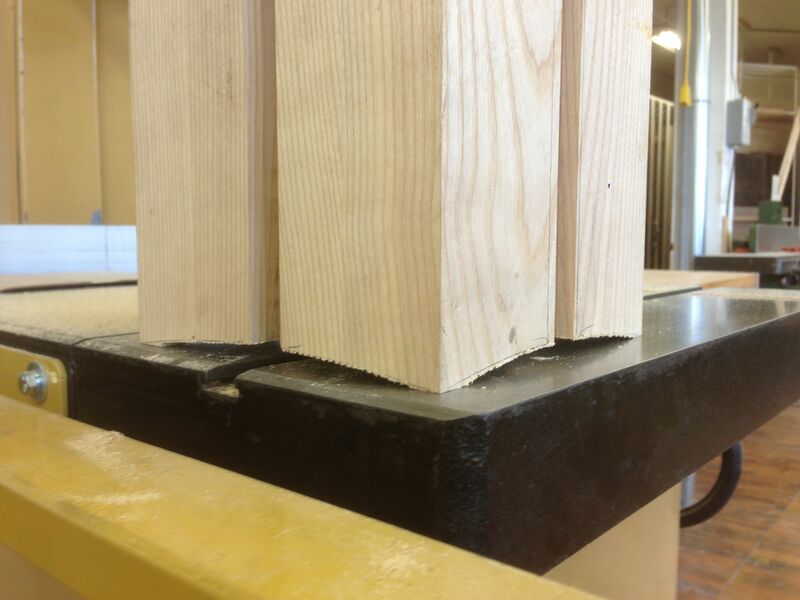 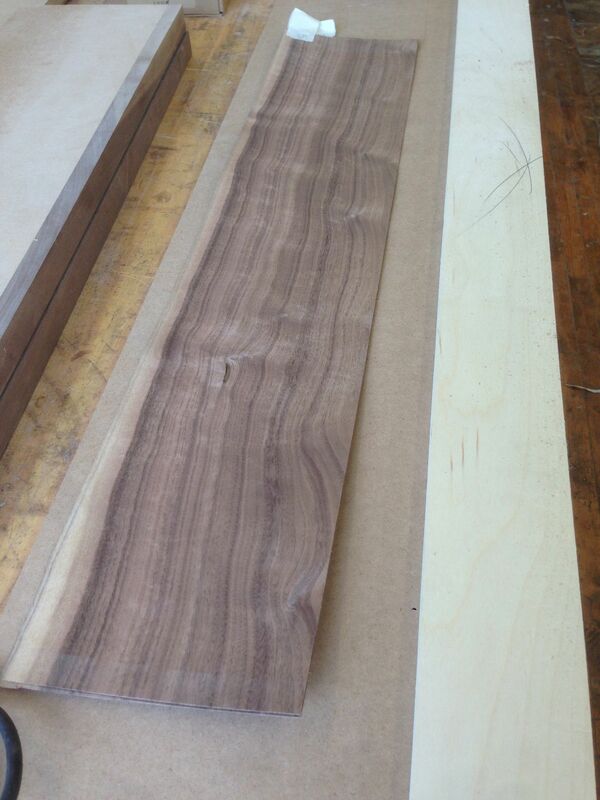 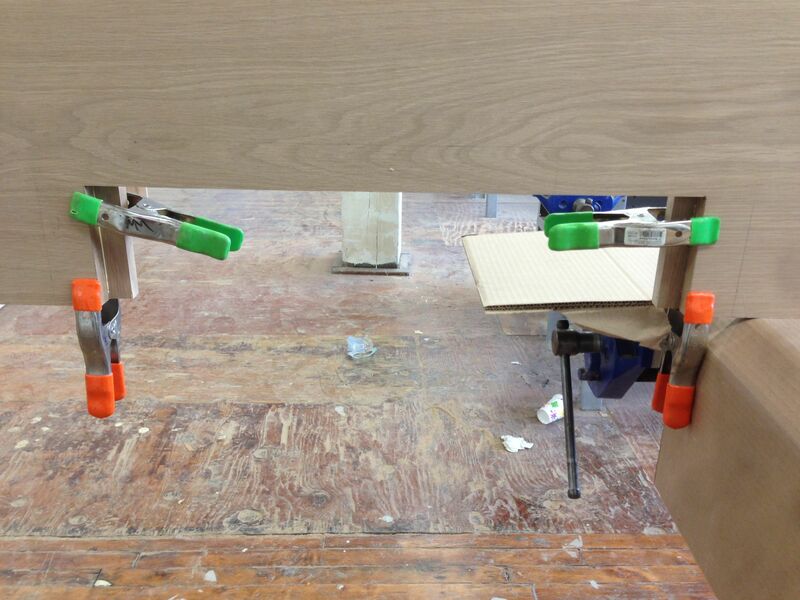 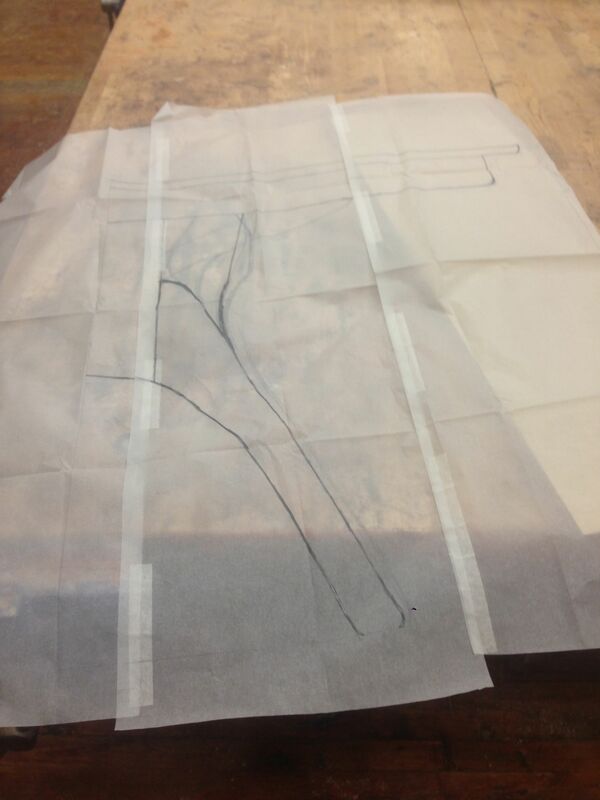 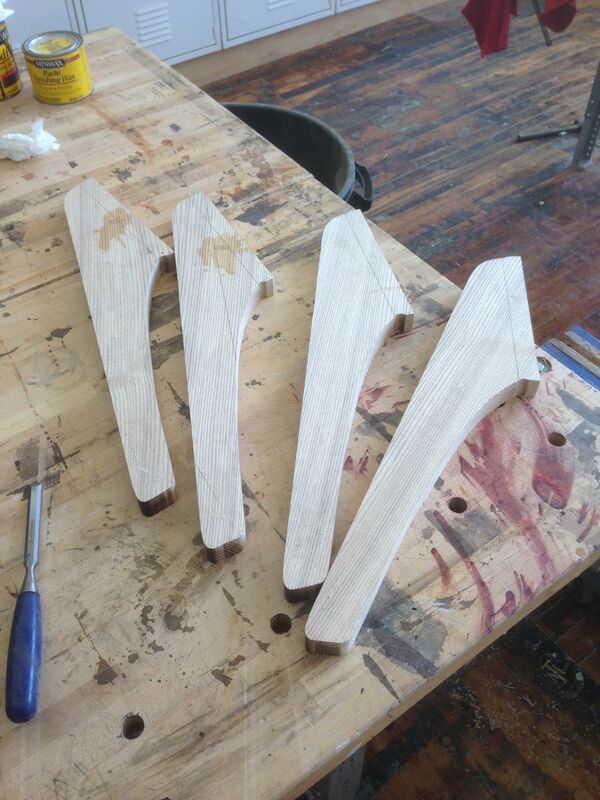 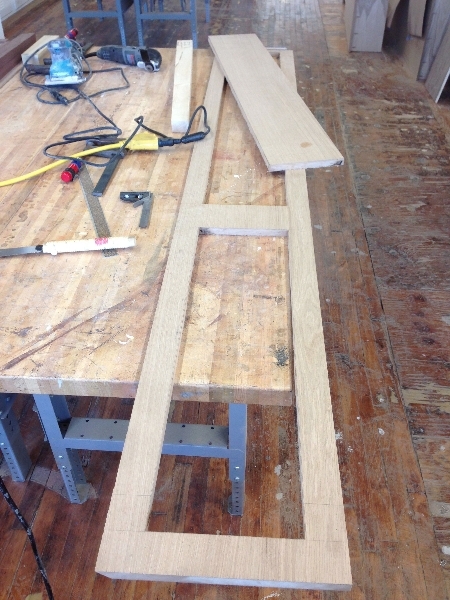 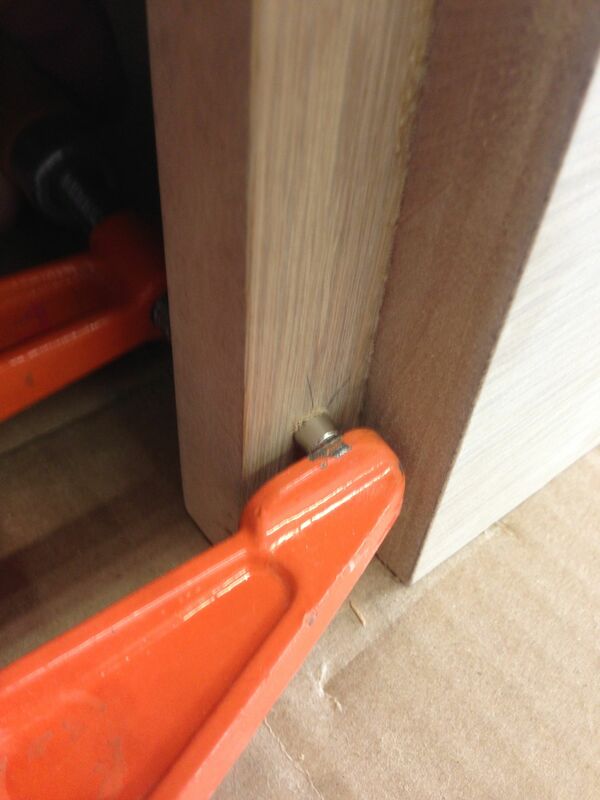 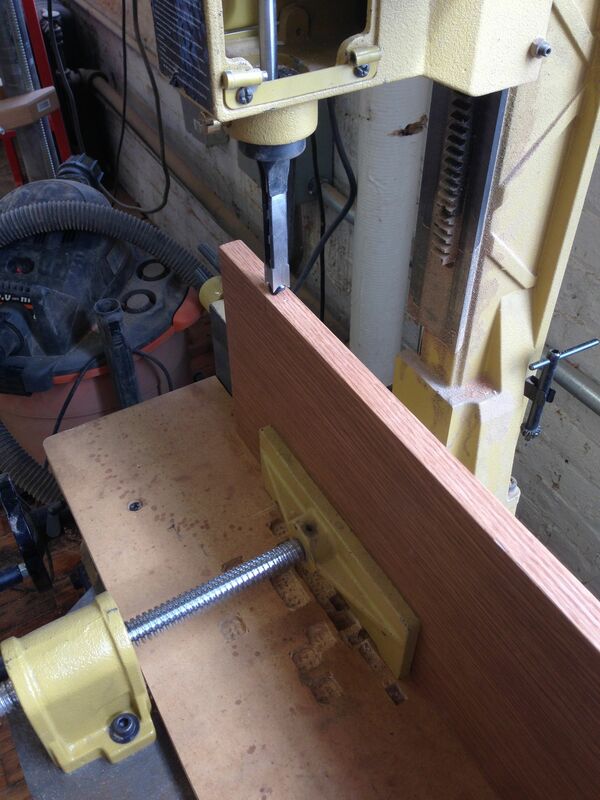 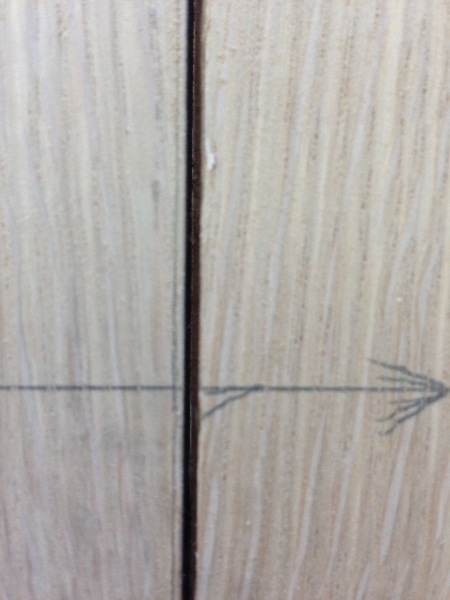 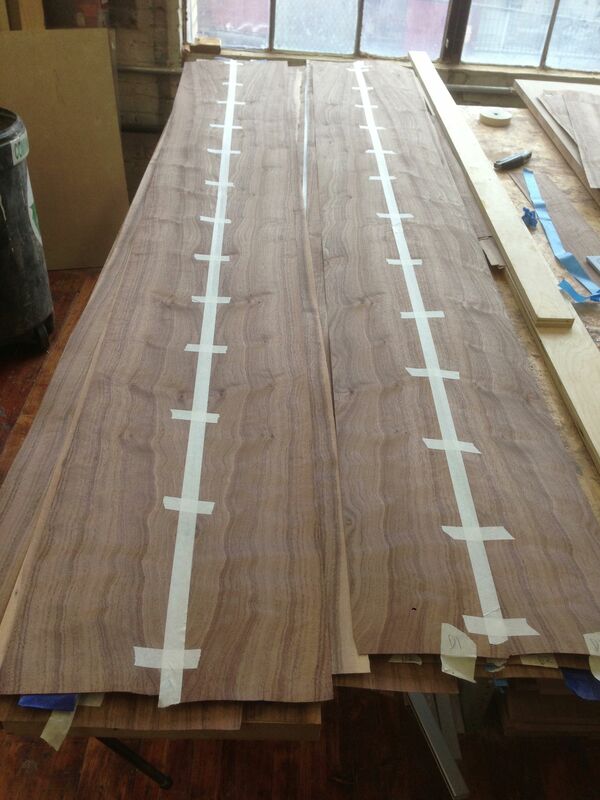 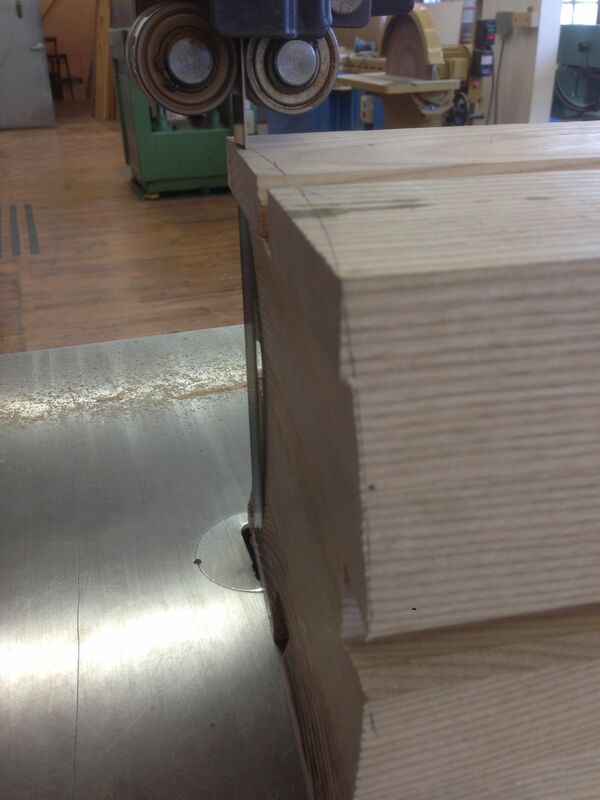 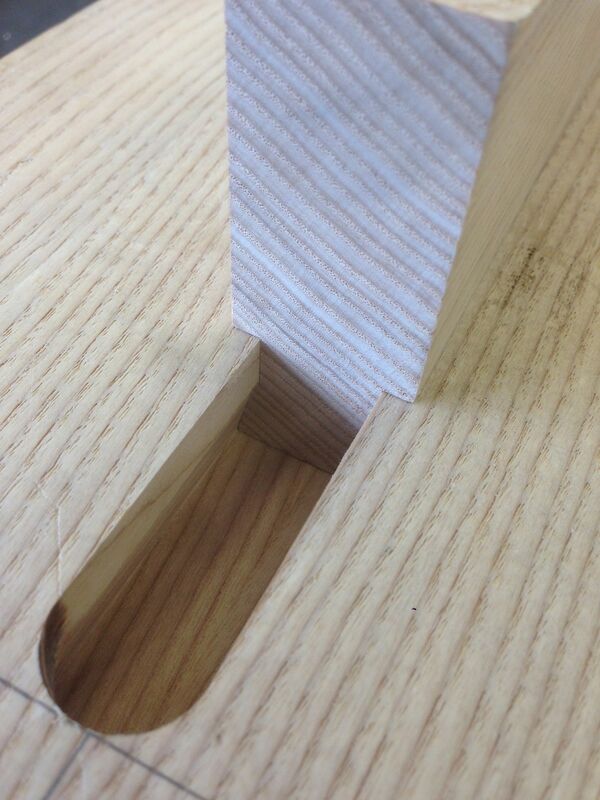 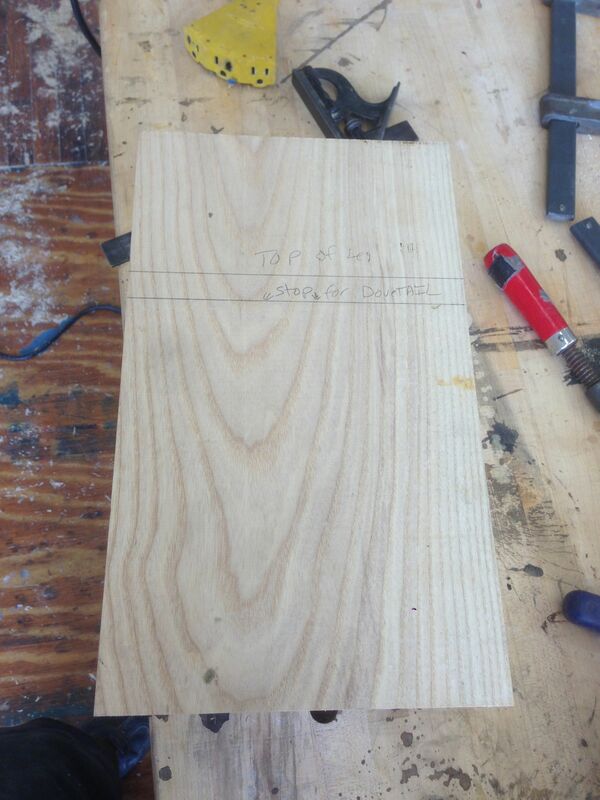 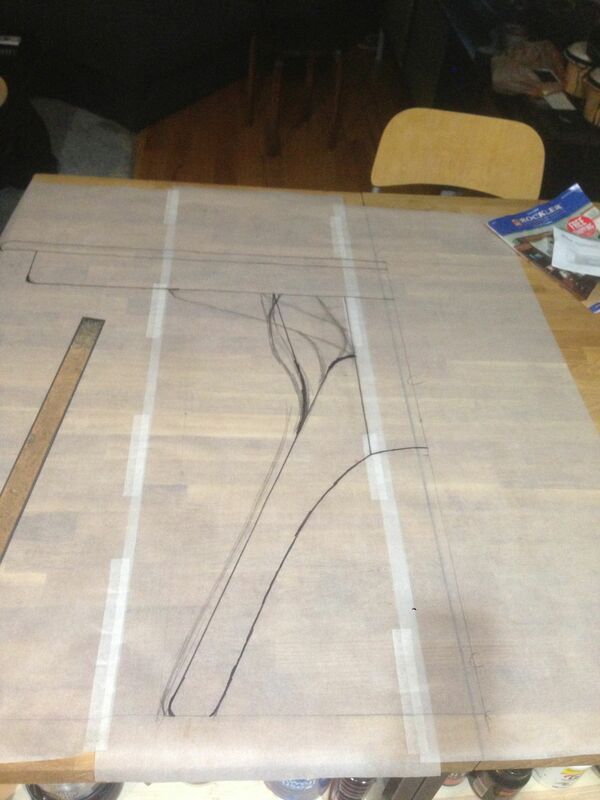 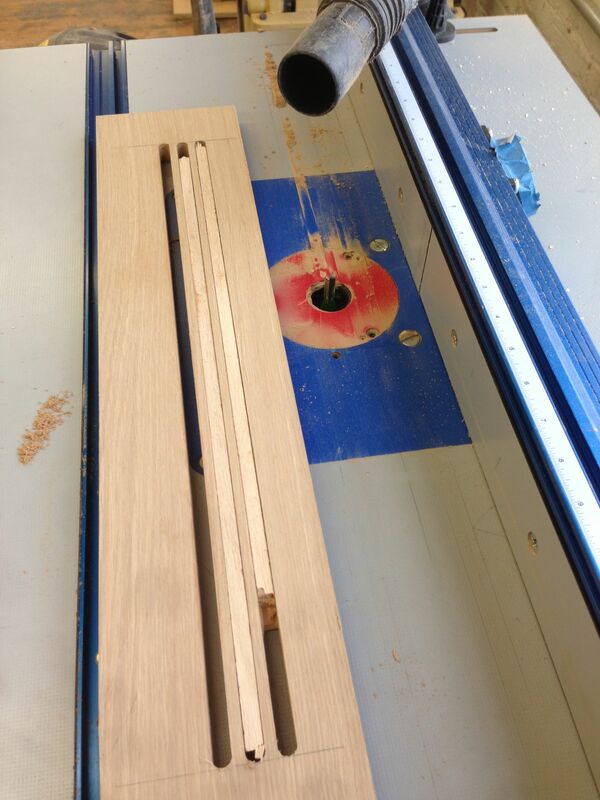 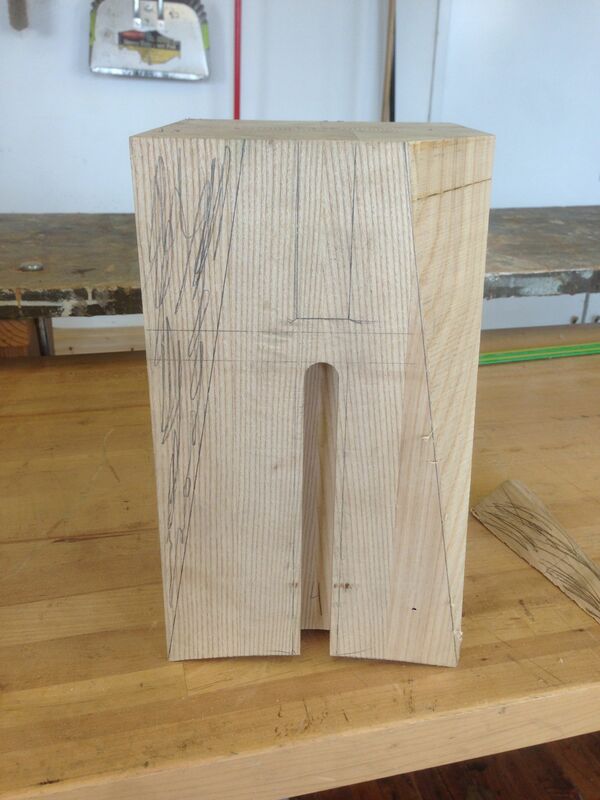 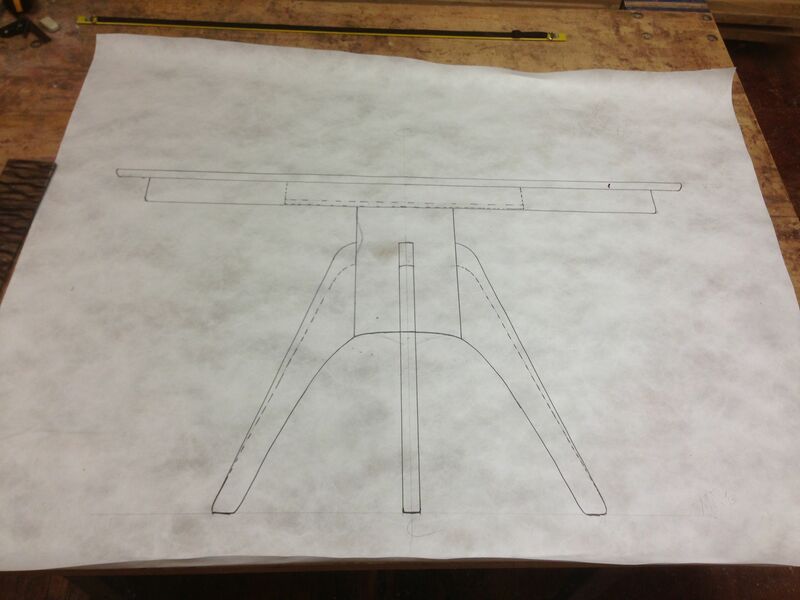 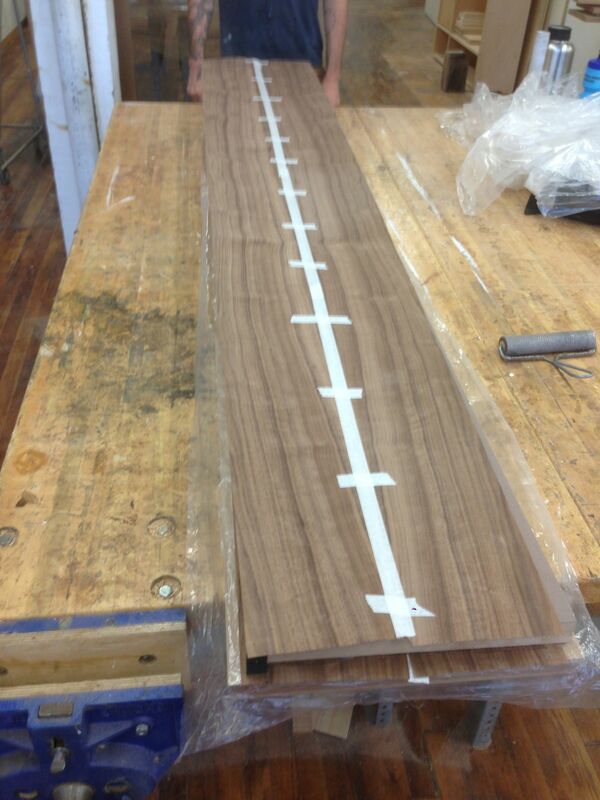 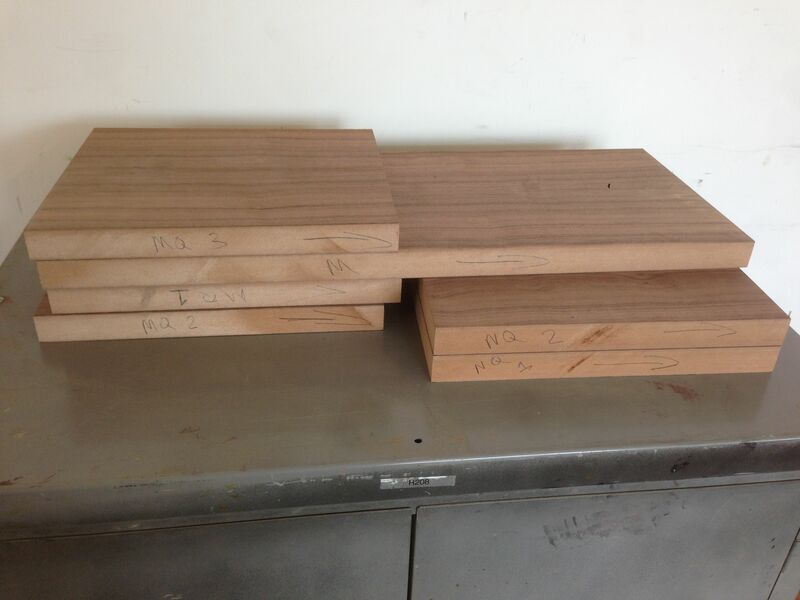 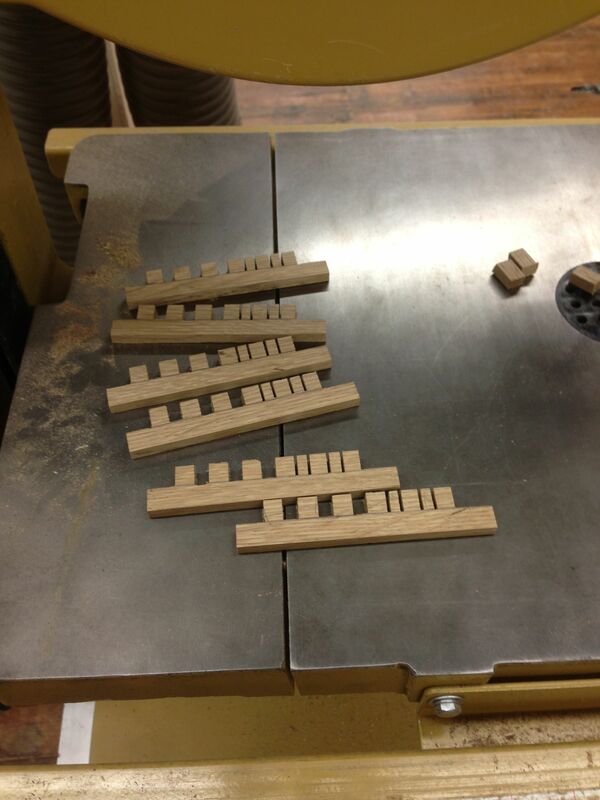 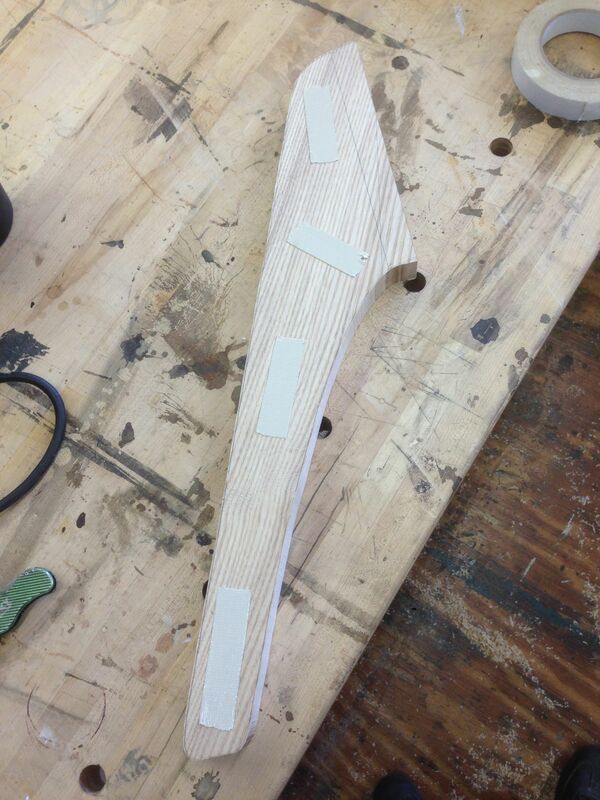 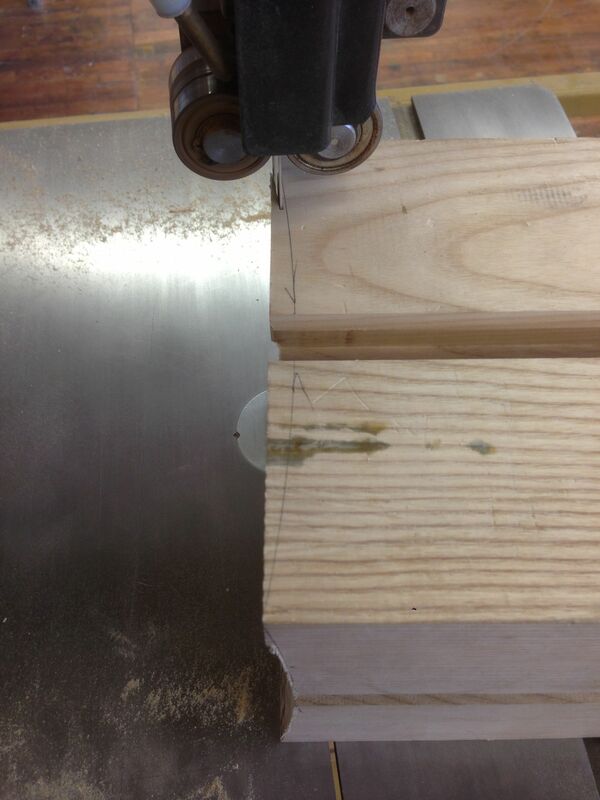 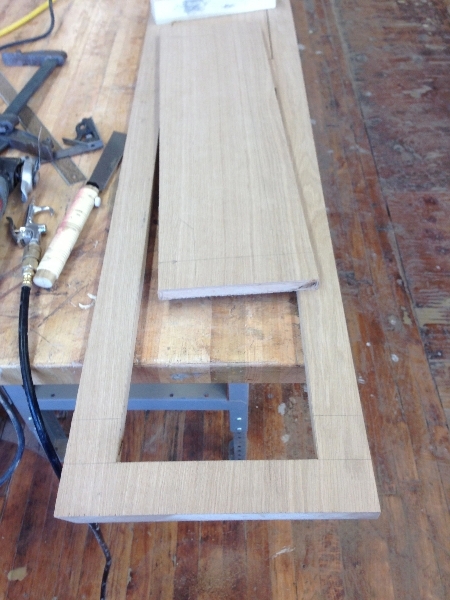 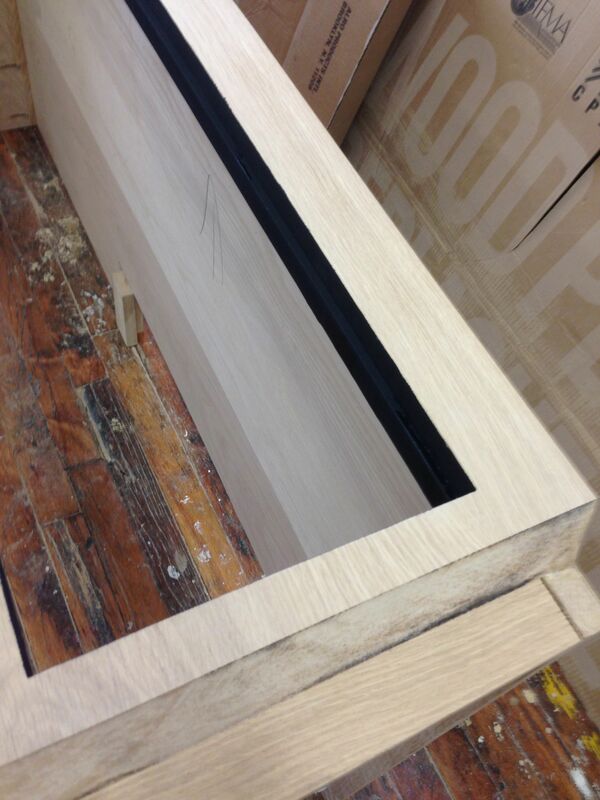 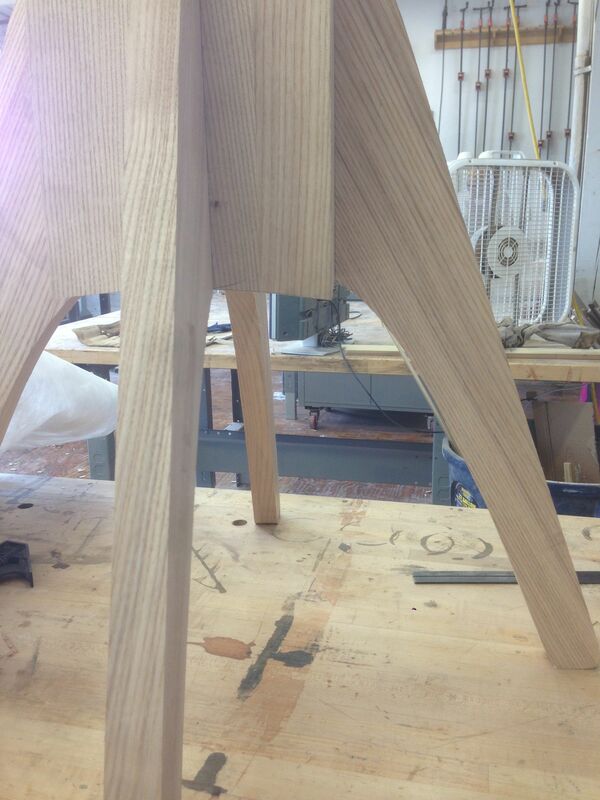 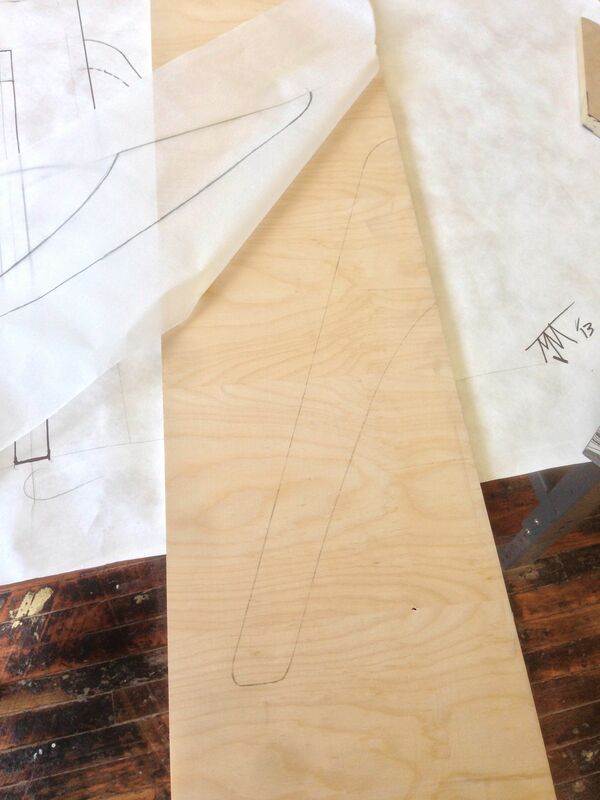 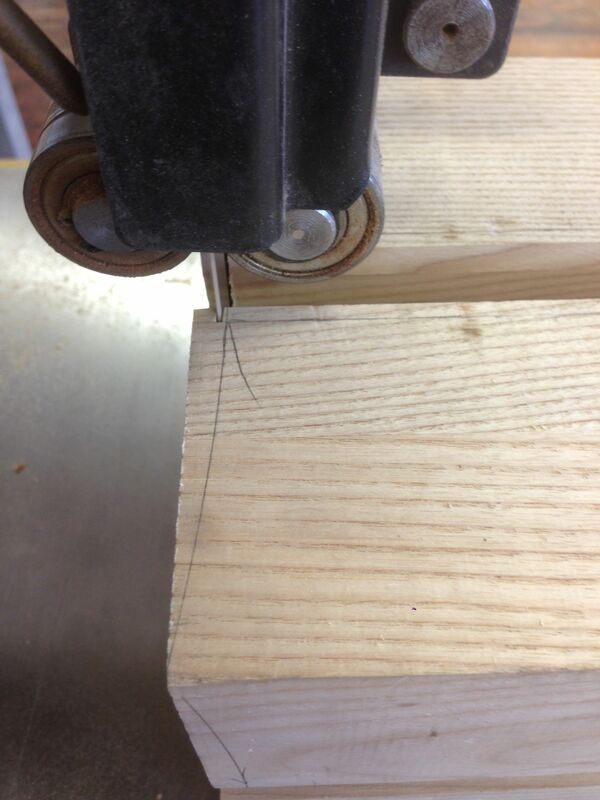 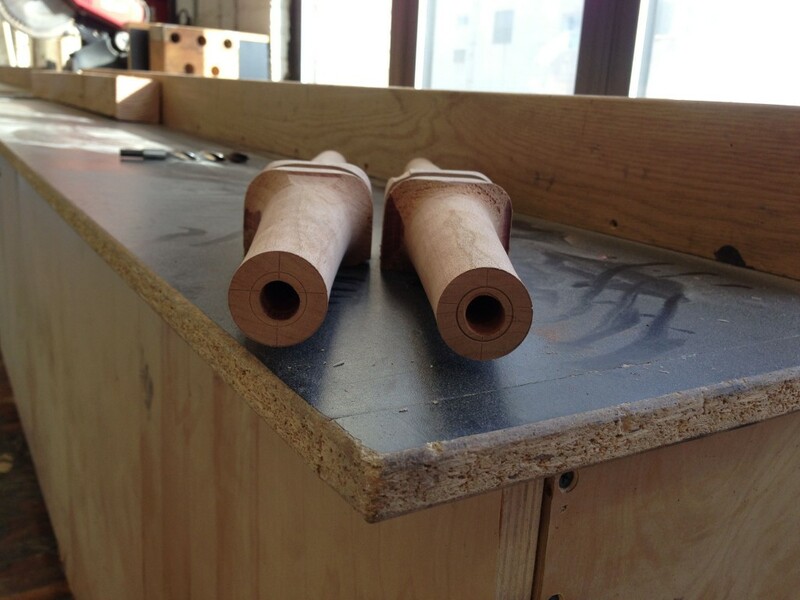 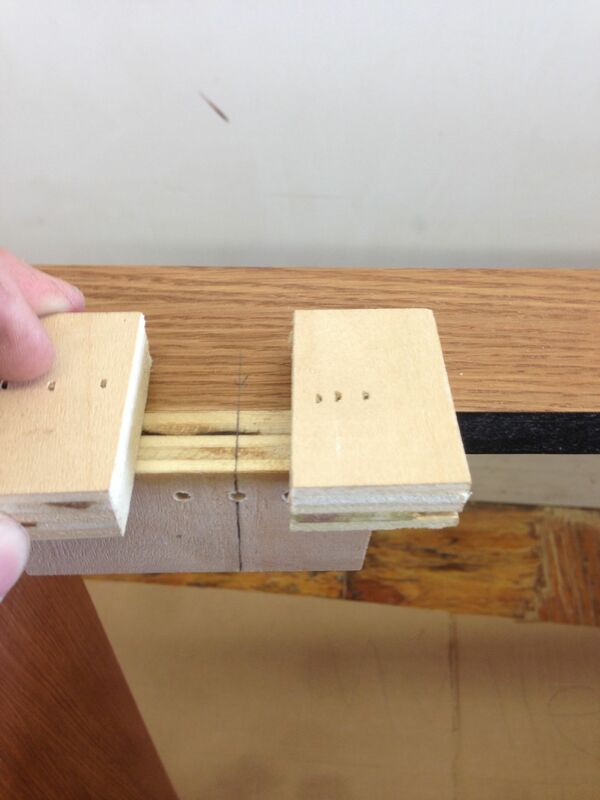 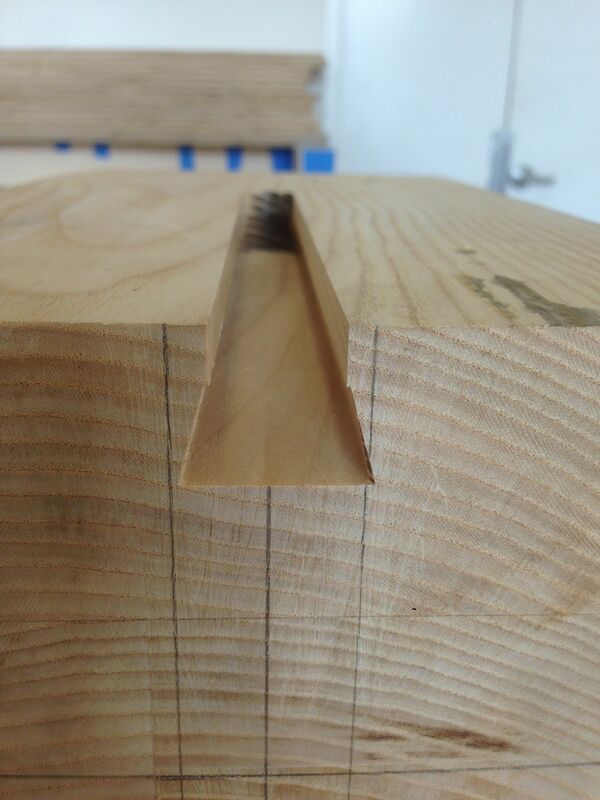 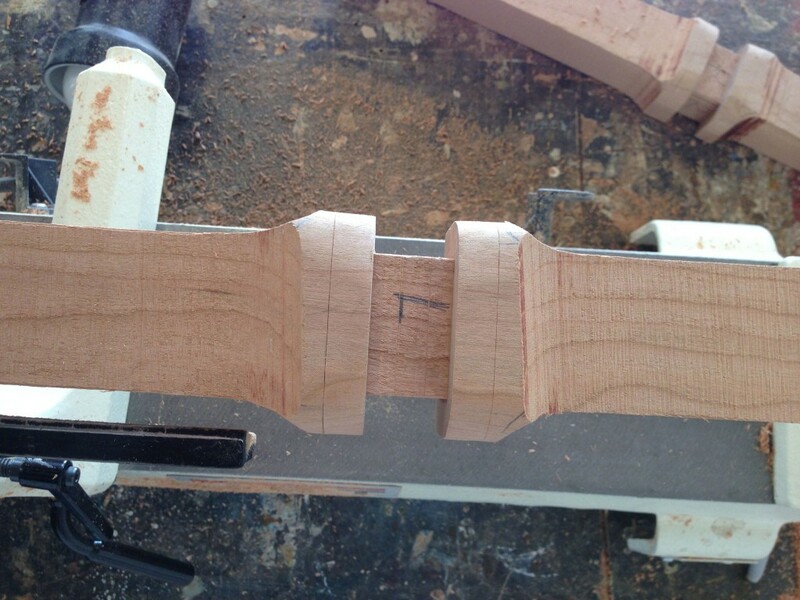 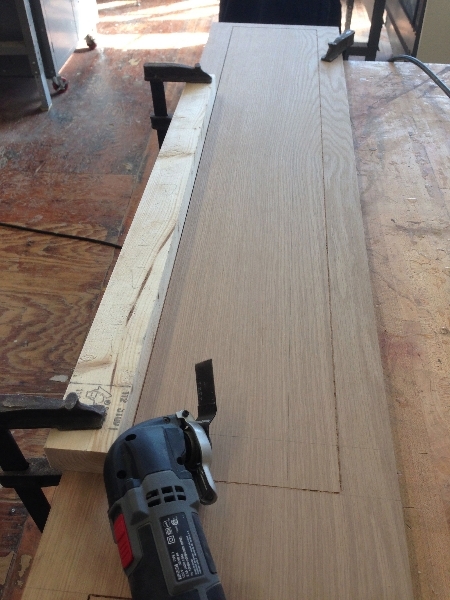 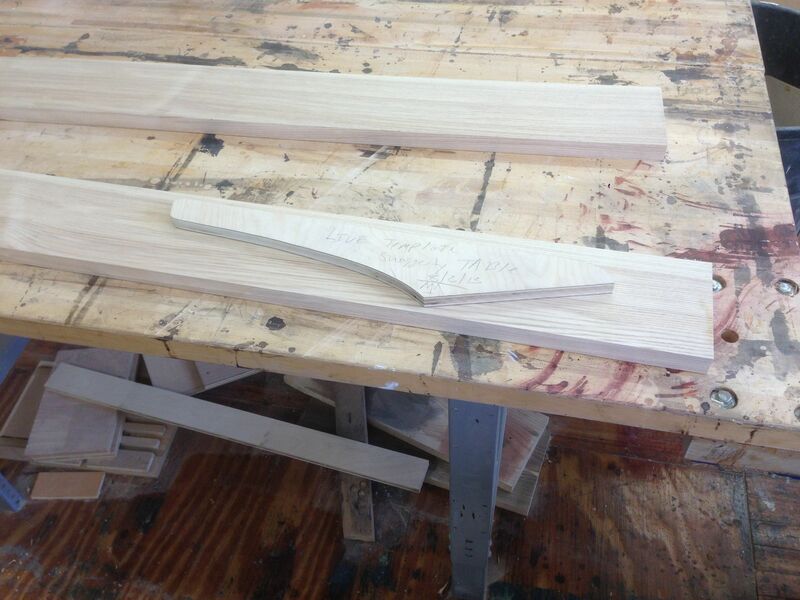 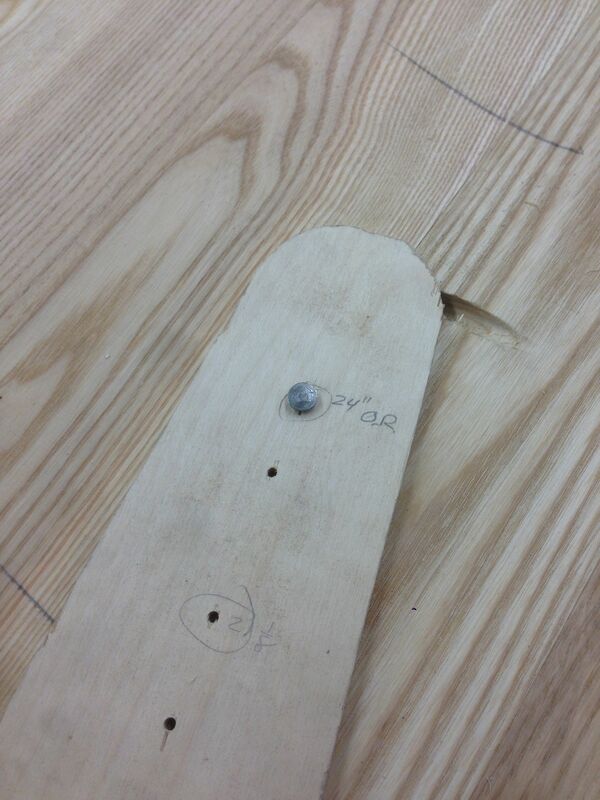 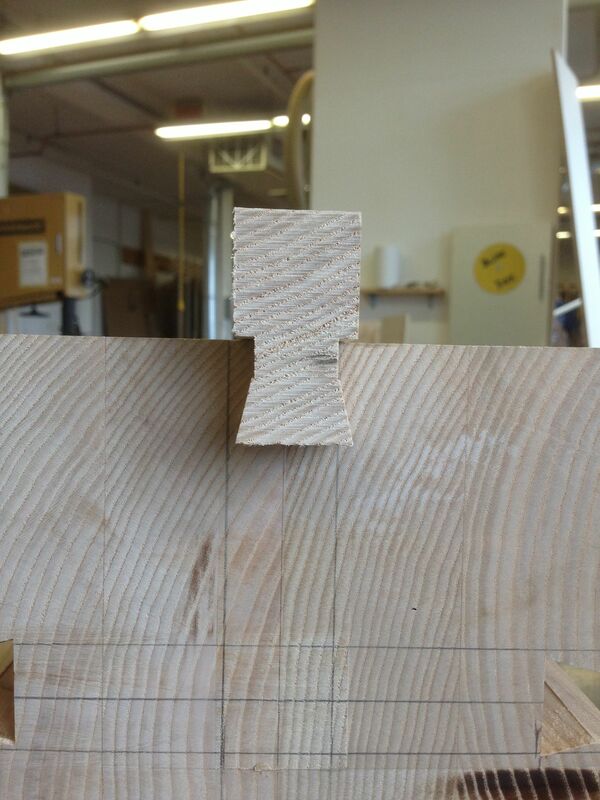 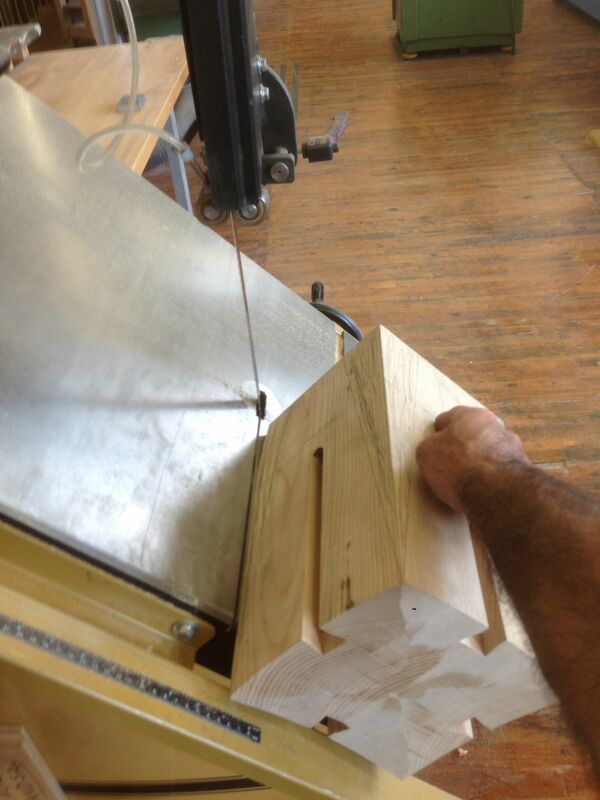 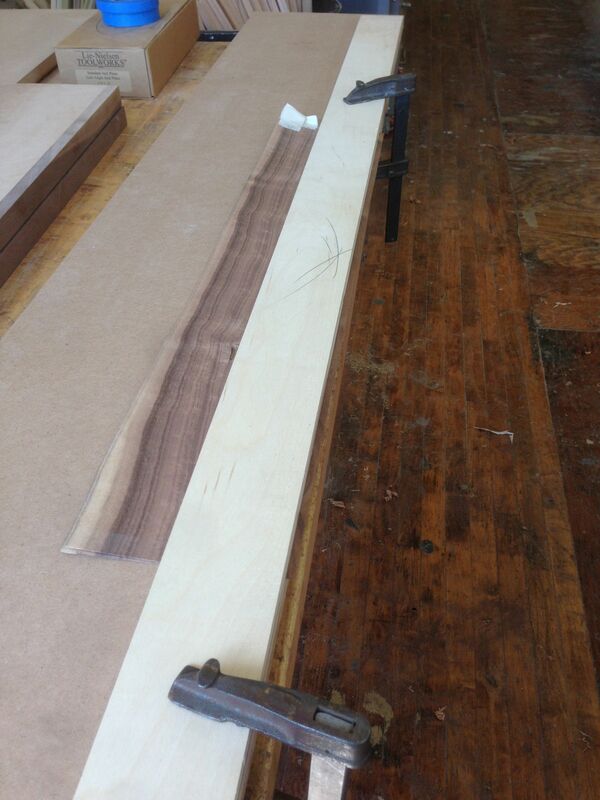 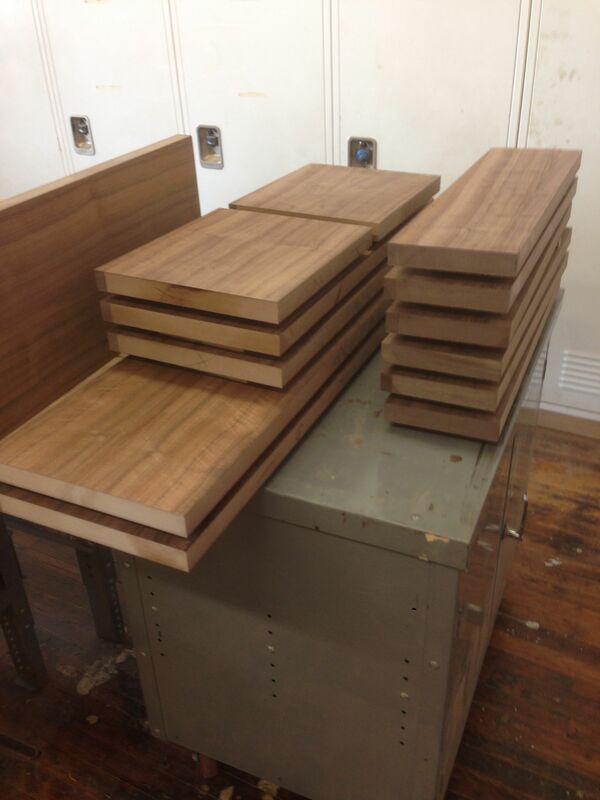 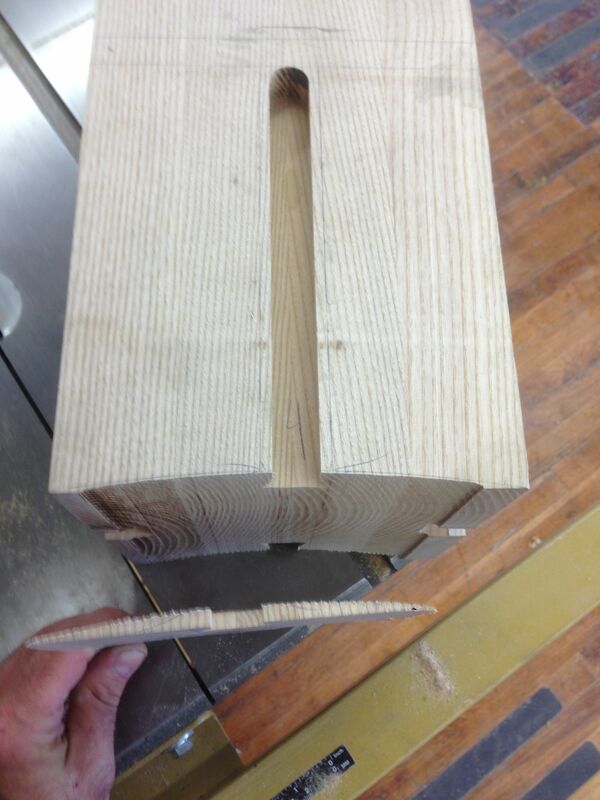 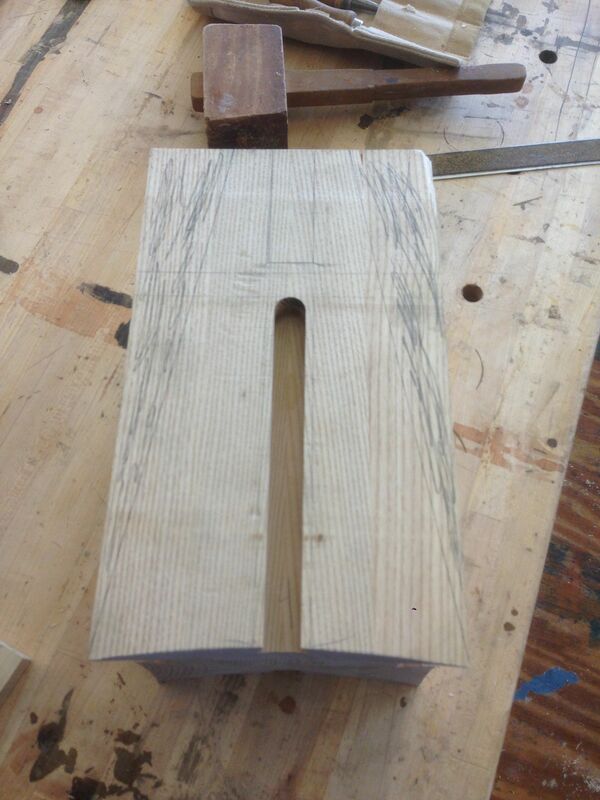 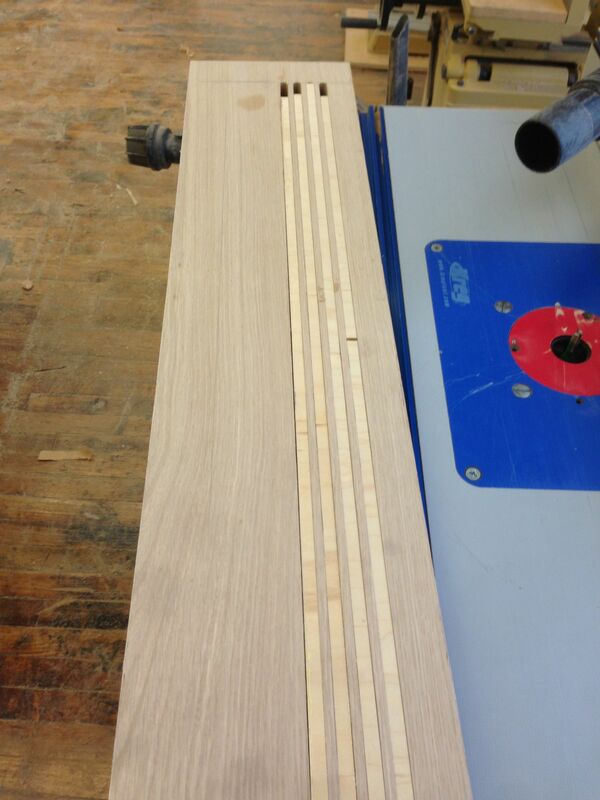 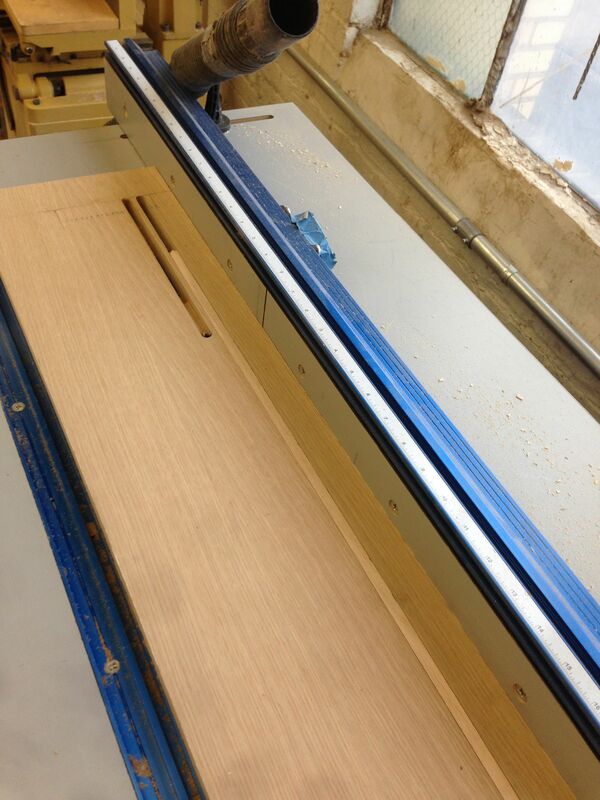 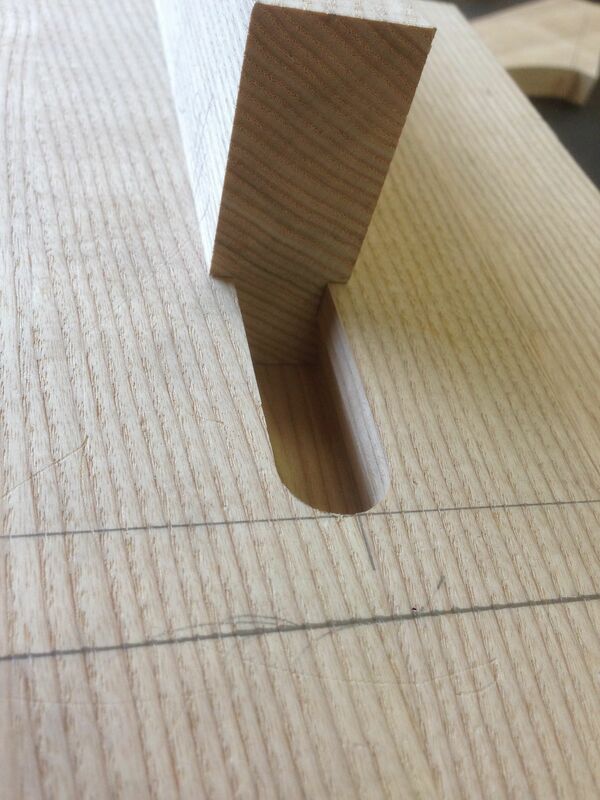 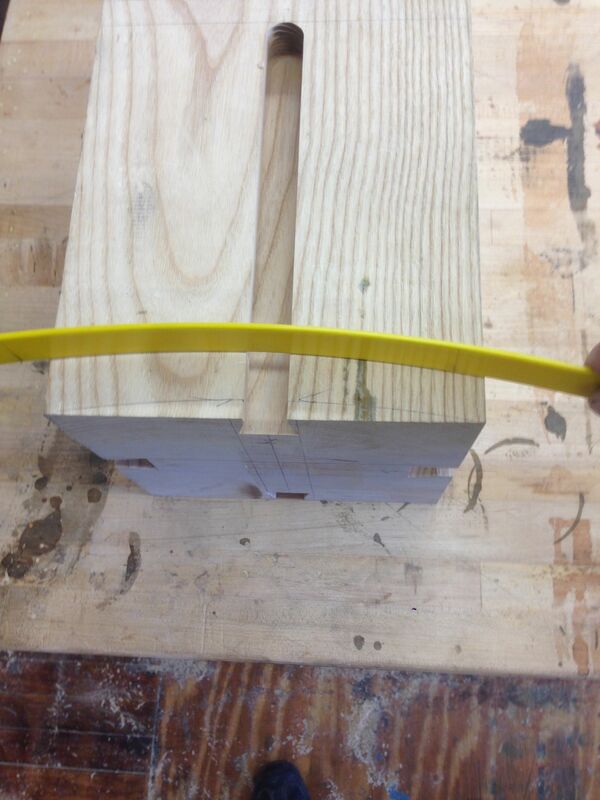 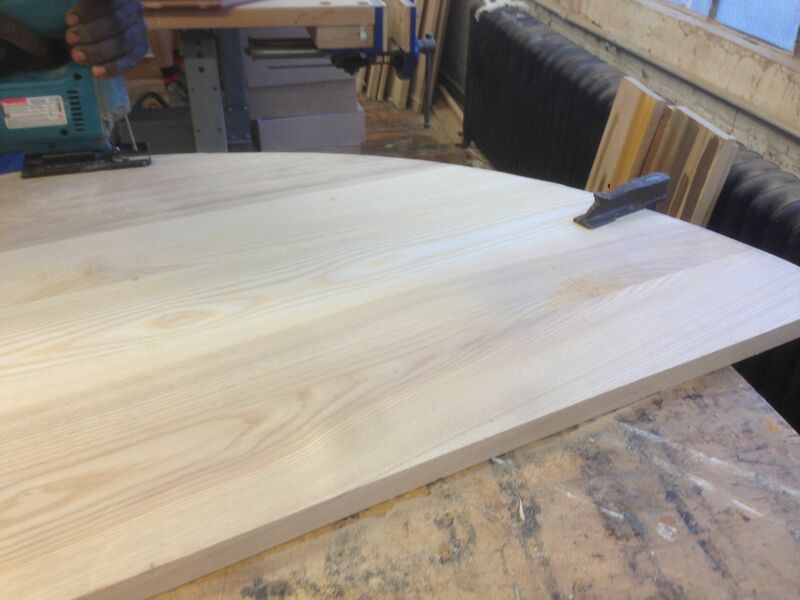 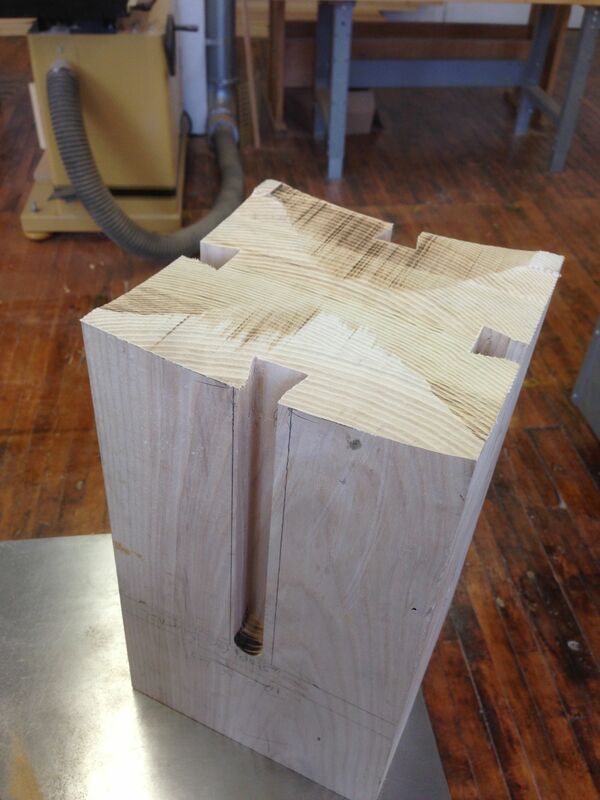 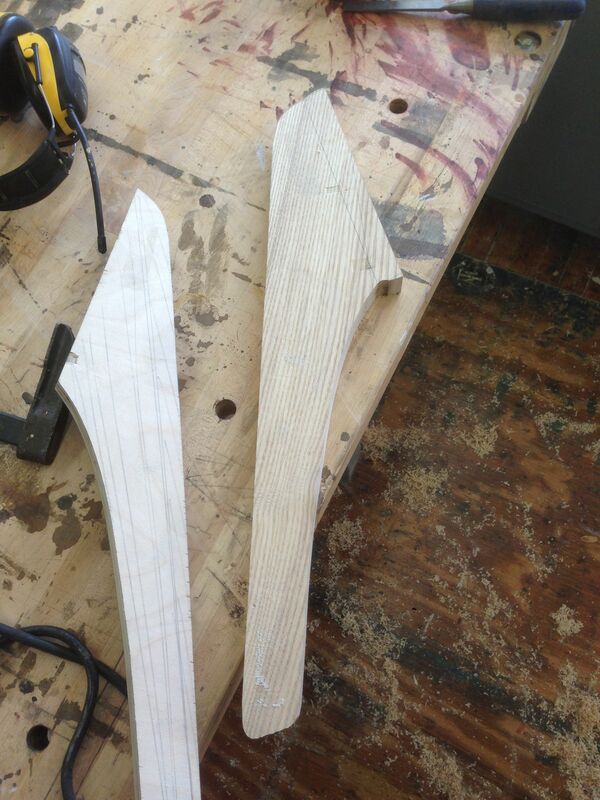 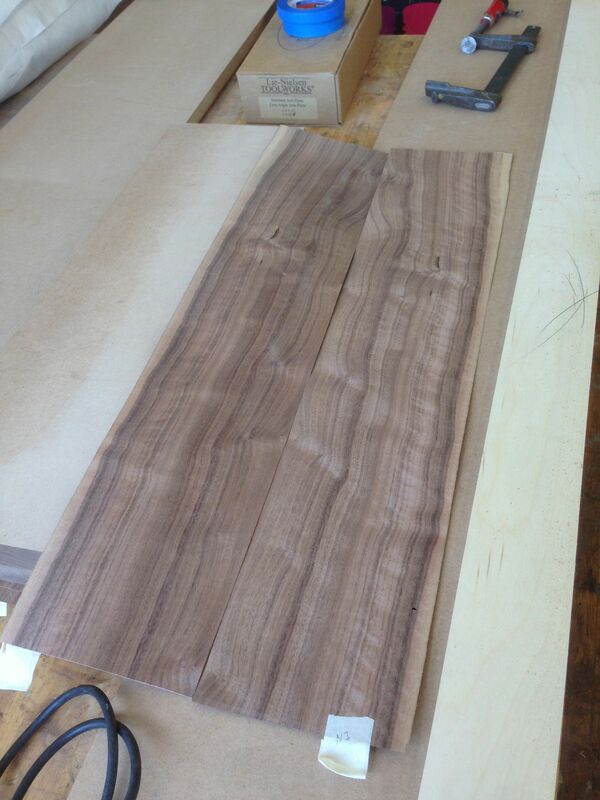 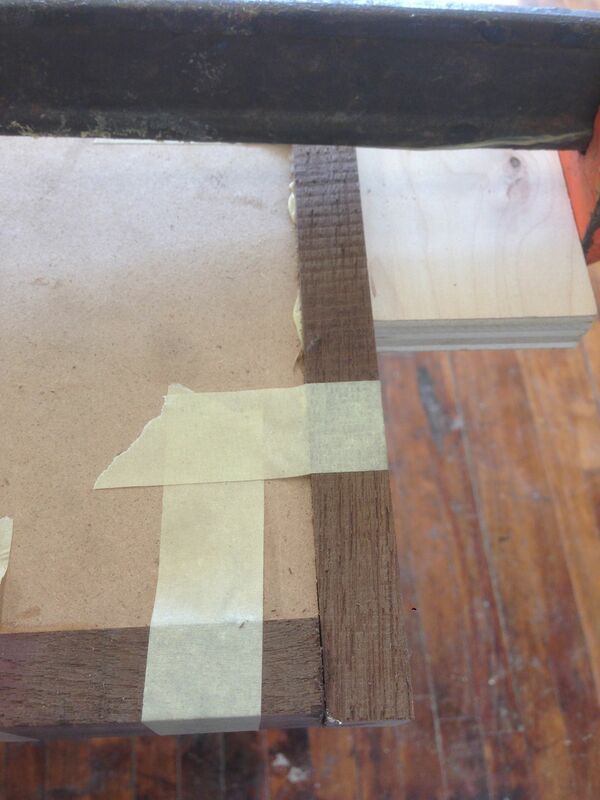 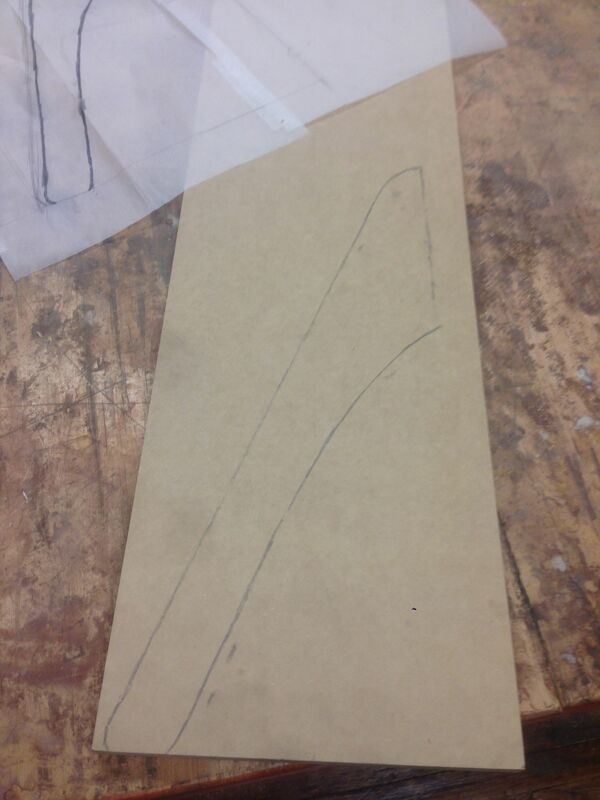 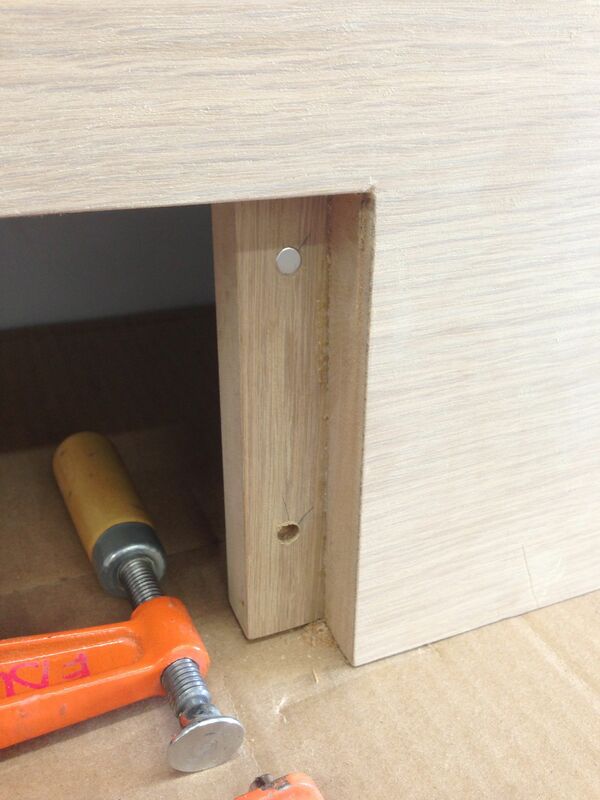 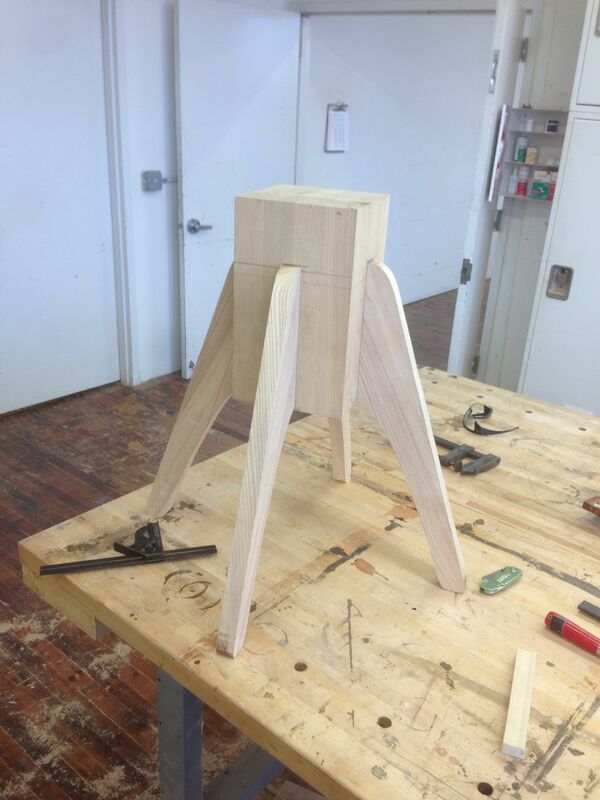 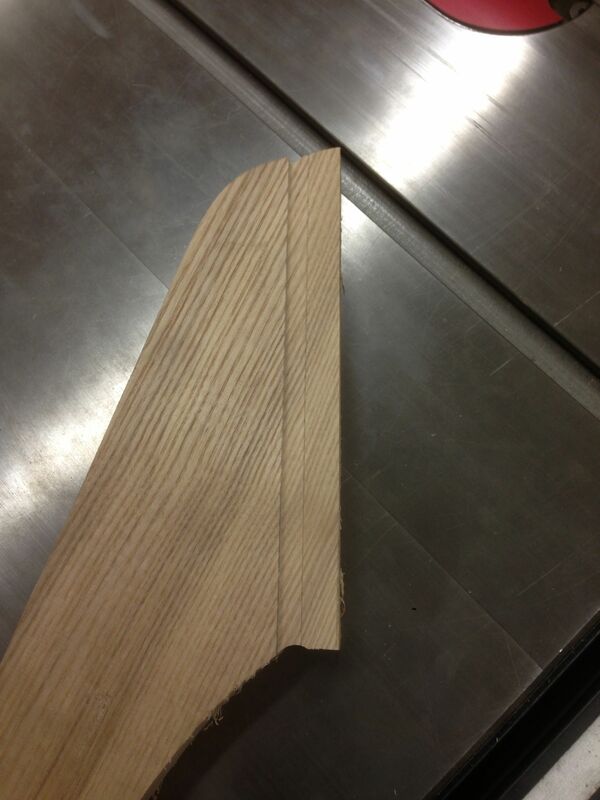 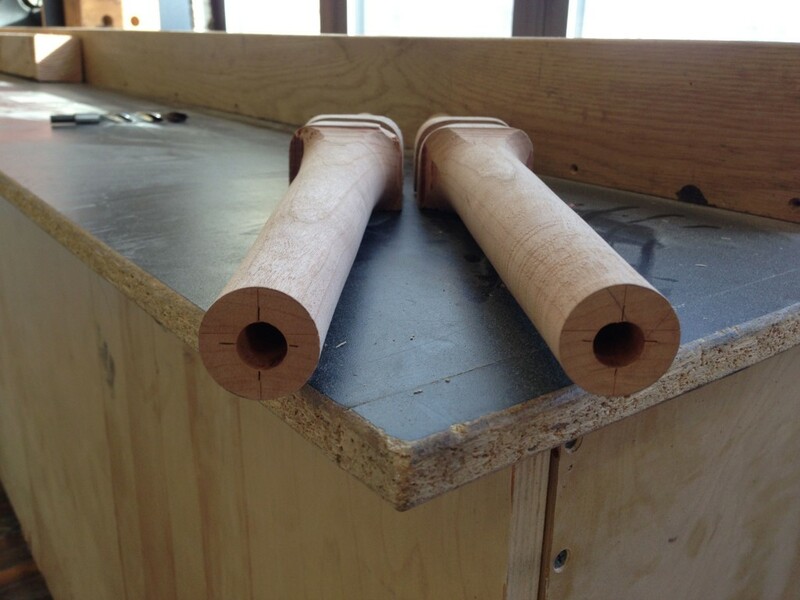 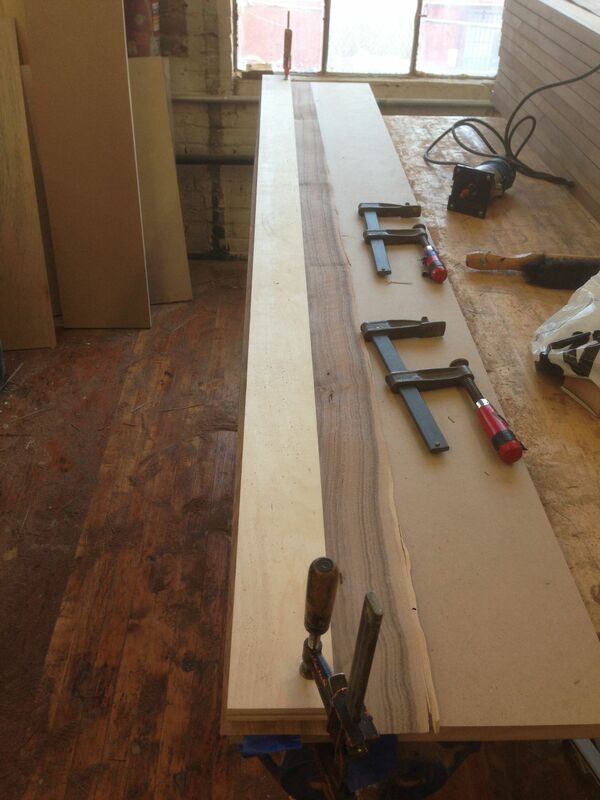 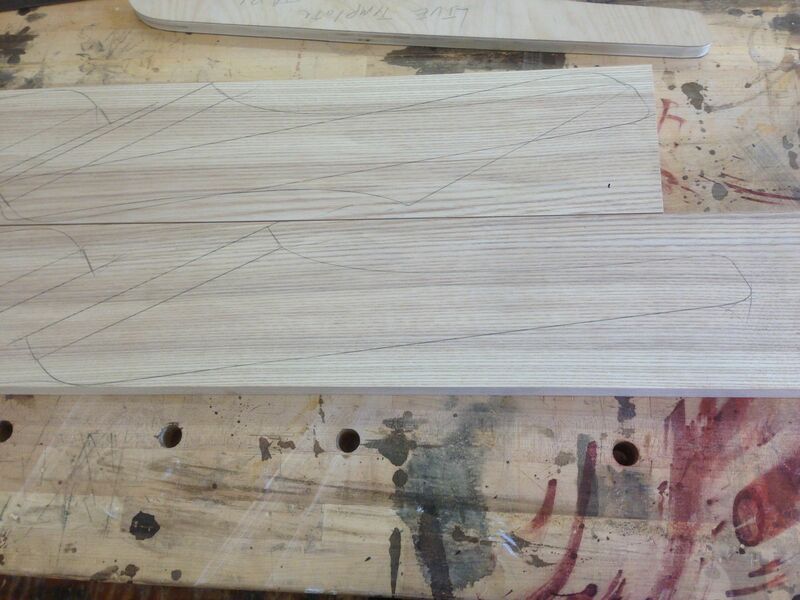 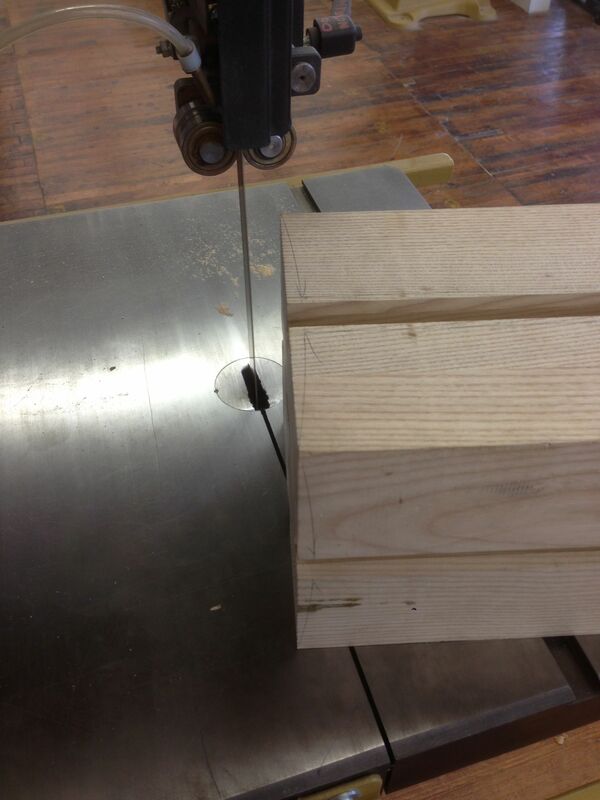 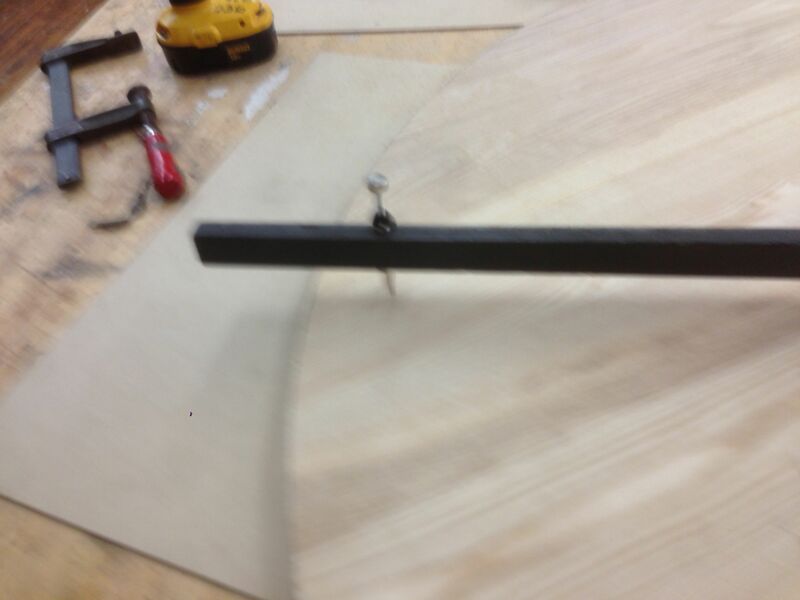 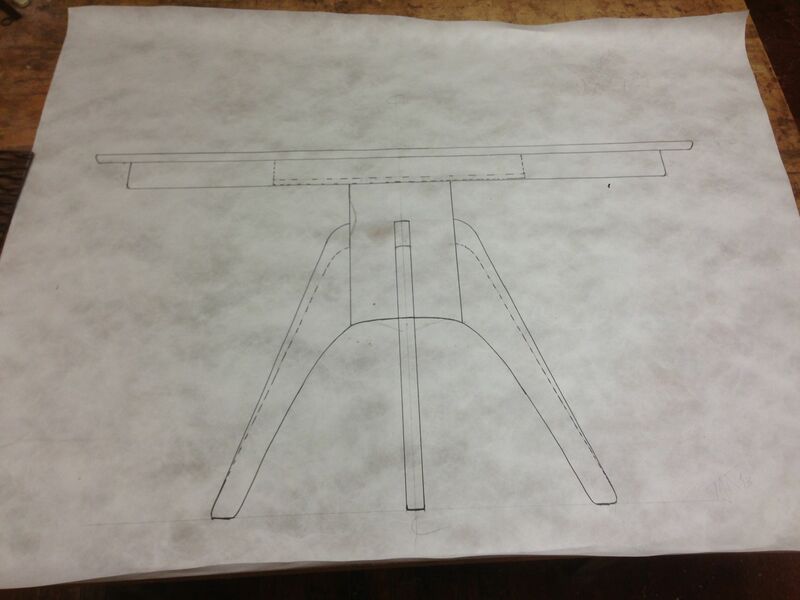 The legs are tapered from the joinery area to where they will eventually attach to the rocker and arm rest. 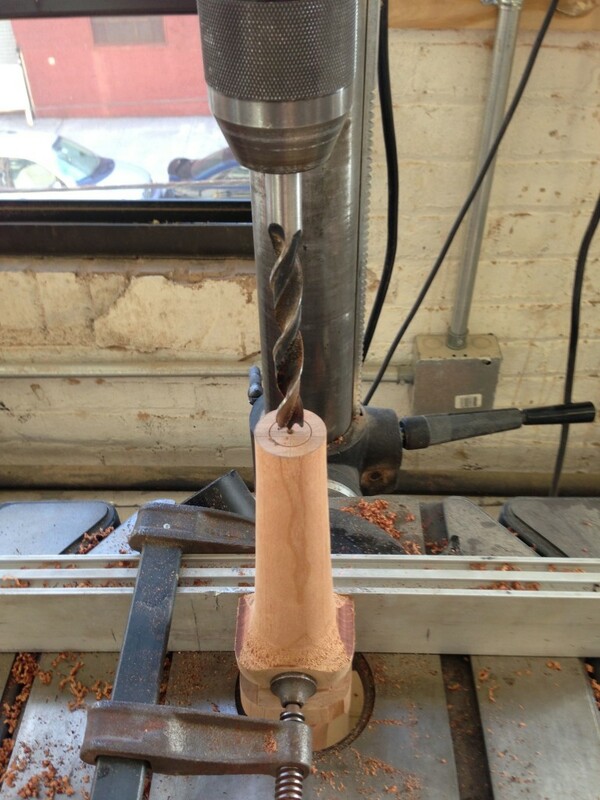 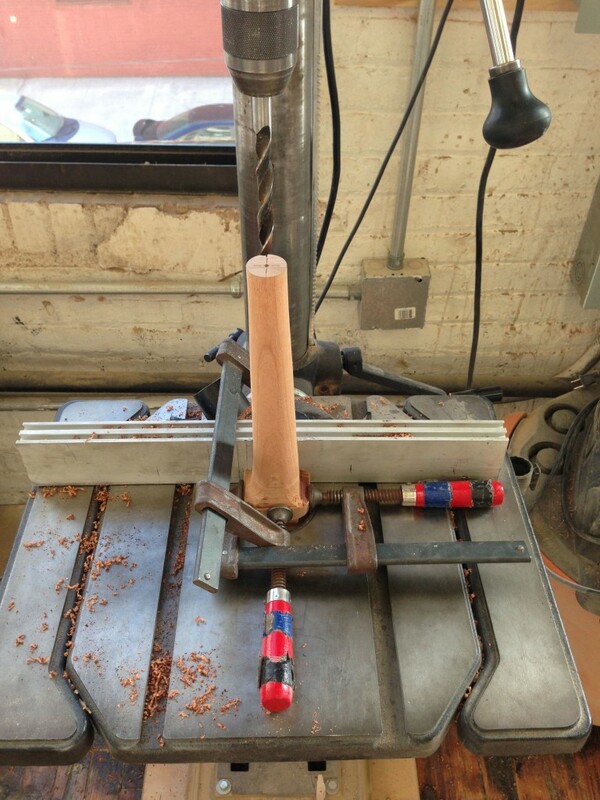 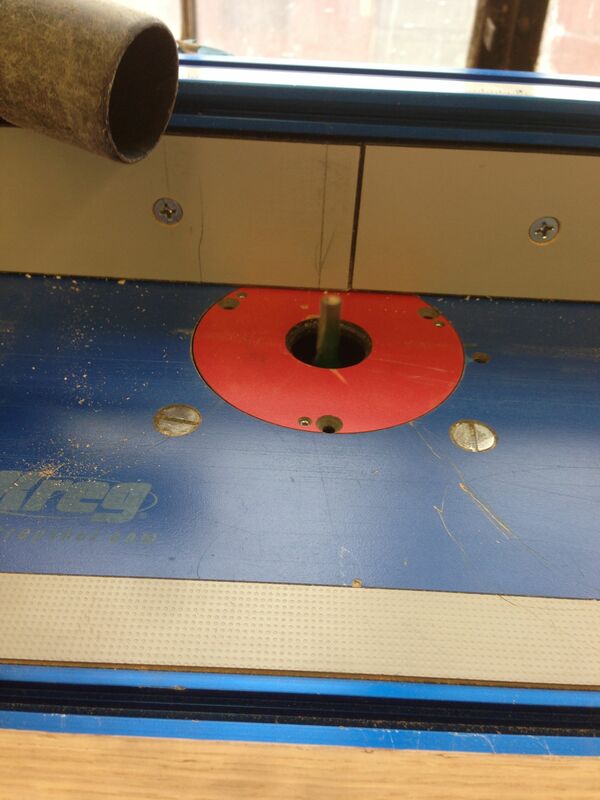 This was the first time I have been on a lathe in about seven years. 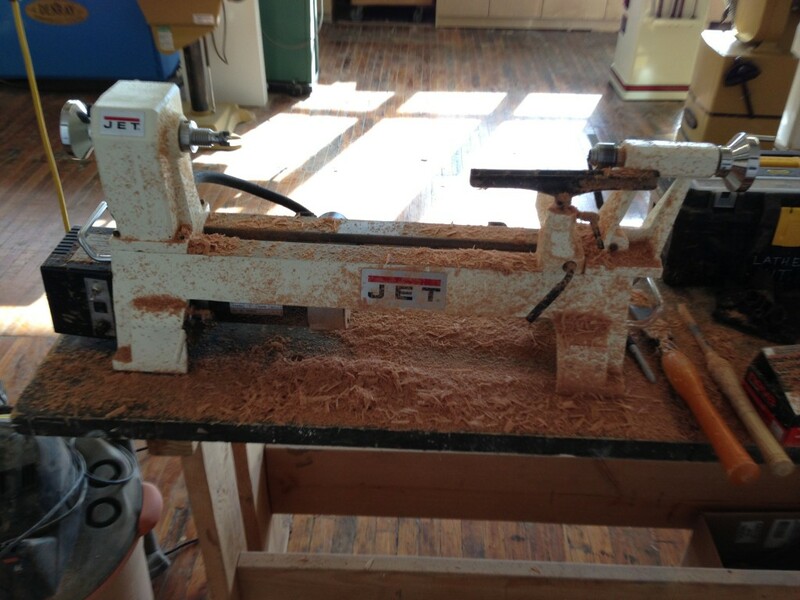 I forgot how much fun it is and what a relaxing experience it can be. 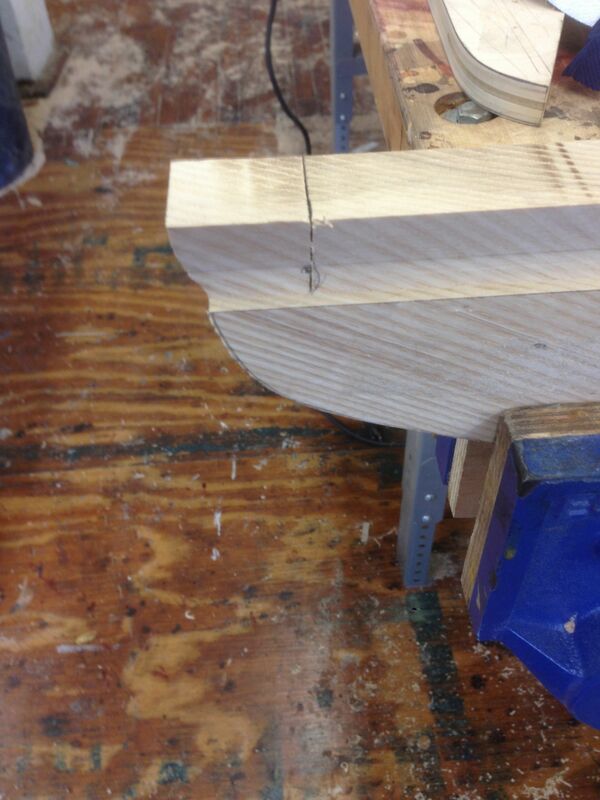 A video update will be posted above. 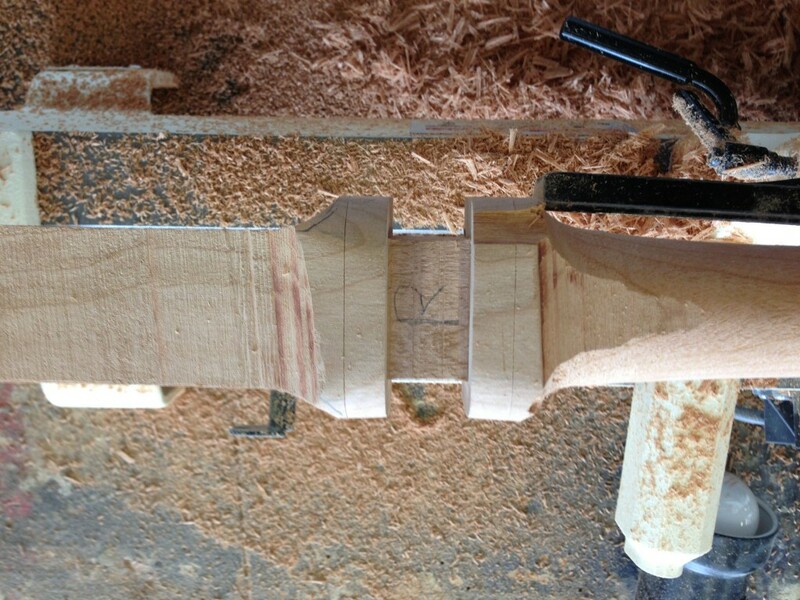 This entry was posted in Recent Work, Rocking Chair, Updates on January 22, 2013 by Matthew Mullen.